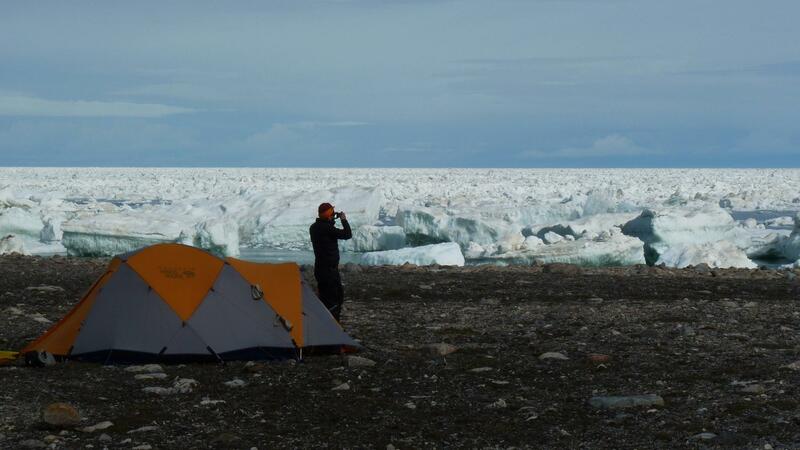 In a year that has seen Arctic ice deteriorate to the lowest levels ever, with serious worldwide implications, this year we experienced ice, the like of which we haven’t seen on any of our previous trips. 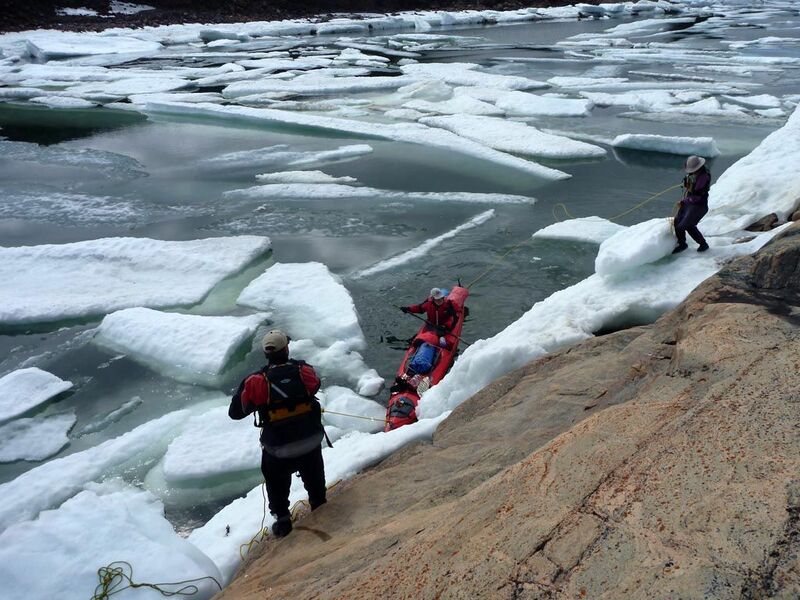 If one word could describe our trip that would be it: ice. 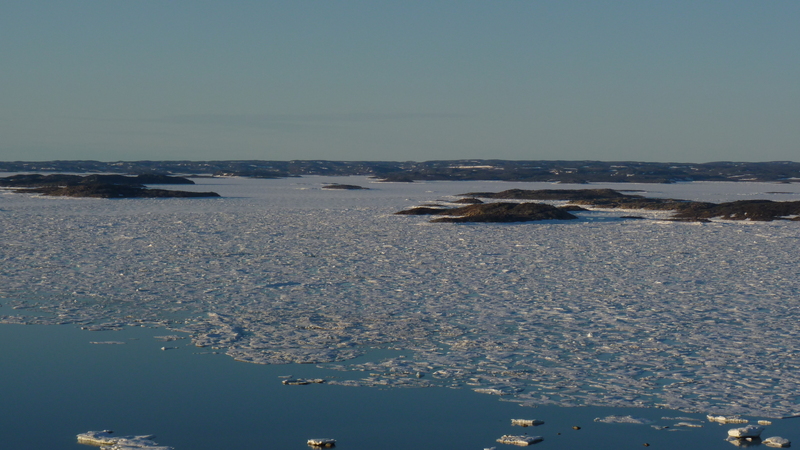 Sea ice, lake ice, even “aufeis”; solid ice, thin ice, disintegrating ice, broken ice; ice pans, ice bits, ice chunks, ice the size of houses; ice of all shapes; ice loosely packed, ice jammed together. 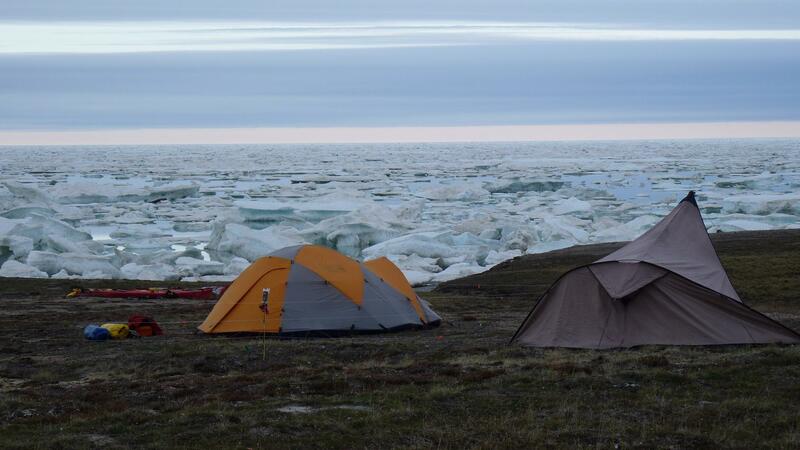 Ice at the start of the trip and ice right up to the end of the trip. 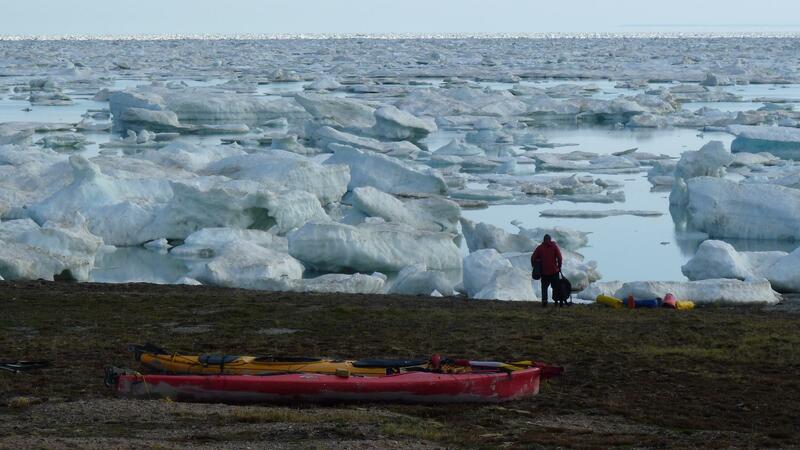 It wasn’t as if we weren’t expecting to deal with ice Last year we spent three weeks pulling the kayaks over the ice, utilizing shore leads here and there, before being able to paddle unhindered. 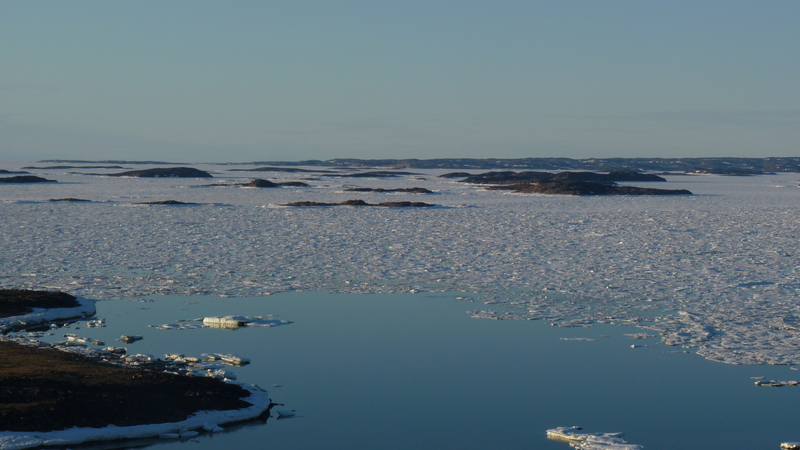 This year, we knew that ice conditions would probably be more “interesting” owing to high tides and strong currents in the region. 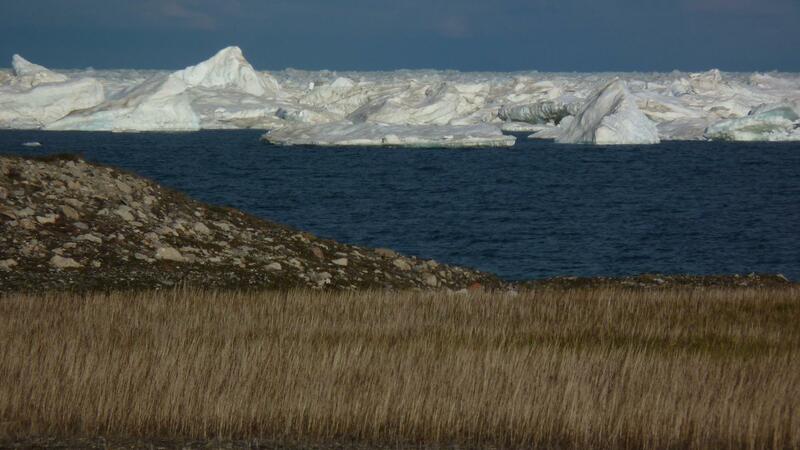 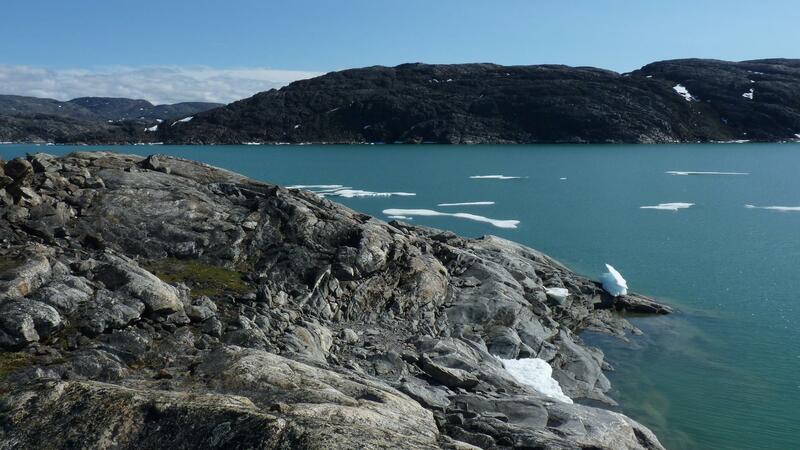 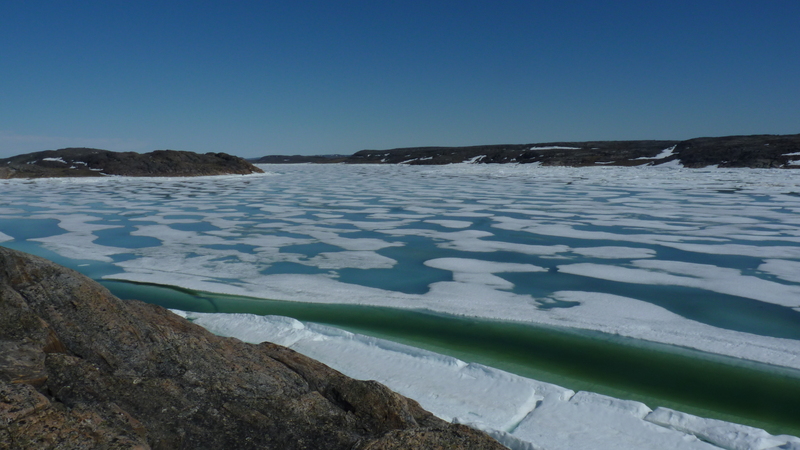 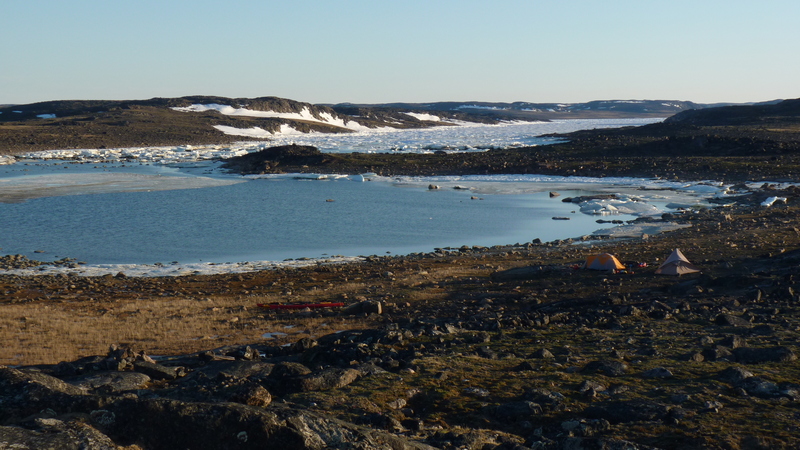 We started the trip near the end of June, knowing that ice breakup wouldn’t come until a few weeks later. 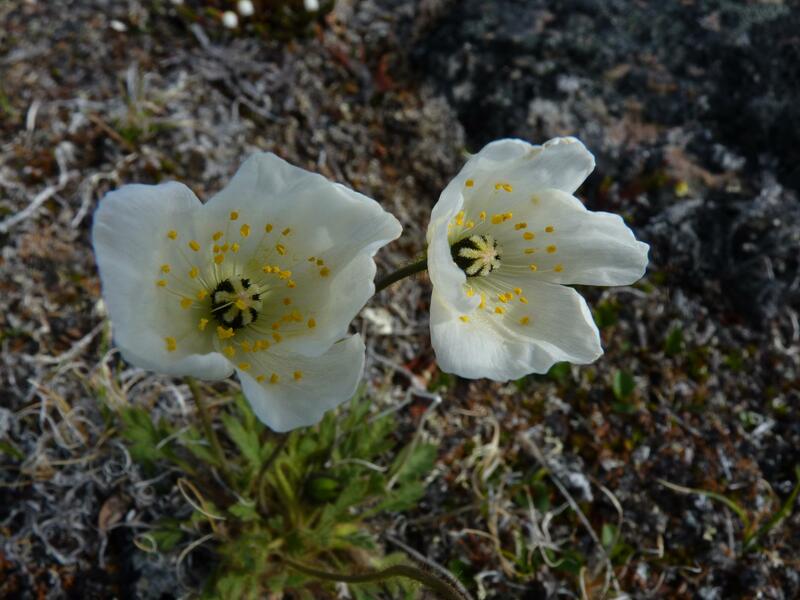 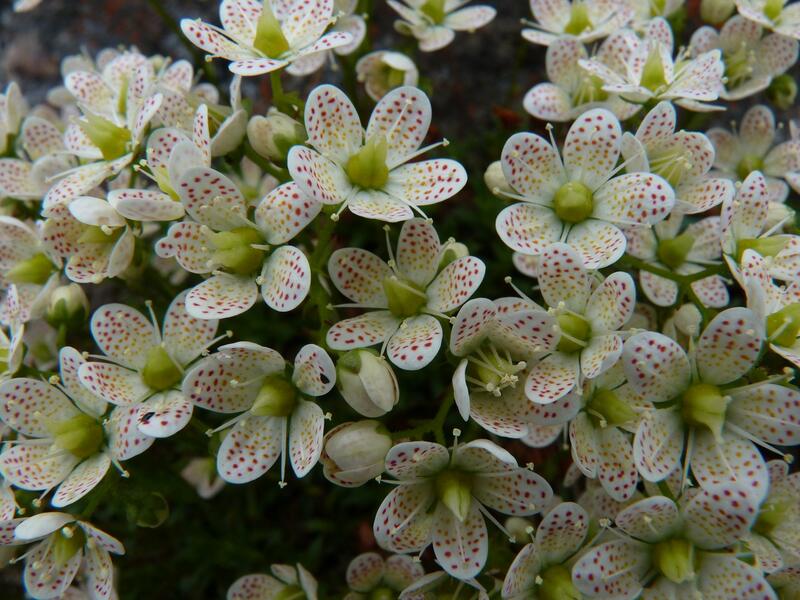 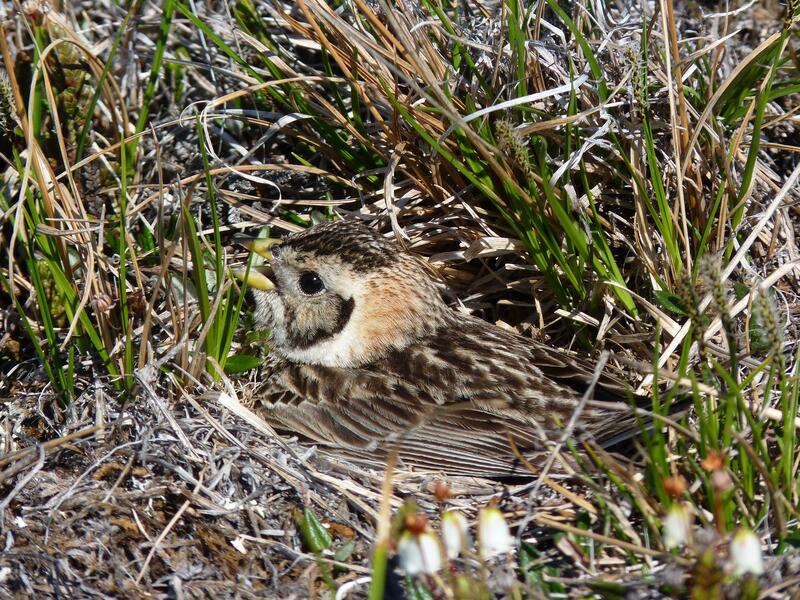 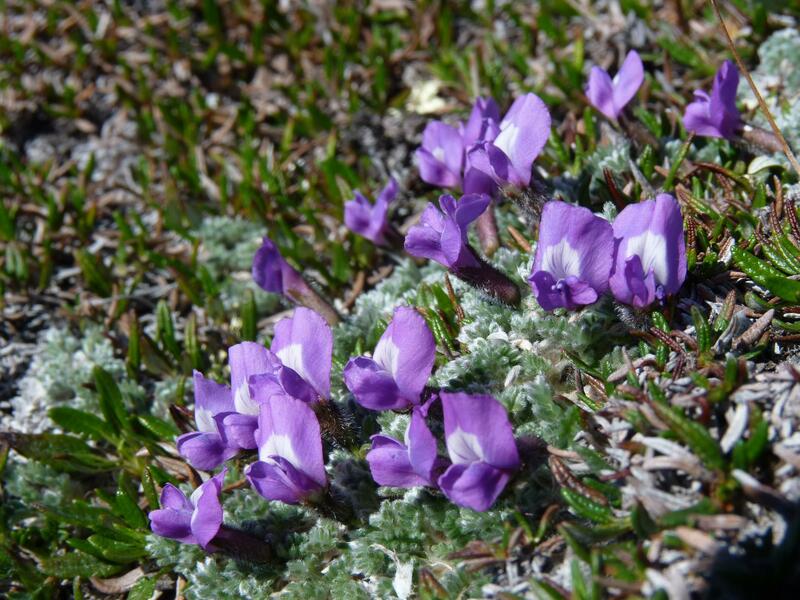 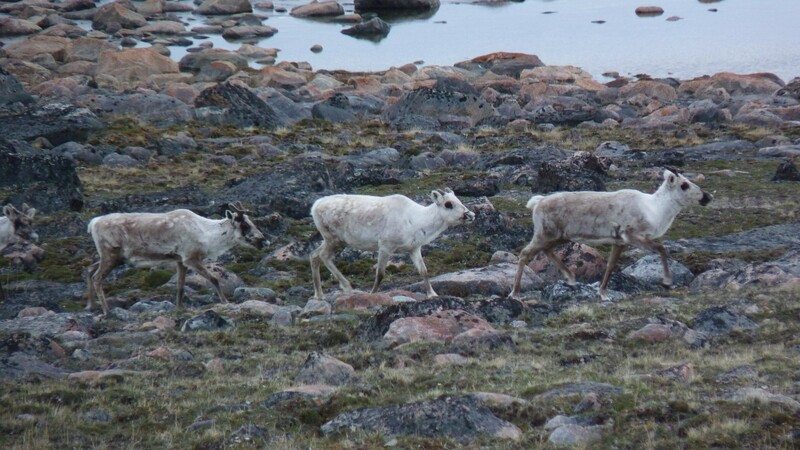 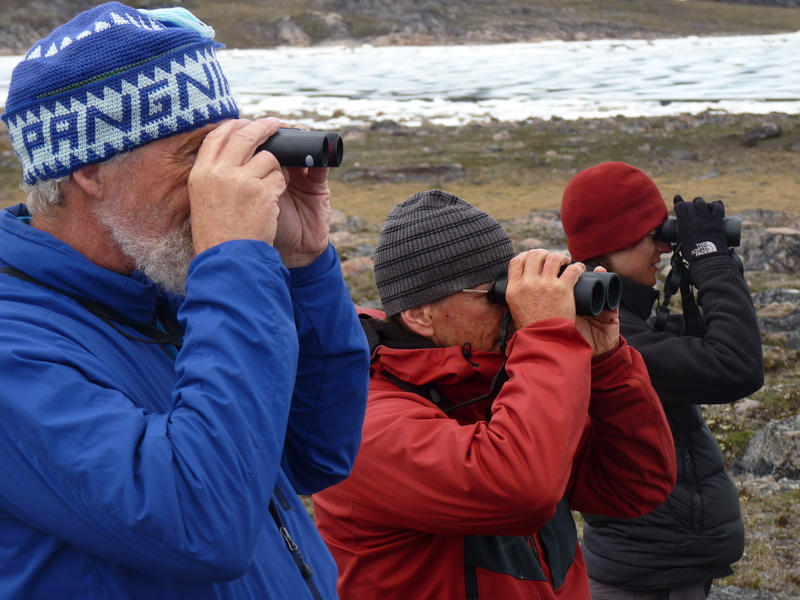 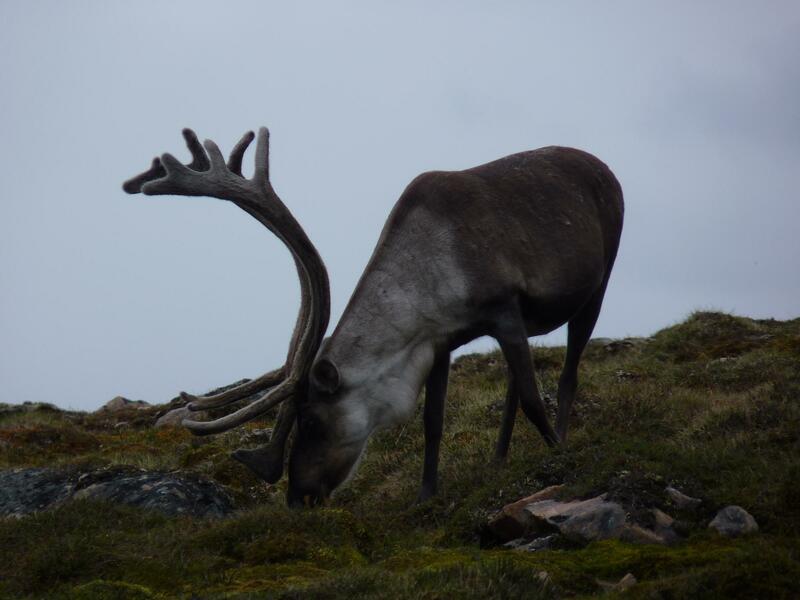 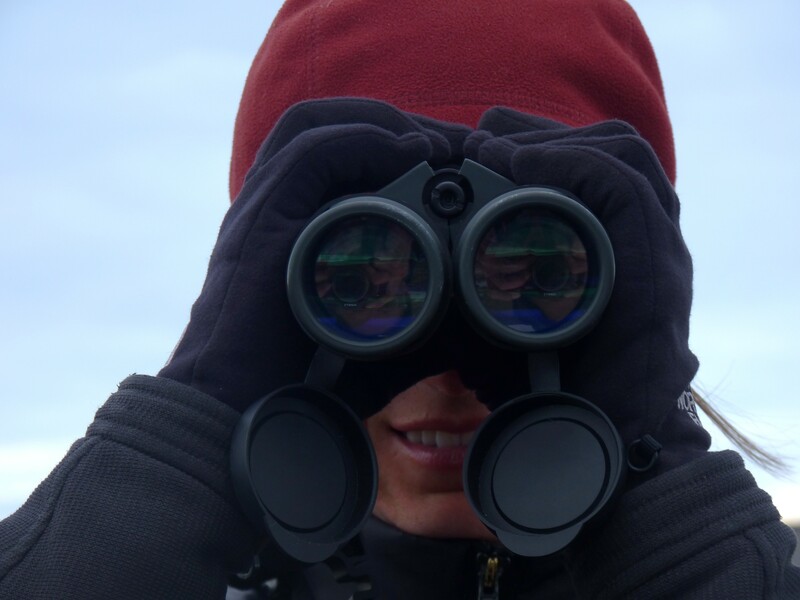 In June and July the Arctic is alive with activity – birds arriving from the south to breed, flowers blooming, Arctic char migrating from lakes to the ocean, caribou arriving on their summer grounds – and we wanted to experience this. 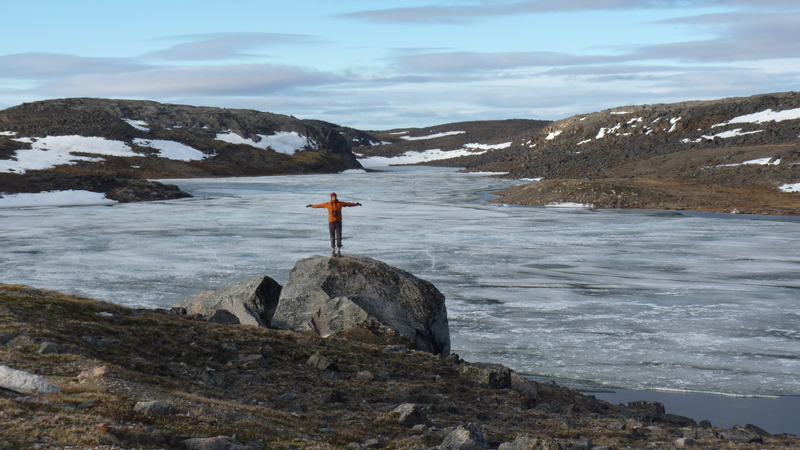 We could have left in August and rushed as fast as we could, and perhaps missed the ice, but by then autumn would have arrived in the Arctic. 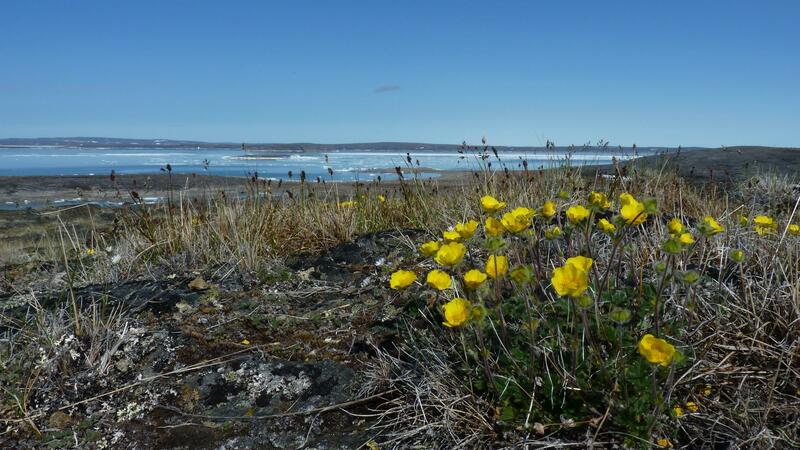 Flowers would have already gone to seed, and many of the birds would have already headed south. 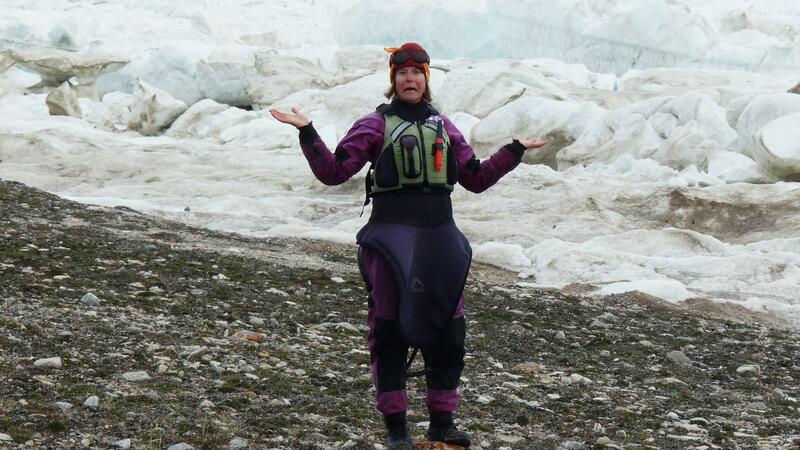 And besides, speed has never been our objective. 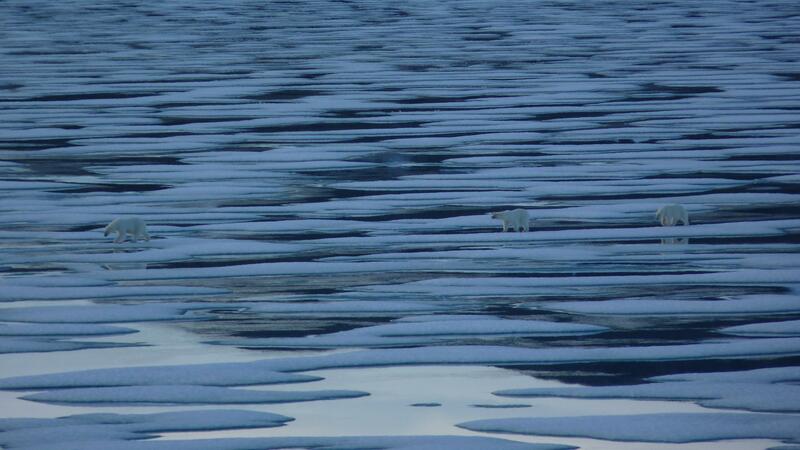 It was the Arctic we came to see, not to be the first or fastest. 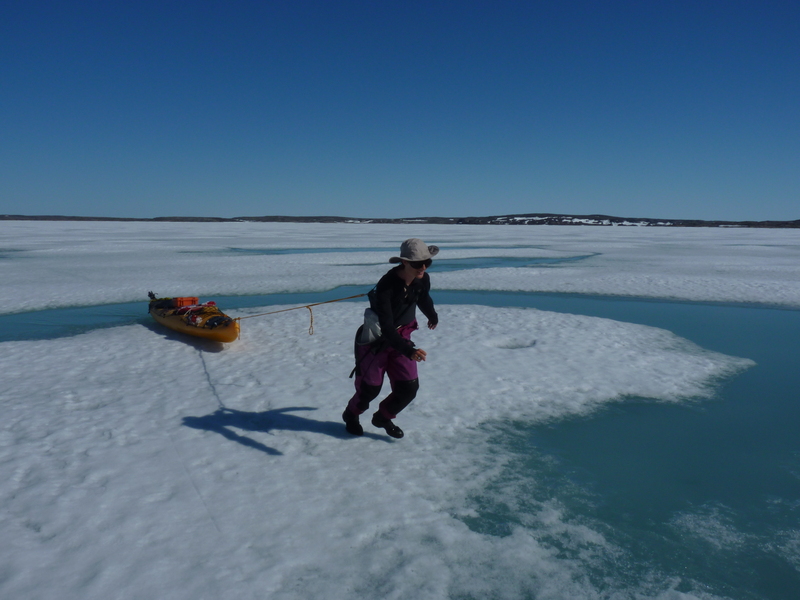 Still, we imagined that by the time we reached the top of the Simpson Peninsula, any ice problems would probably have largely disappeared. 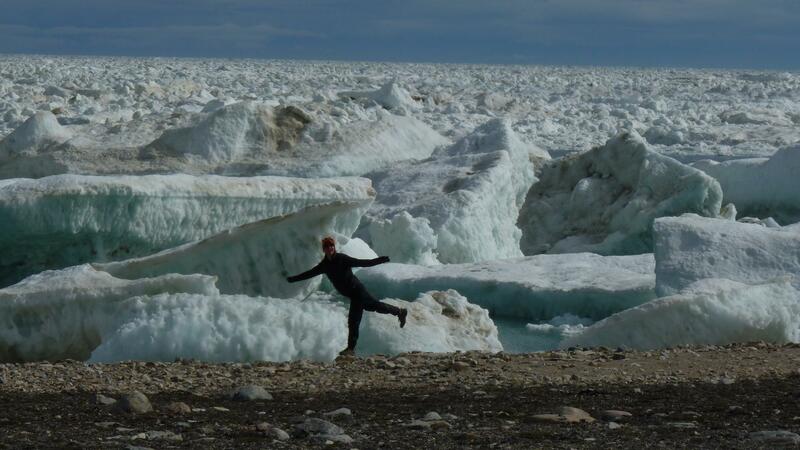 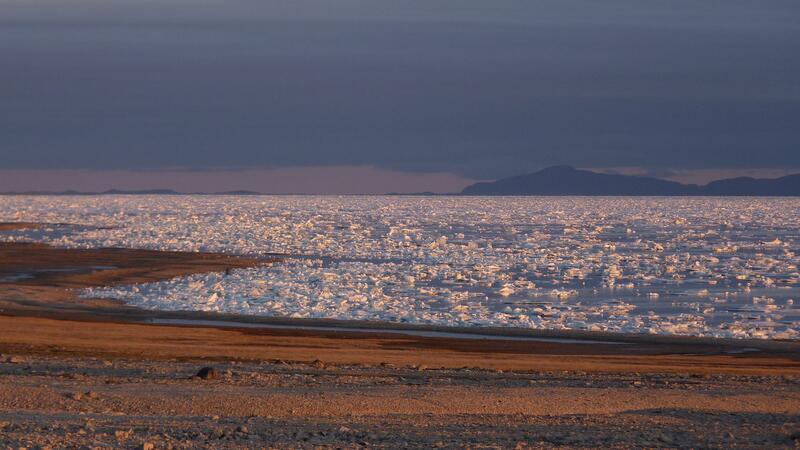 And certainly, that there wouldn’t be any ice by the time we reached Repulse Bay in mid-August. 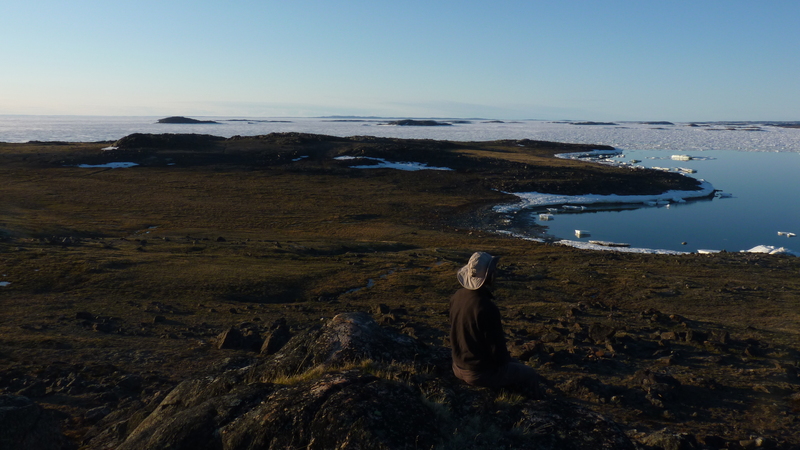 Talking with the hunters and (especially) some of the elders, we probably should have got the hint that it wouldn’t be easy going around the Simpson Peninsula. 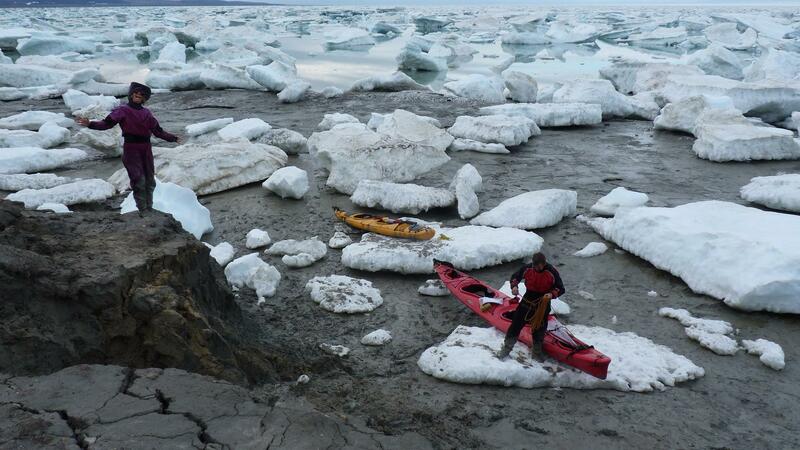 When we asked about conditions around the peninsula, everyone said they never go that far – “too icy”. 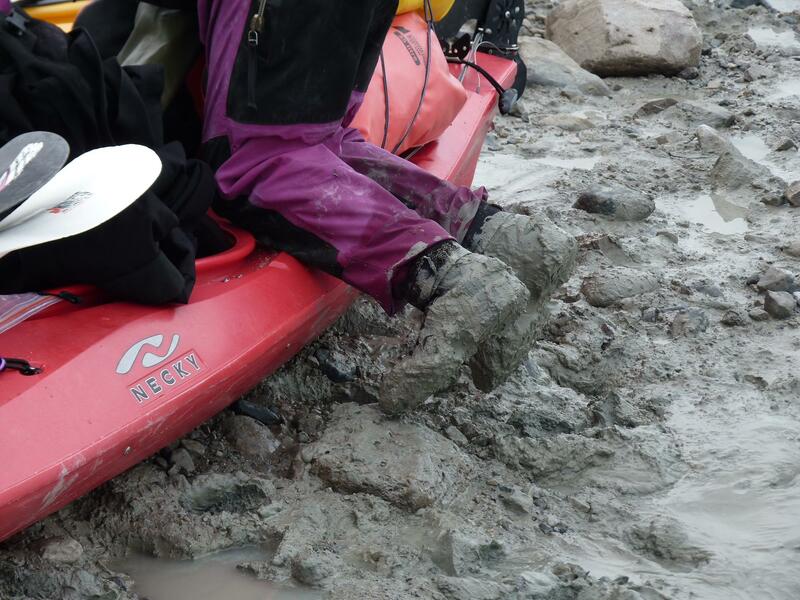 We were soon to learn this for ourselves. 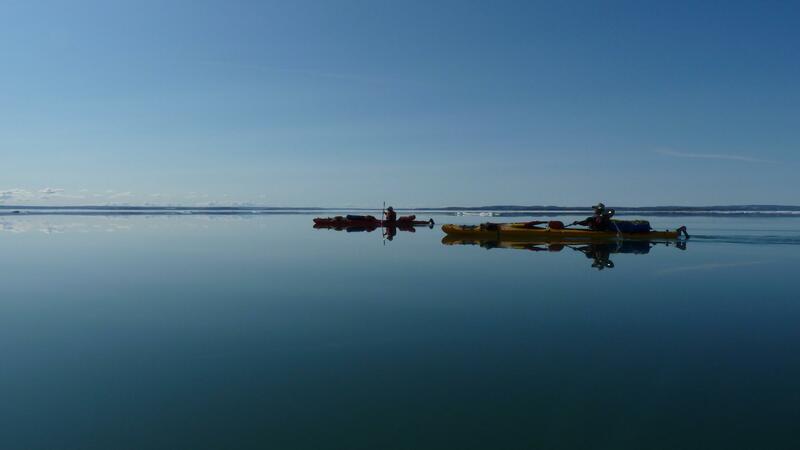 The second day after leaving Kugaaruk we were back into the ice, at first only here and there and beautiful to paddle through, with blocks of all sizes and shapes and with the sun glinting brightly off them. 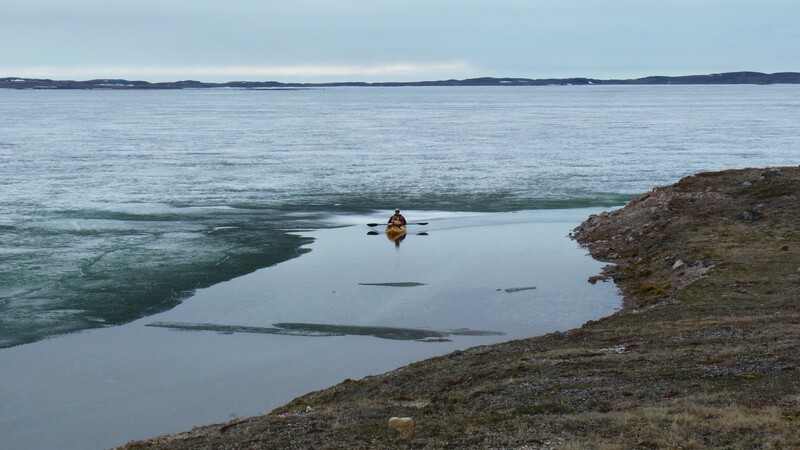 But by lunchtime, the ice had become almost impossible to paddle through and we spent the remainder of the day threading our way slowly around the pieces, eventually finding open water behind the larger blocks of ice that hid our view ahead. 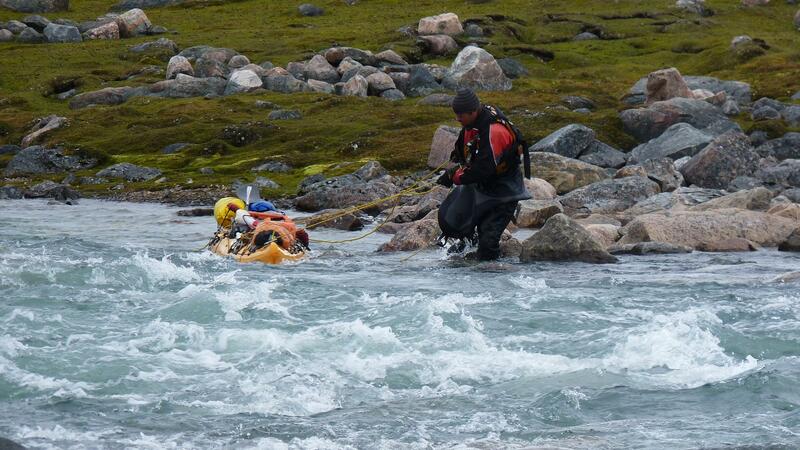 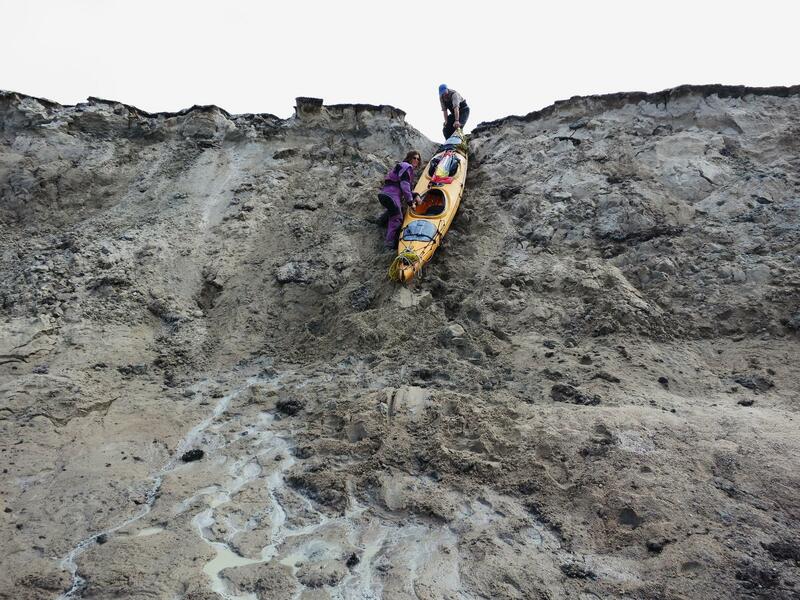 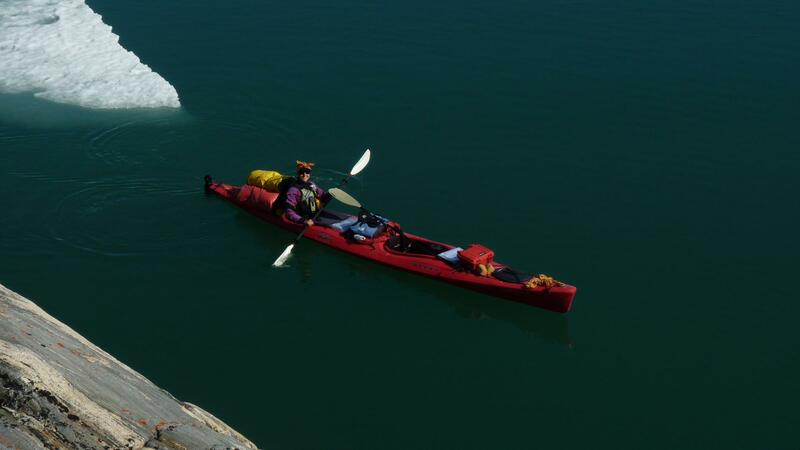 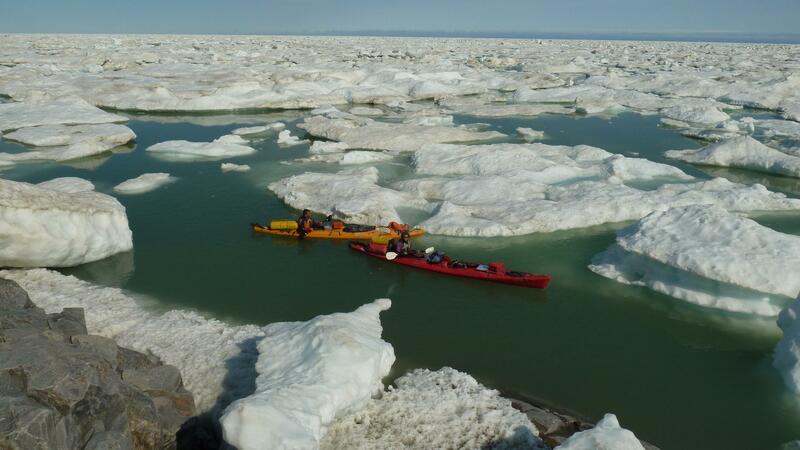 The next day, there were times we had to pull the kayaks over ice pans to reach open water, or to portage around areas that were completely obstructed. 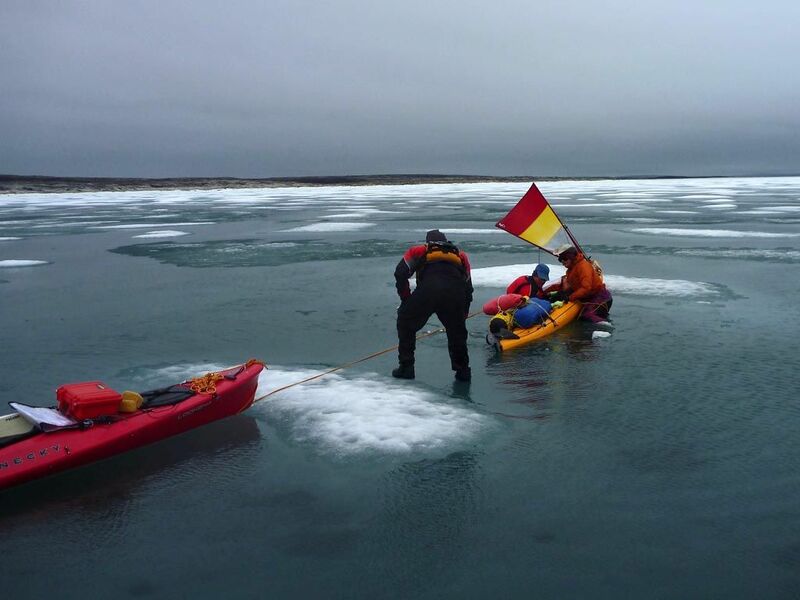 At Cape Chapman, the top of the peninsula, we were completely stopped by ice and had to wait for two days until the right tide and conditions allowed us to get around the ice. 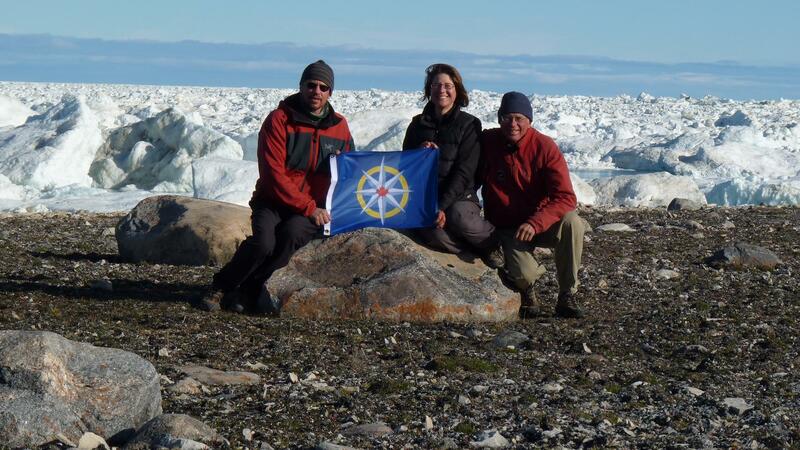 For the first time since we began our journey six years ago, we began to wonder if would be able to finish the trip. 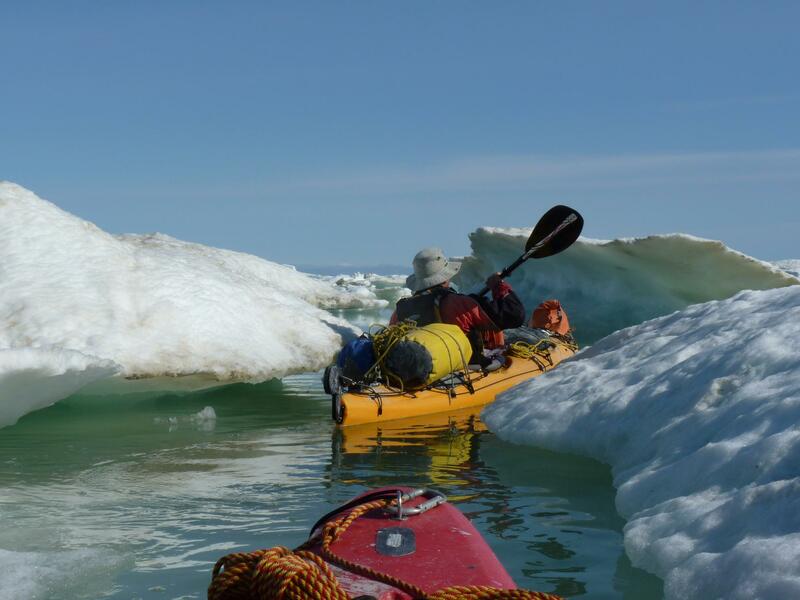 However, our spirits rose when we made it past Cape Chapman and were able to paddle continuously, with ice threatening us on our left and the rather barren Simpson Peninsula on our right – until the end of the day when we once again stopped by ice. 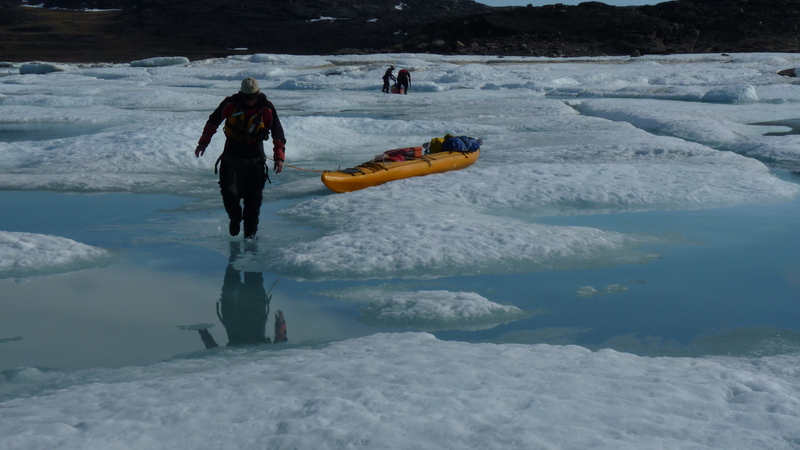 By now we had determined that if we left on the high-high tide we would be able to work our way through the ice, which always became more congested at points of land. 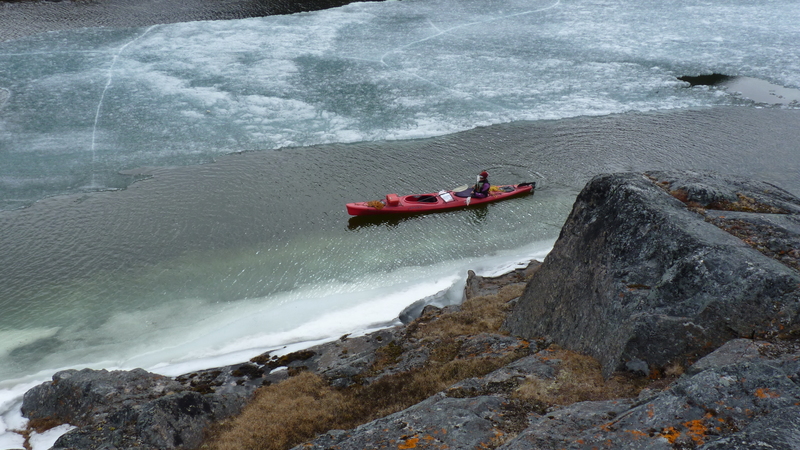 This seemed to be the pattern – being stopped by ice at a point, waiting for the right tide and working our way through. 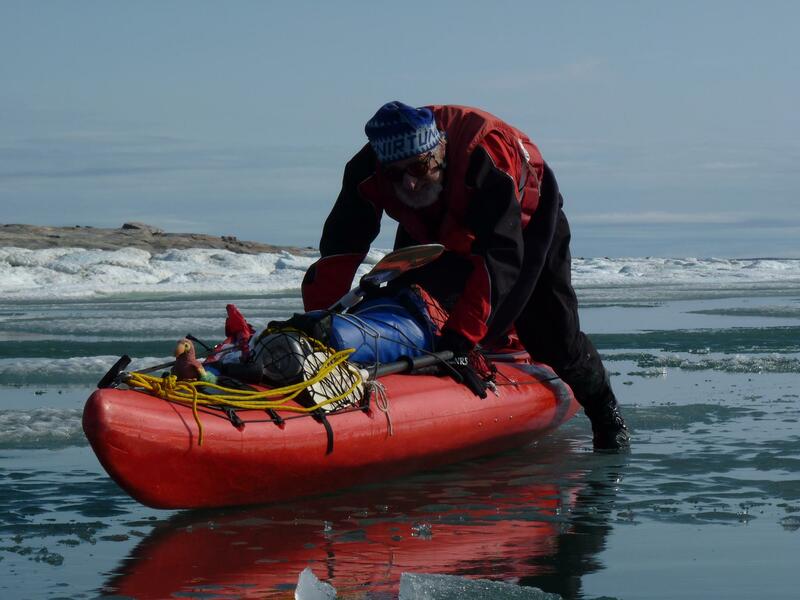 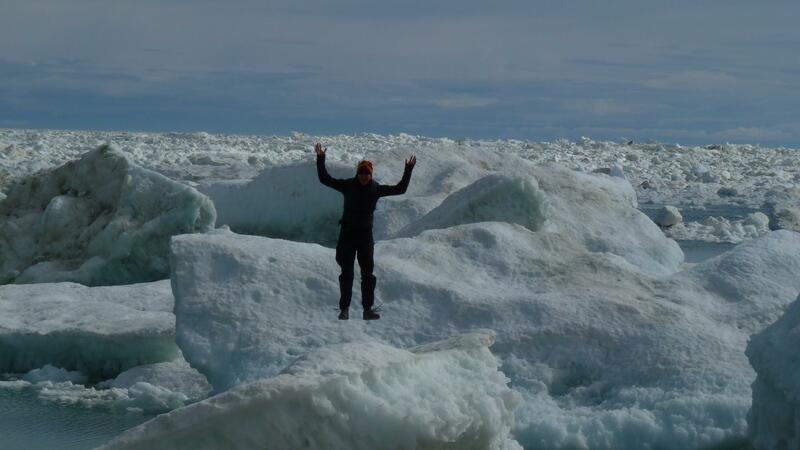 The night after leaving Cape Chapman, Chris spoke by satellite phone with his wife, Elisa, and told her we perhaps had another 40 kms before we would be completely free of ice. 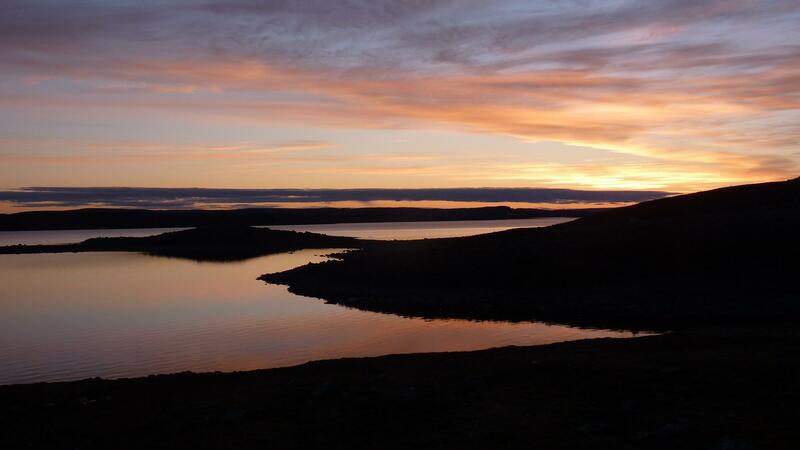 However, as the saying goes, “Man proposes, God disposes”. 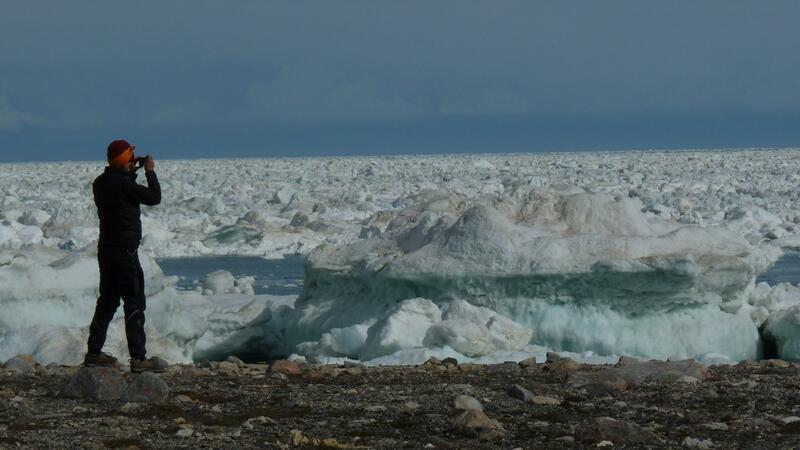 A couple of days later, at Clauston Points, we were completely stopped by a wall of ice pressed hard against the shore as far as we could see. 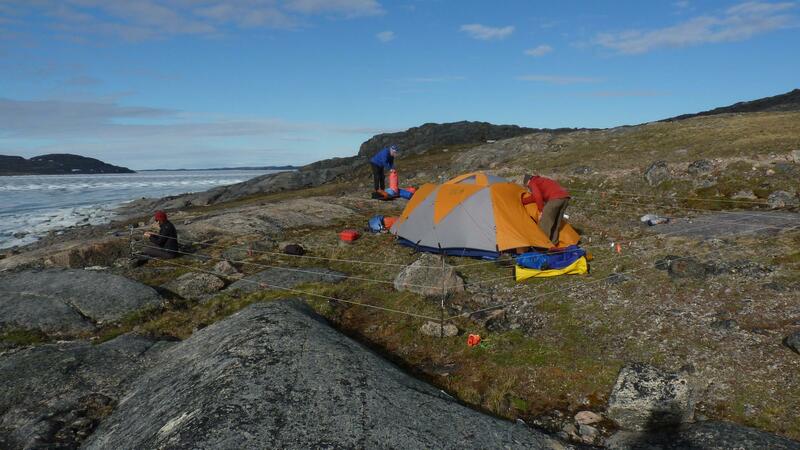 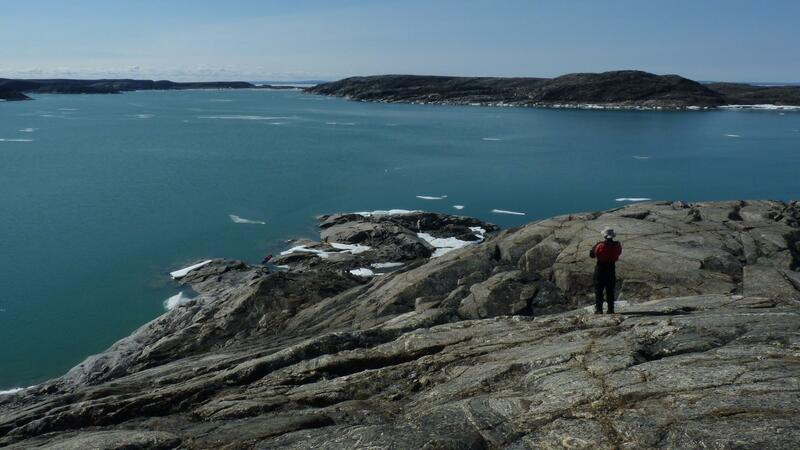 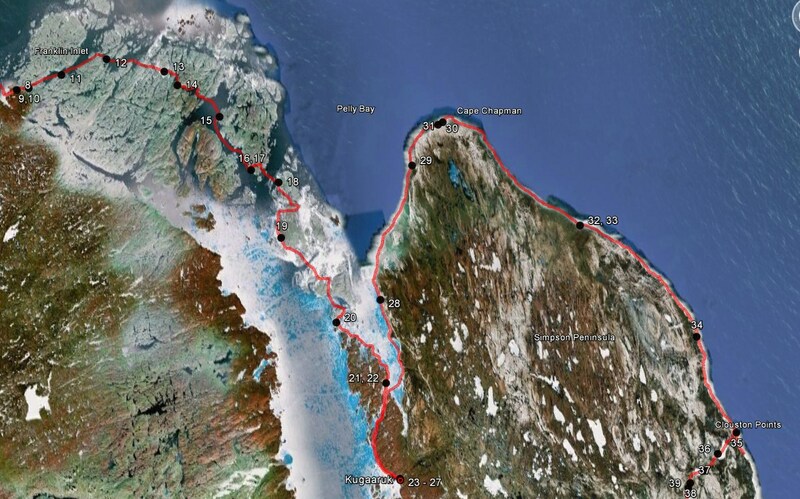 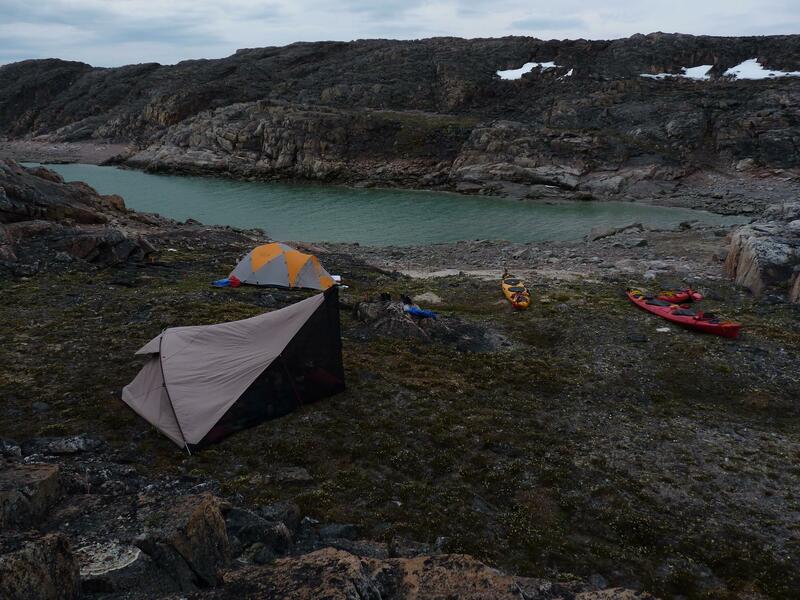 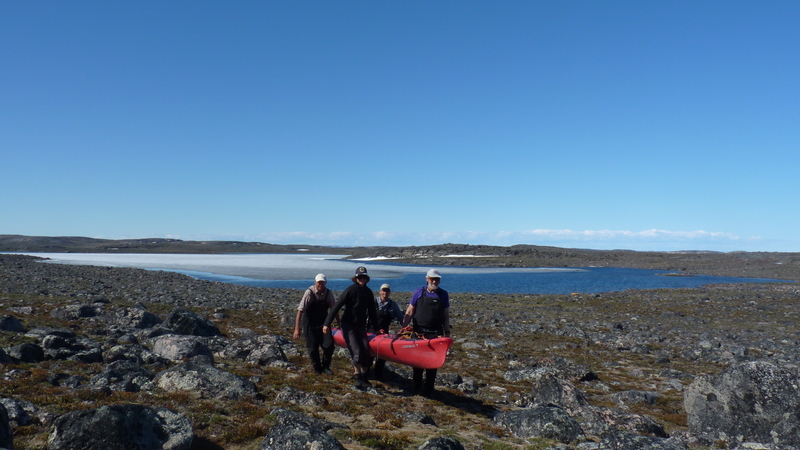 We agreed to give it a try at the next high-high tide and if not able to continue beyond a few kms we would return to our camp and portage 20 kms to Keith Bay. 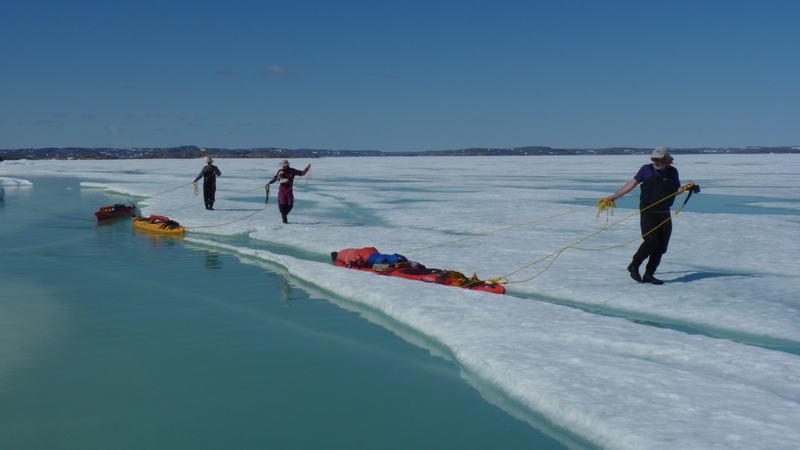 The next morning we were away early, but were stopped by ice less than five kms from our campsite. 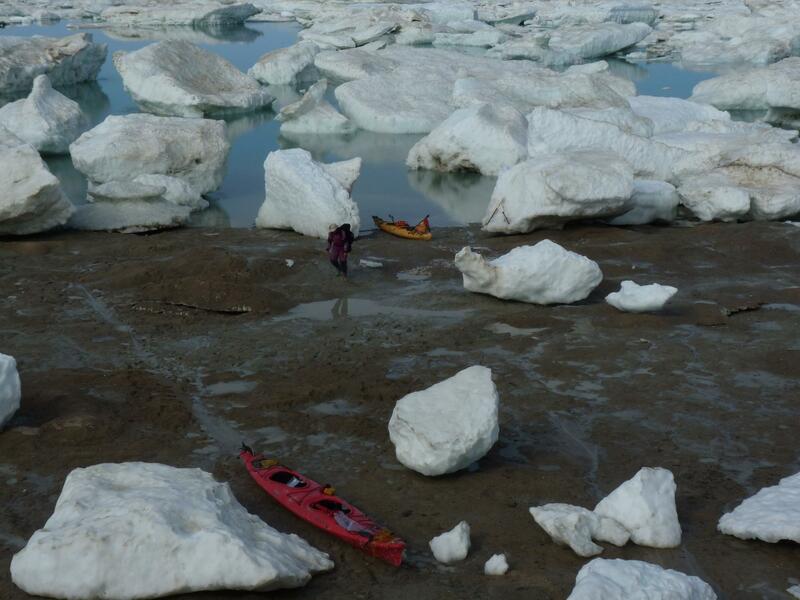 We immediately turned around, as the tide was now beginning to ebb and our route back through the ice was quickly closing and in danger of becoming completely blocked. 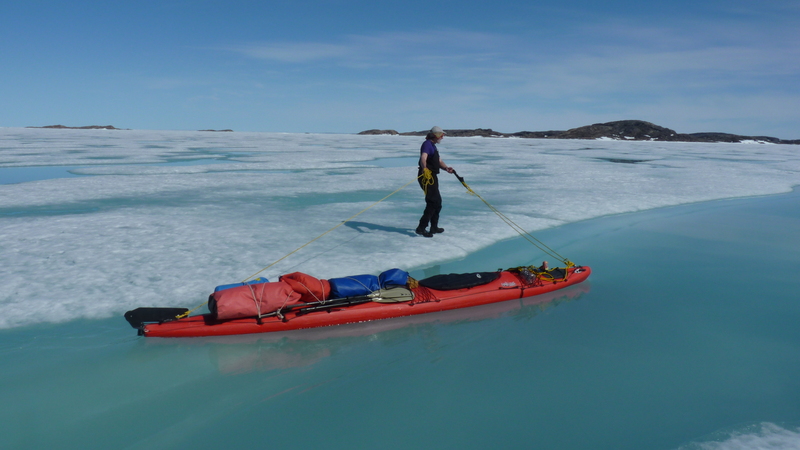 In a way, we were lucky to have been stopped here rather than anywhere else, as there was a series of ponds and lakes we could use to portage to Keith Bay, the only place where we could have done this. 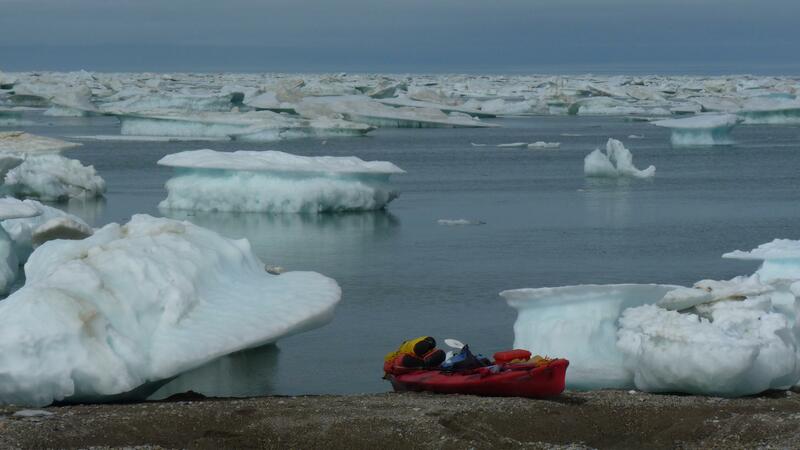 At any rate it was a nice change of pace and scenery to be away from the ice and the constant frustration of thinking we were finally free of the ice only to be stopped once again – even if portaging isn’t everyone’s cup of tea. 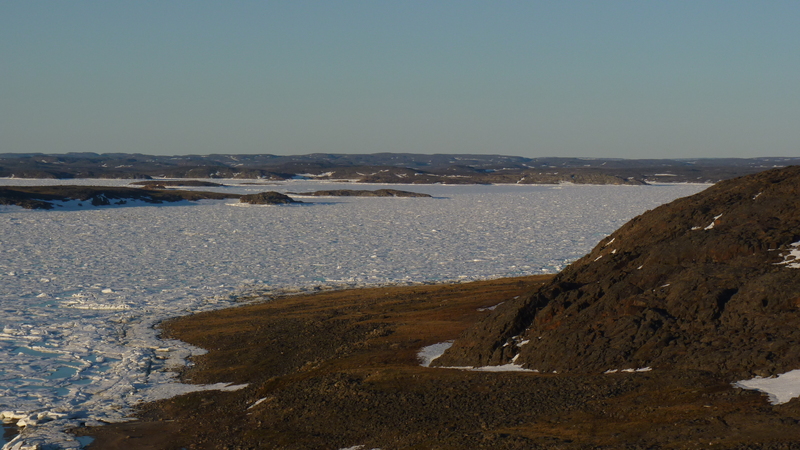 And there was always the hope that surely, the ice will have disappeared that far south into Committee Bay. 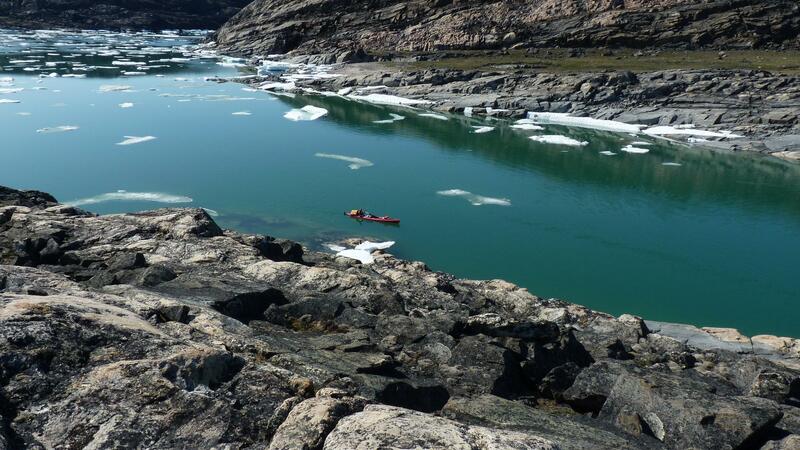 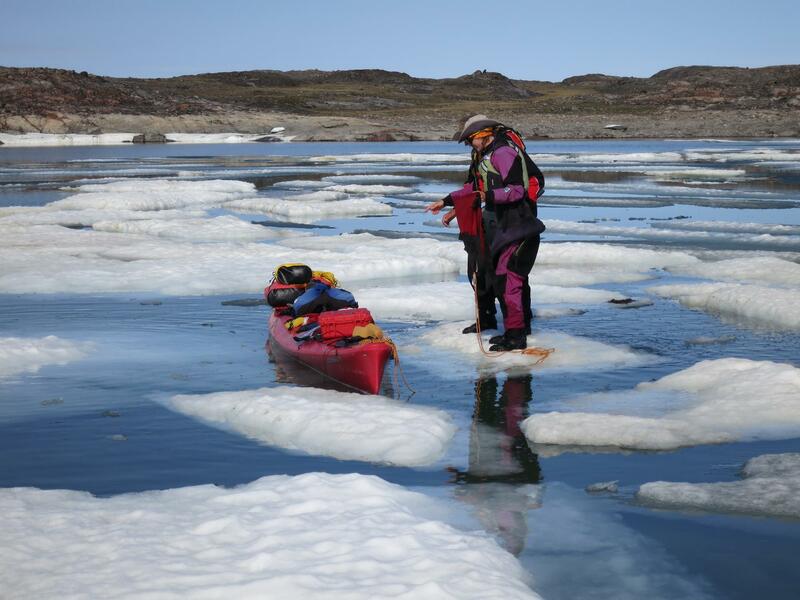 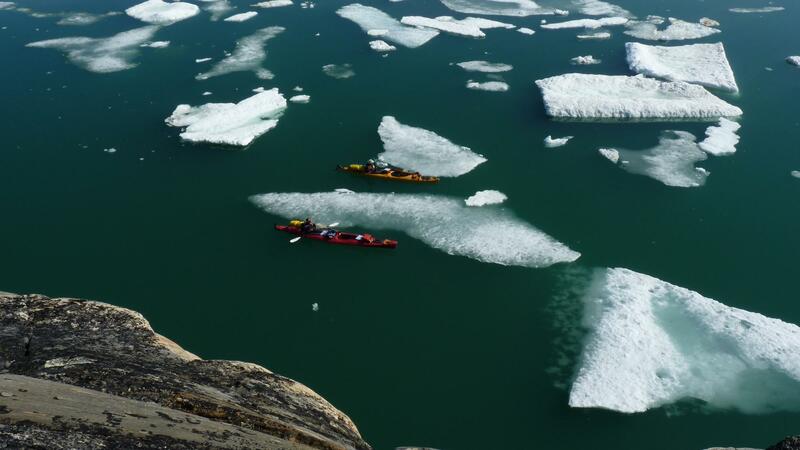 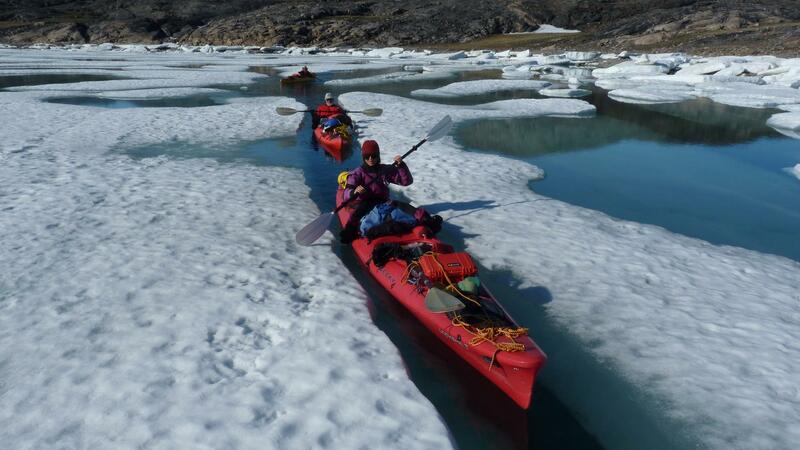 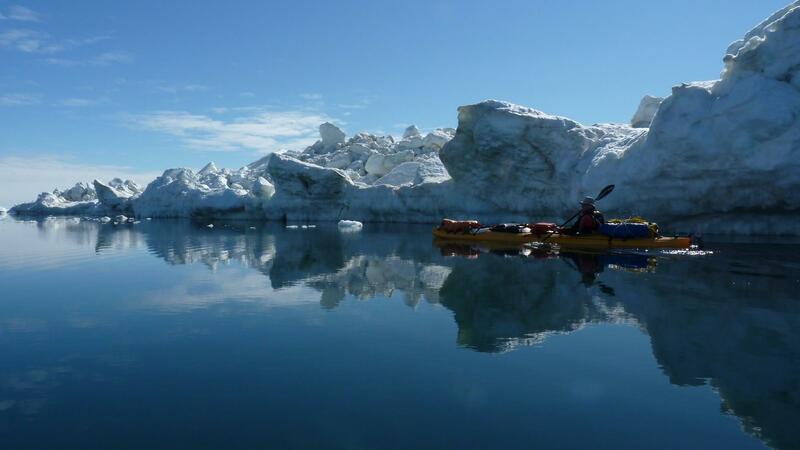 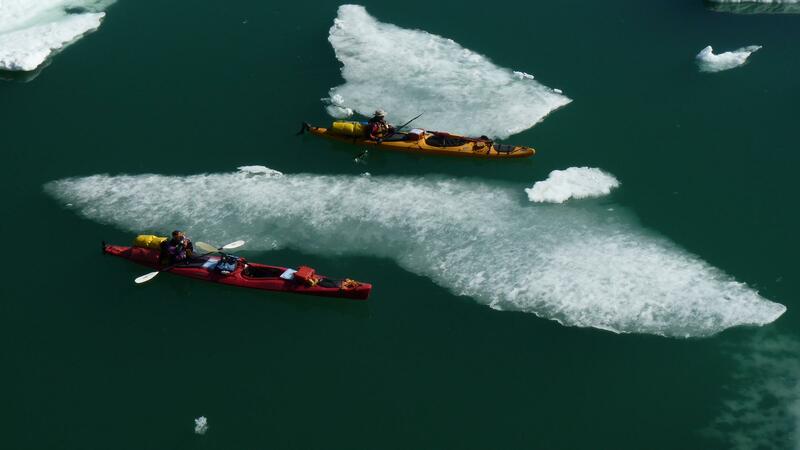 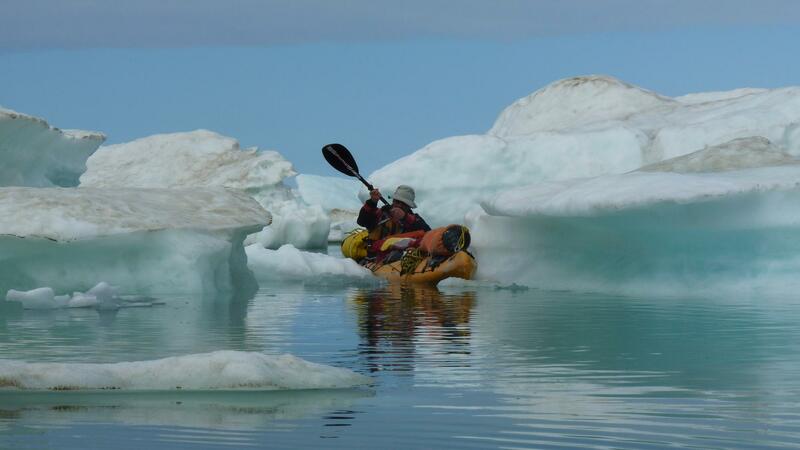 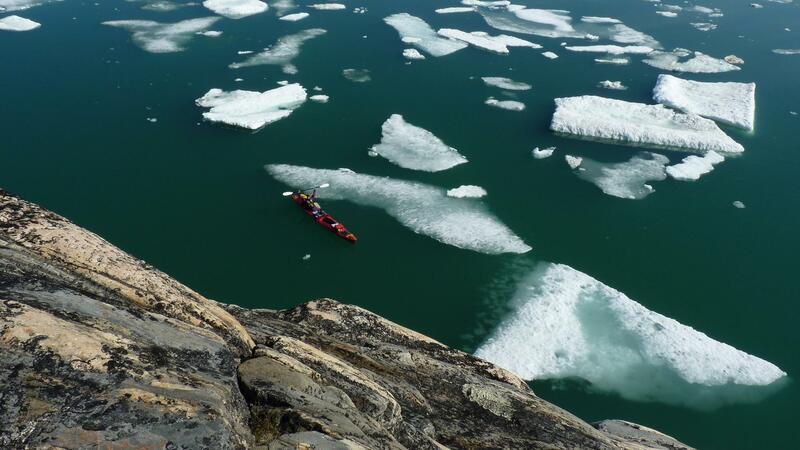 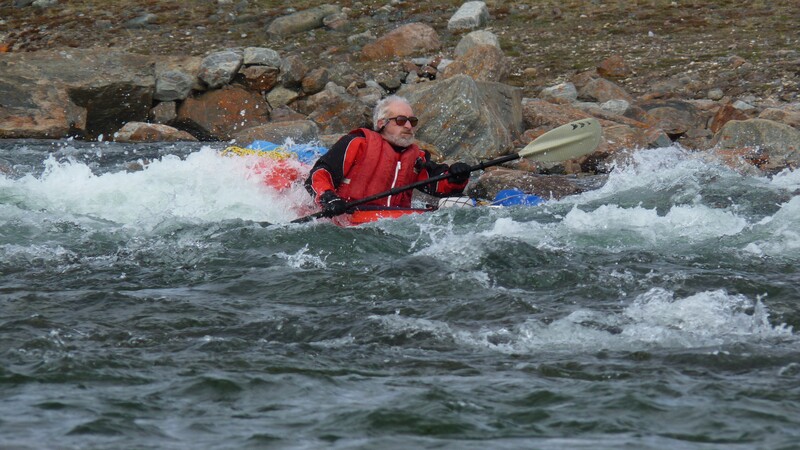 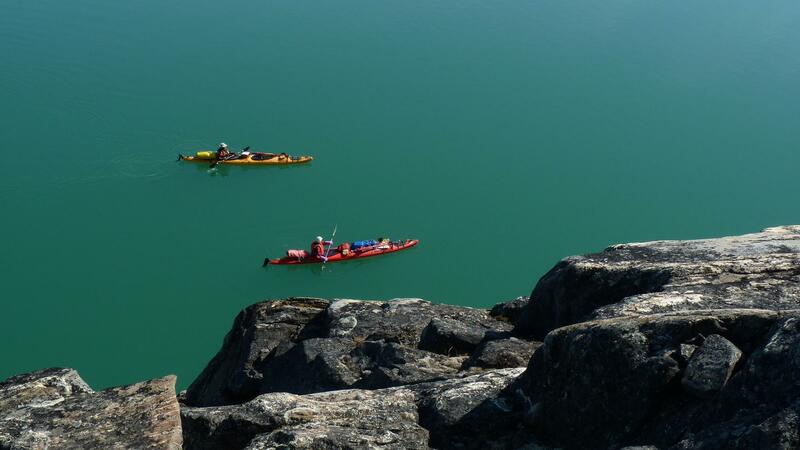 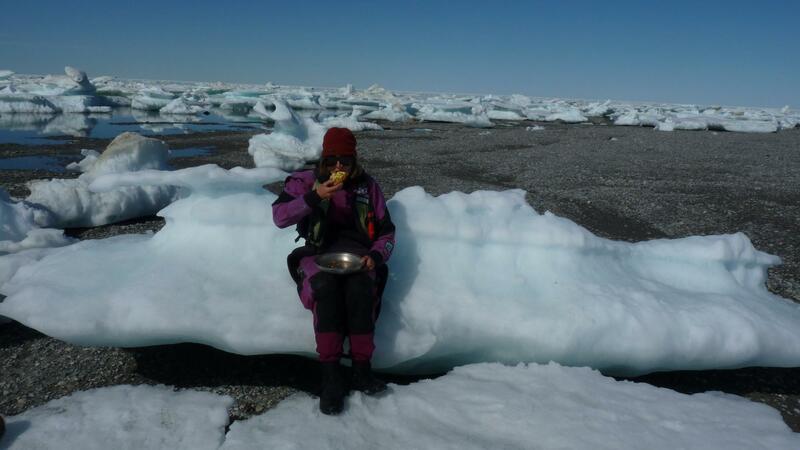 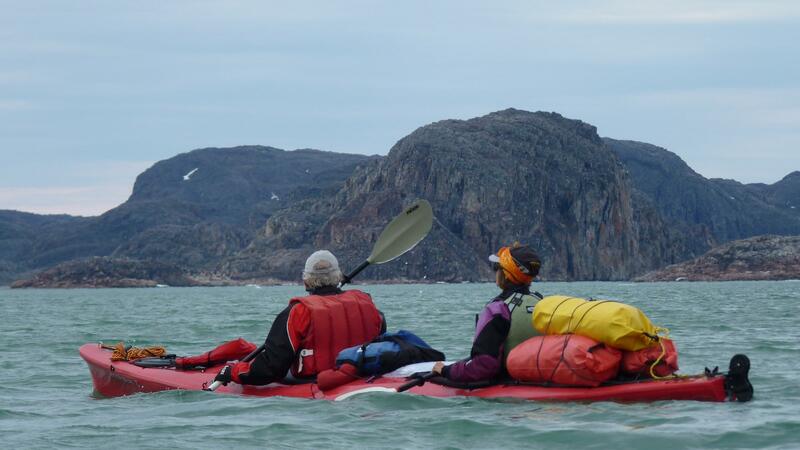 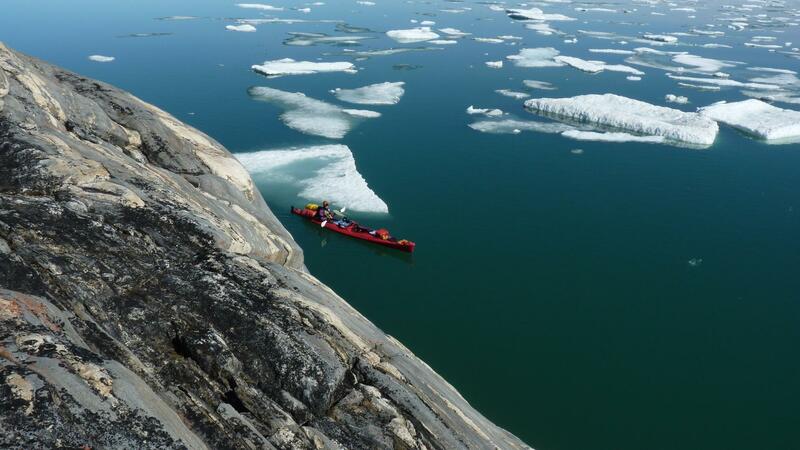 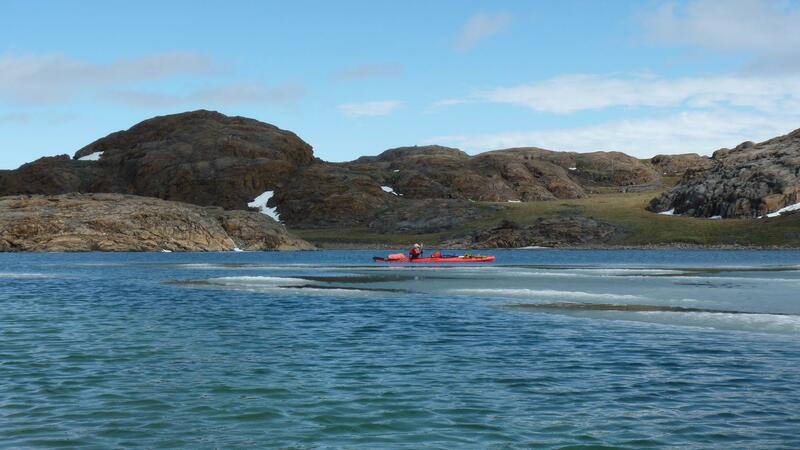 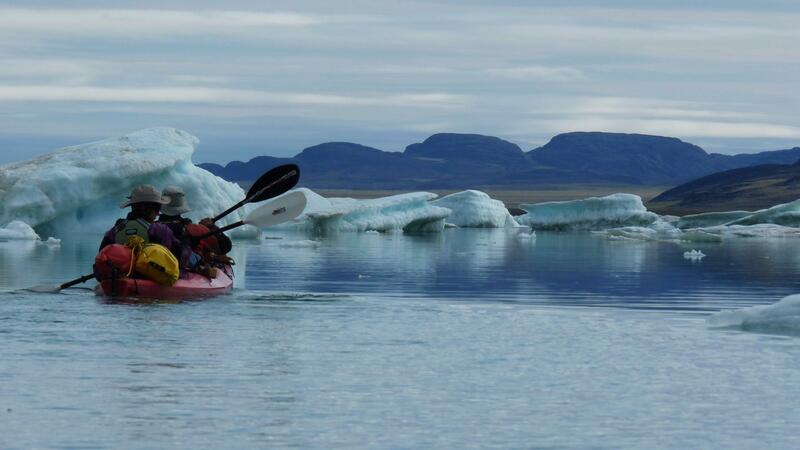 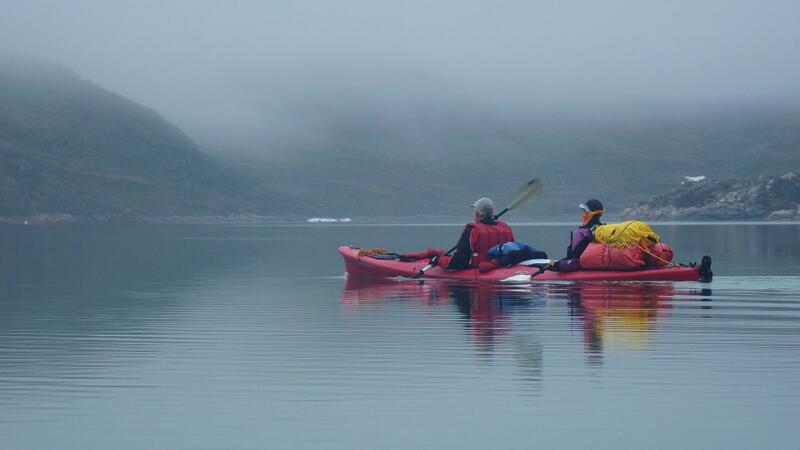 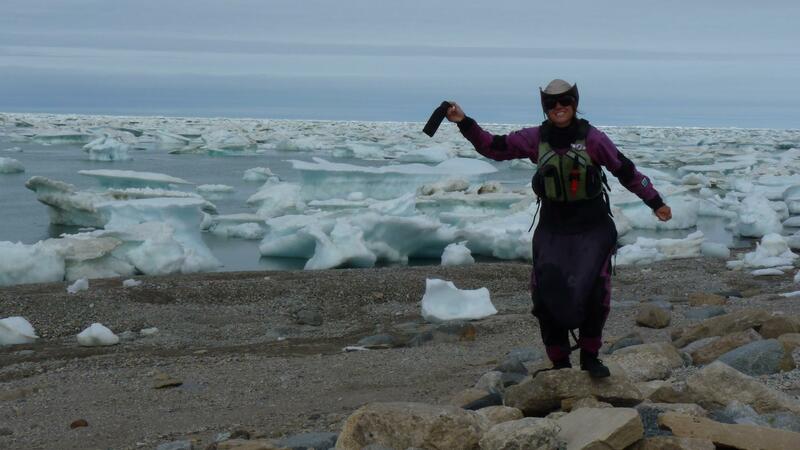 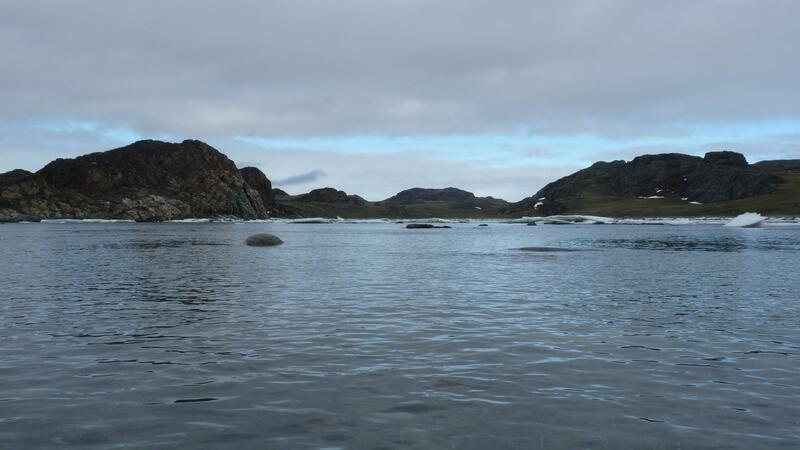 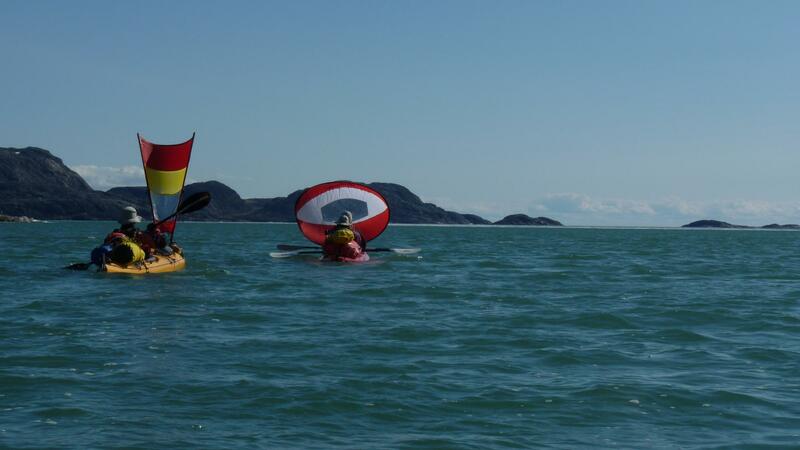 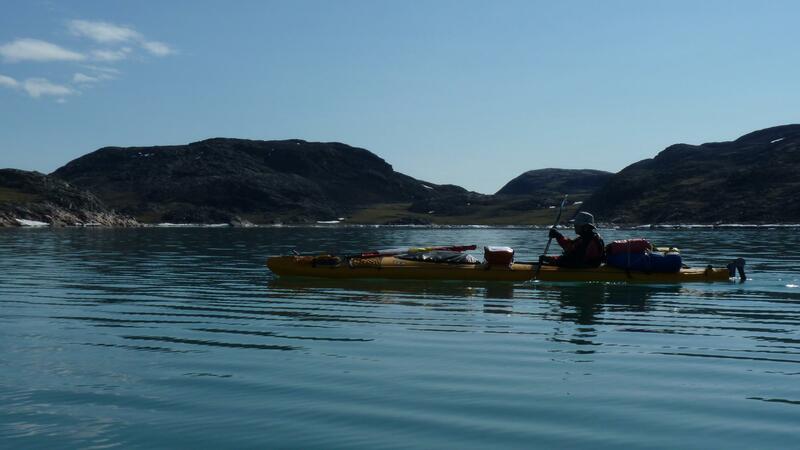 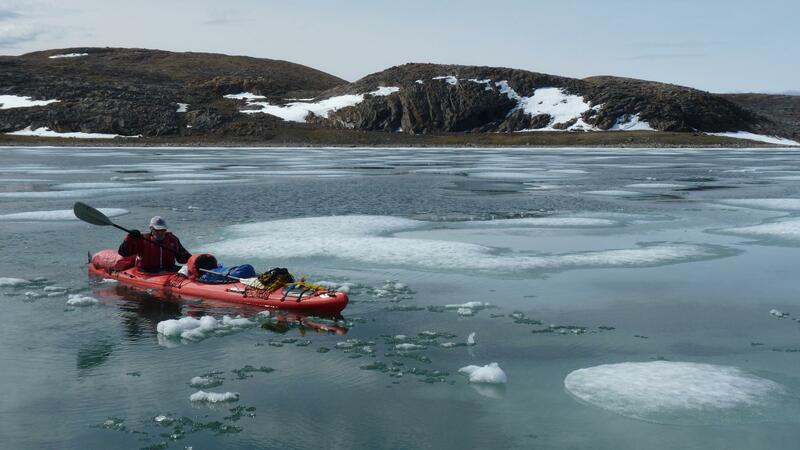 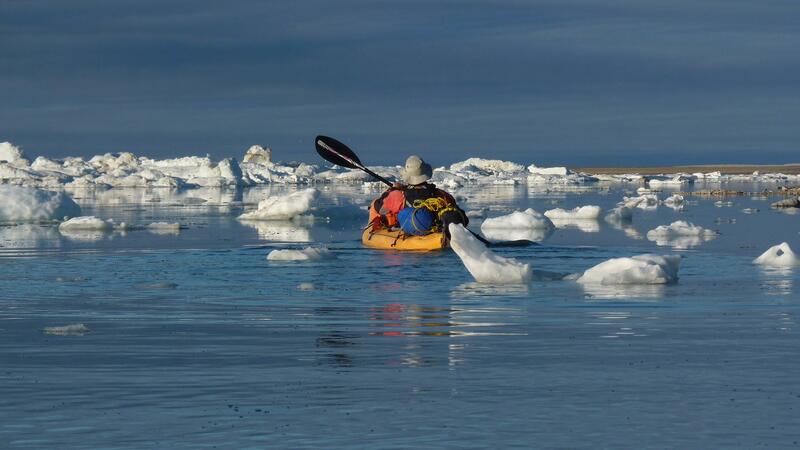 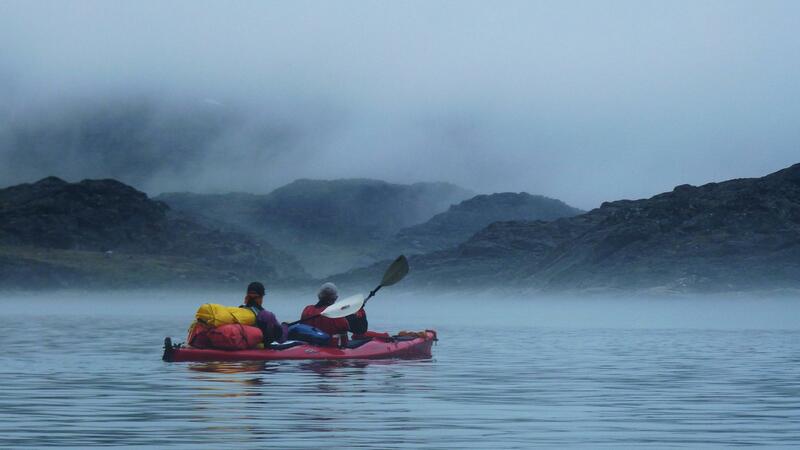 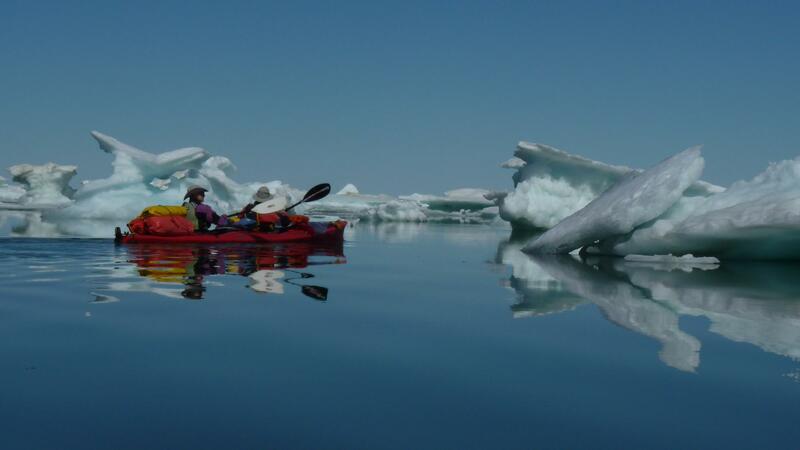 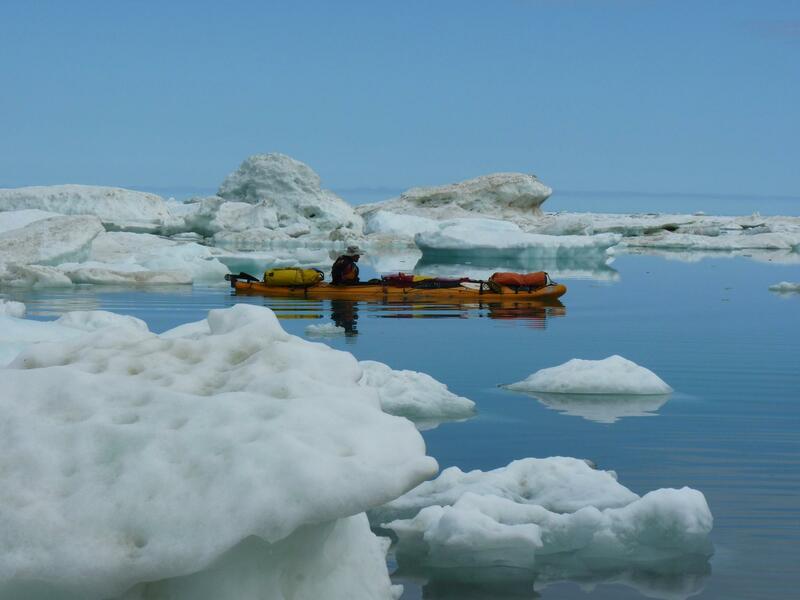 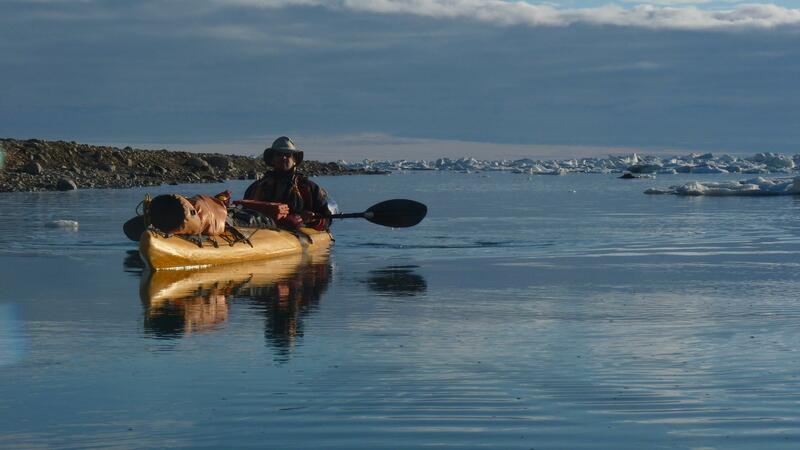 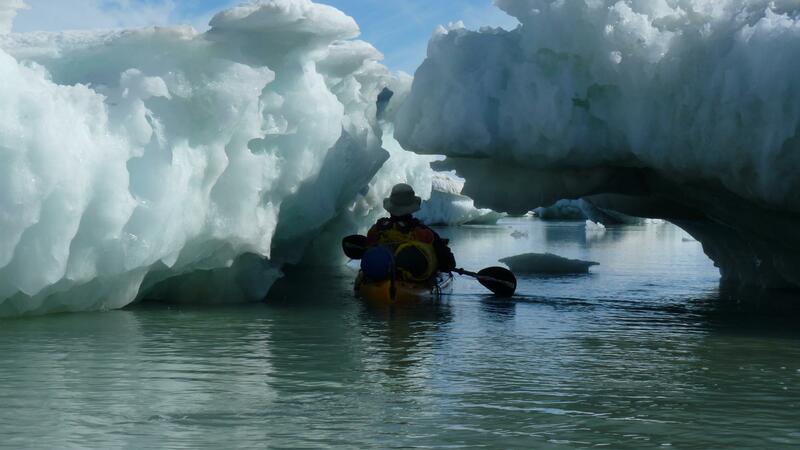 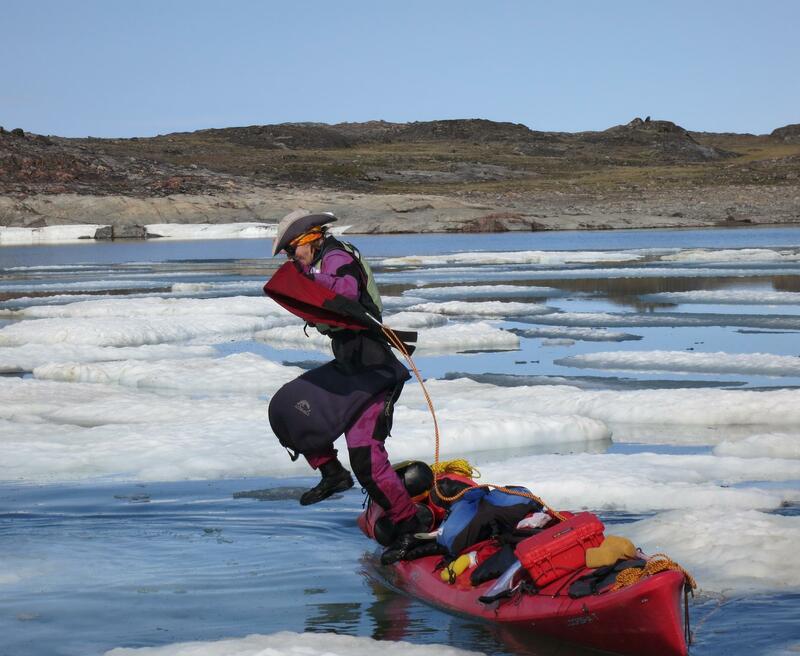 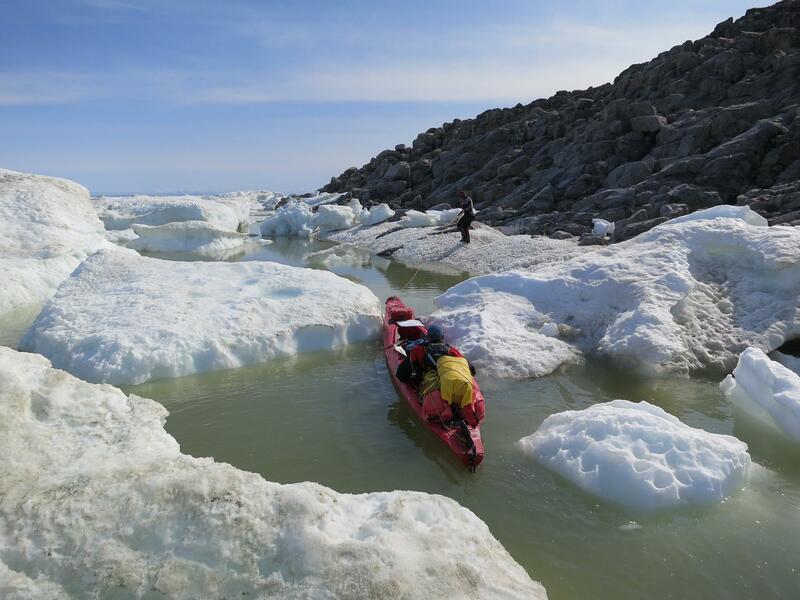 Naturally, there was more ice in Keith Bay, and on top of that strong winds kept us pinned down for two days, but when we were finally able to get way, we had a long uninterrupted paddle…. 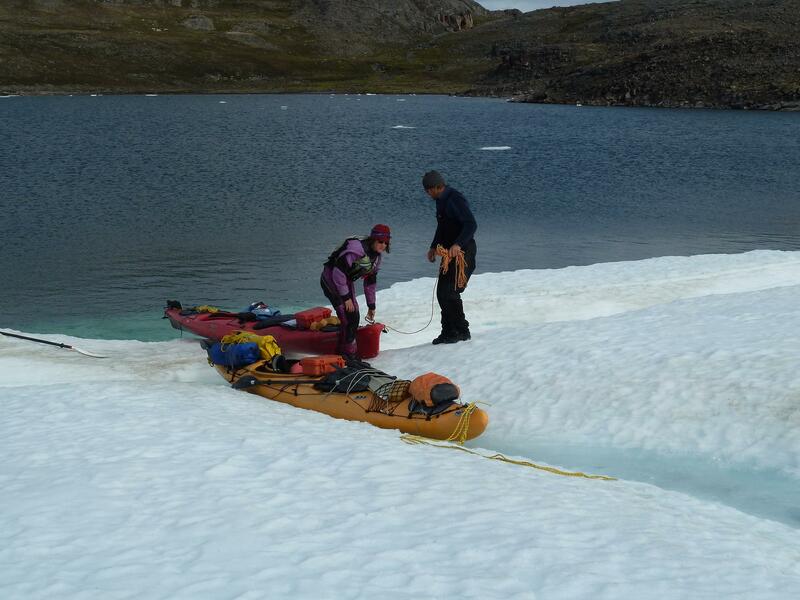 “ahh, our problems are over”…..until we were stopped once again by ice. 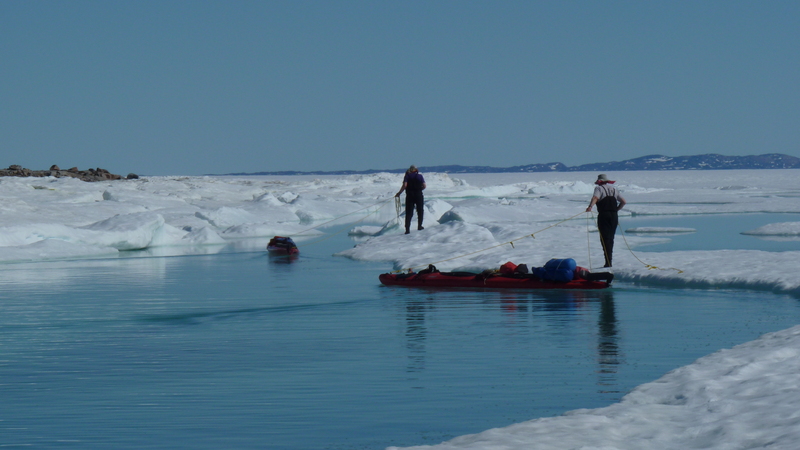 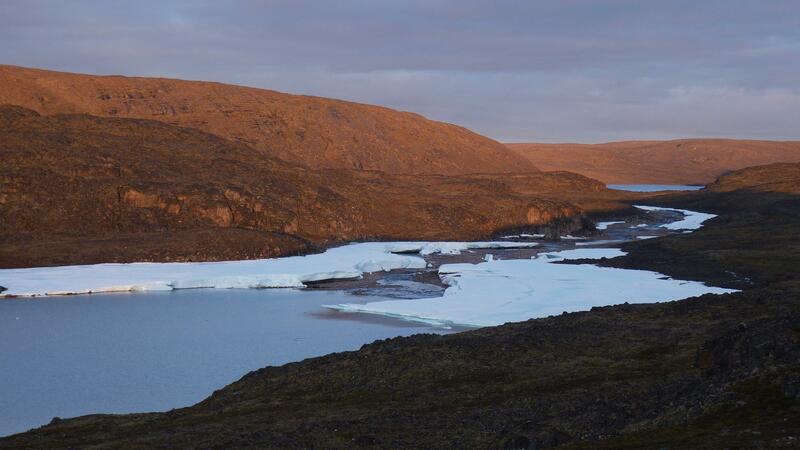 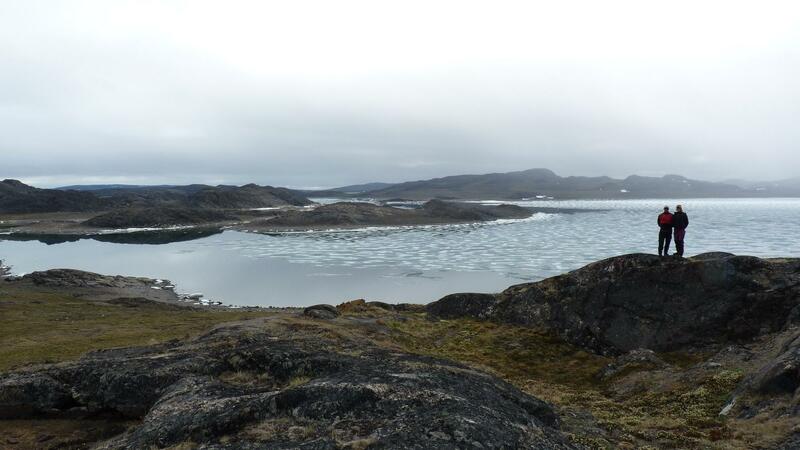 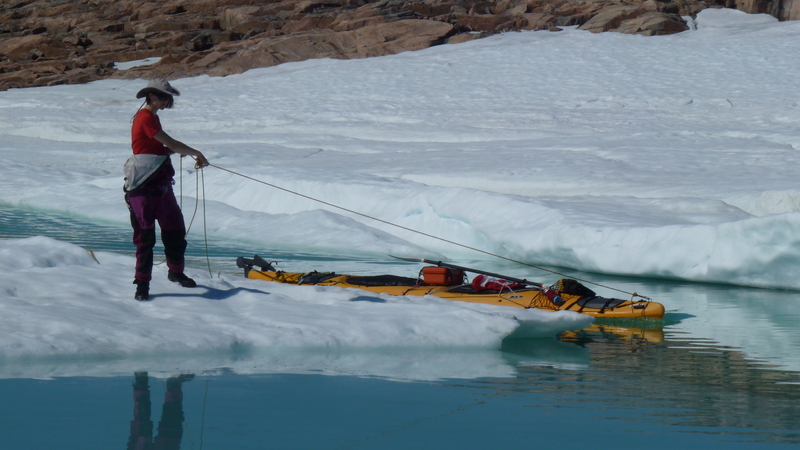 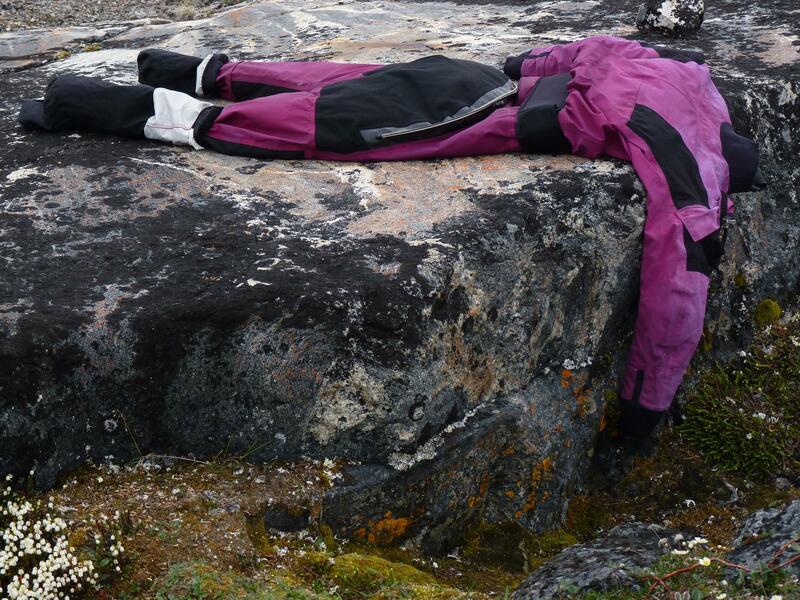 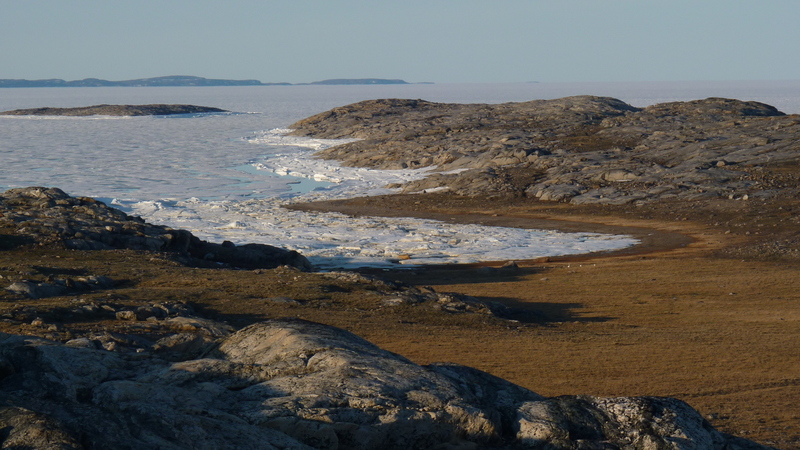 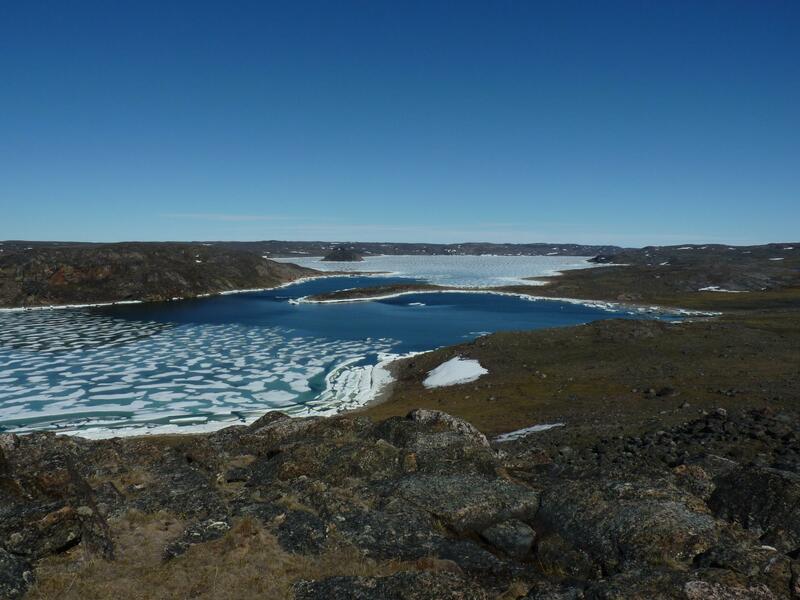 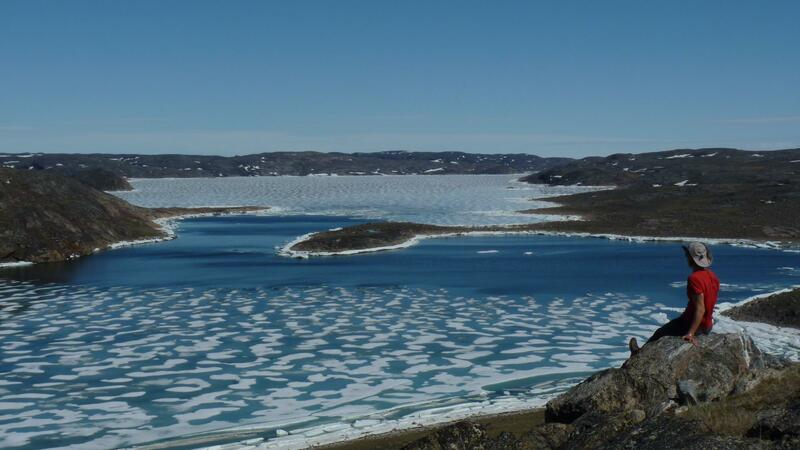 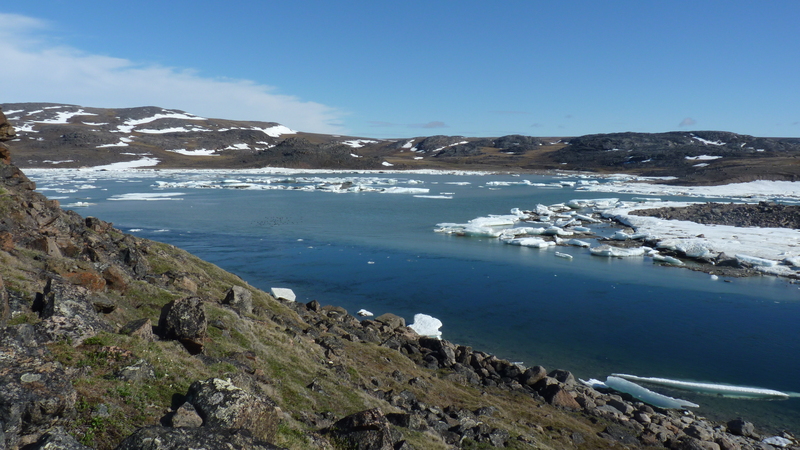 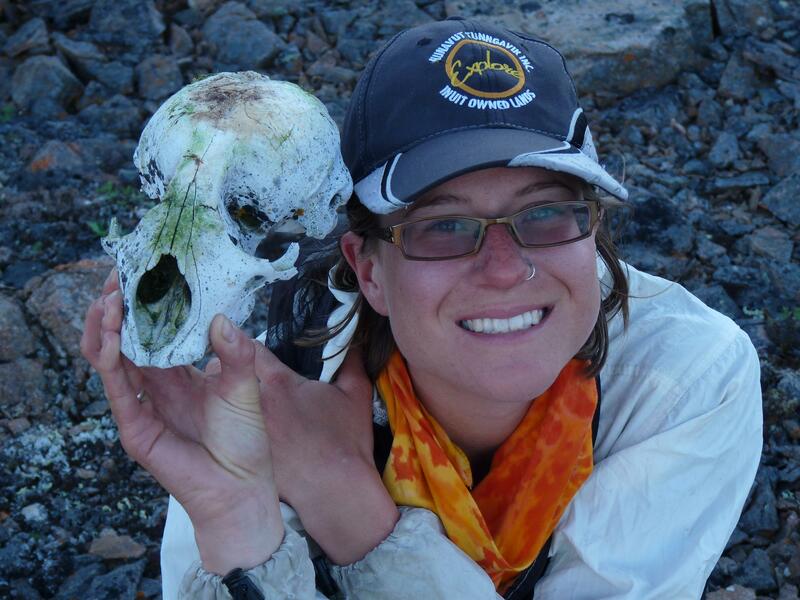 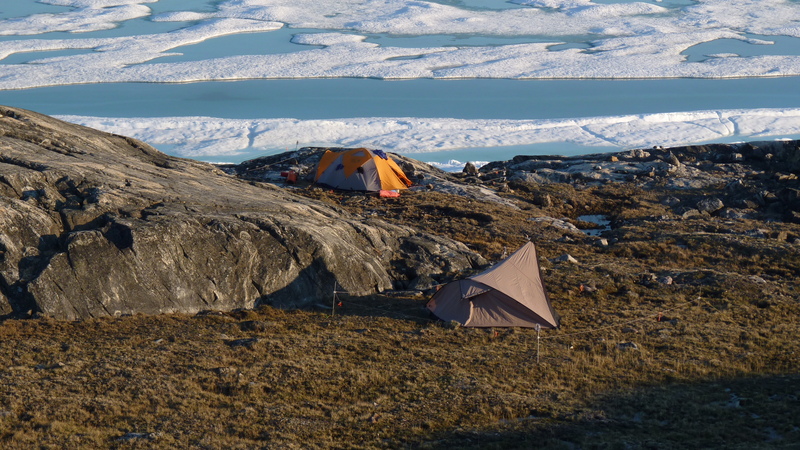 By now, the only thing we could do was grin and bear it and work through it as best as we could, which we did for the next few days, until five kms from the bottom of Committee Bay, when the ice finally relented. 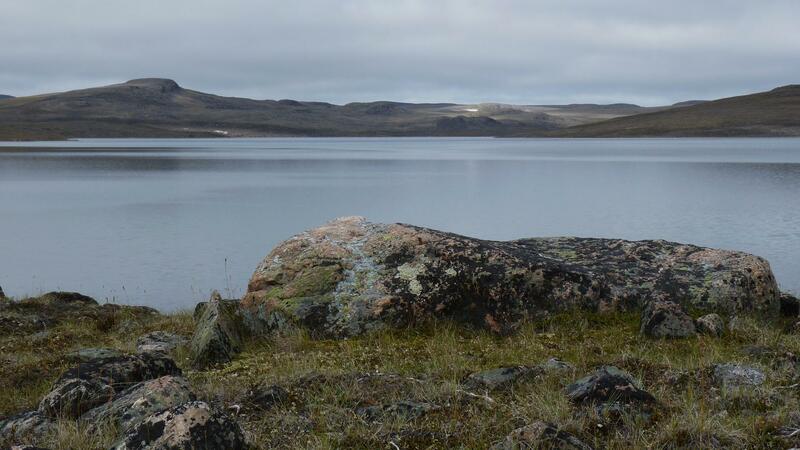 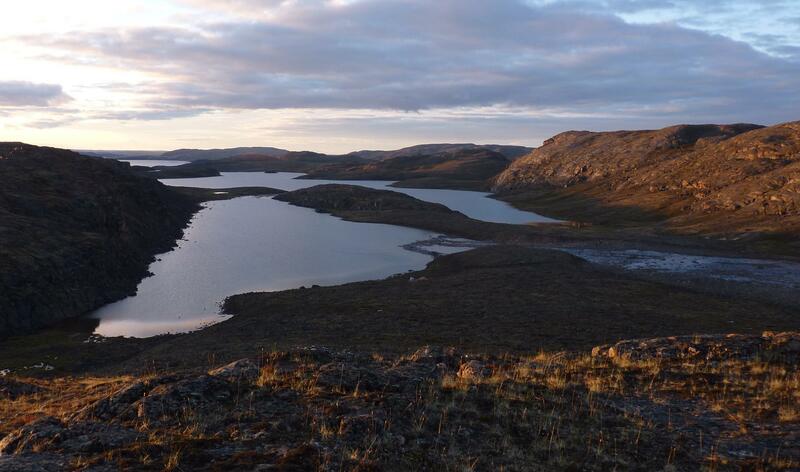 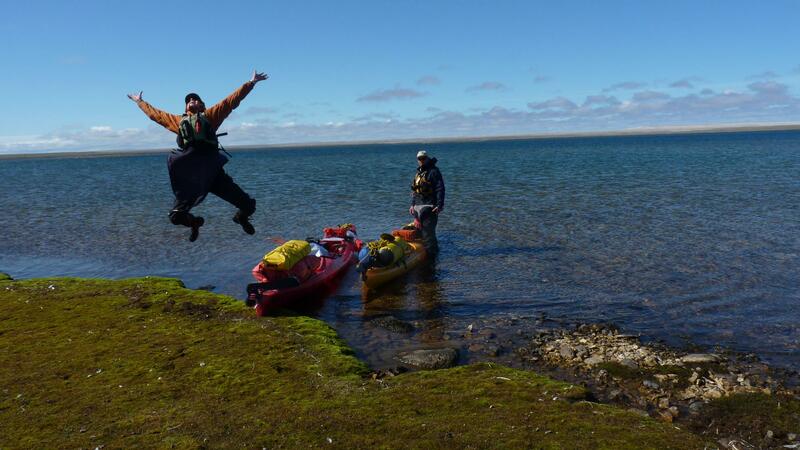 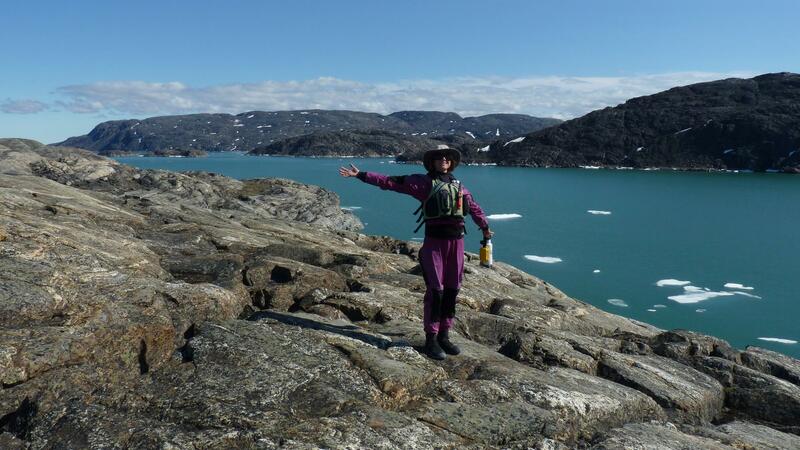 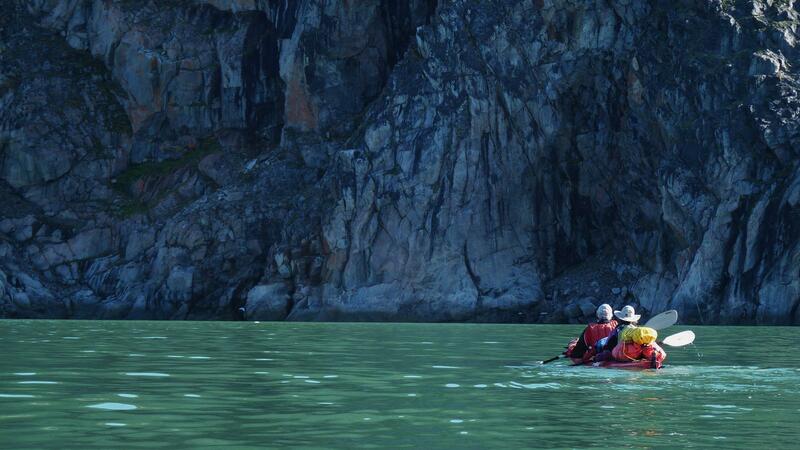 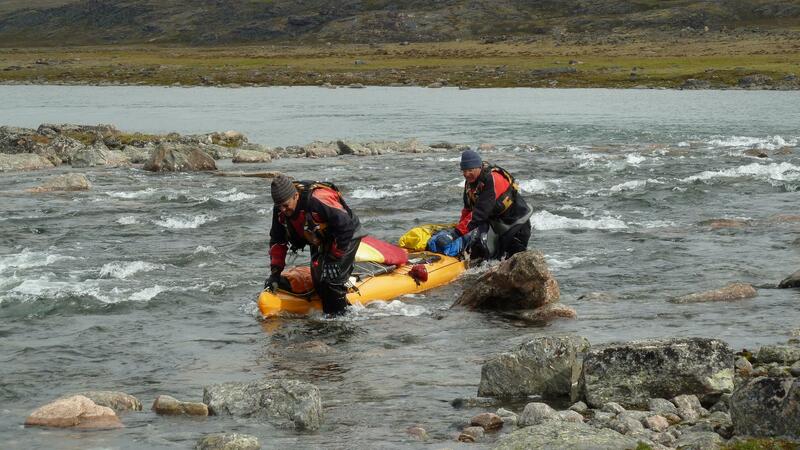 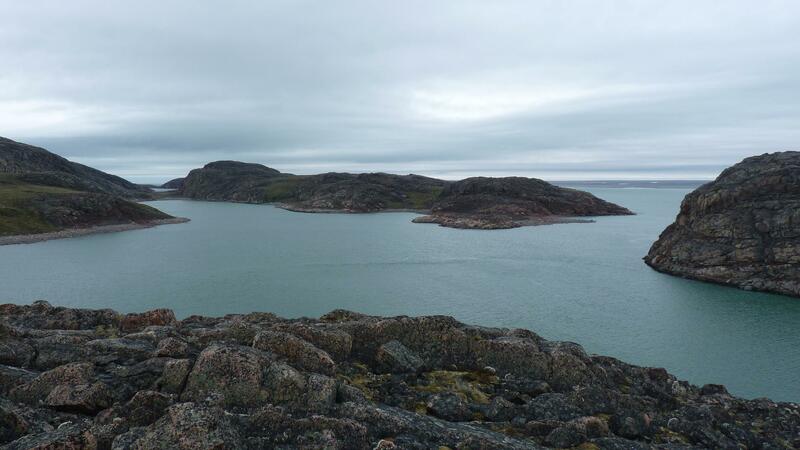 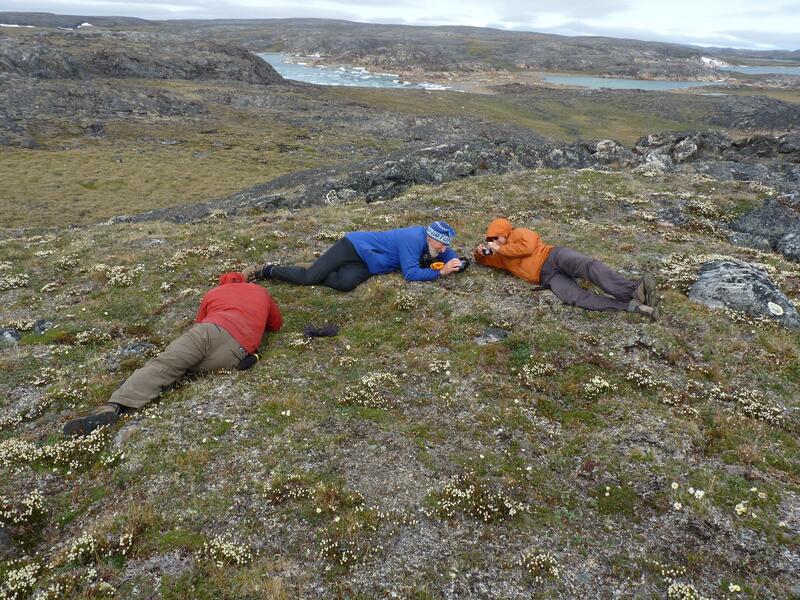 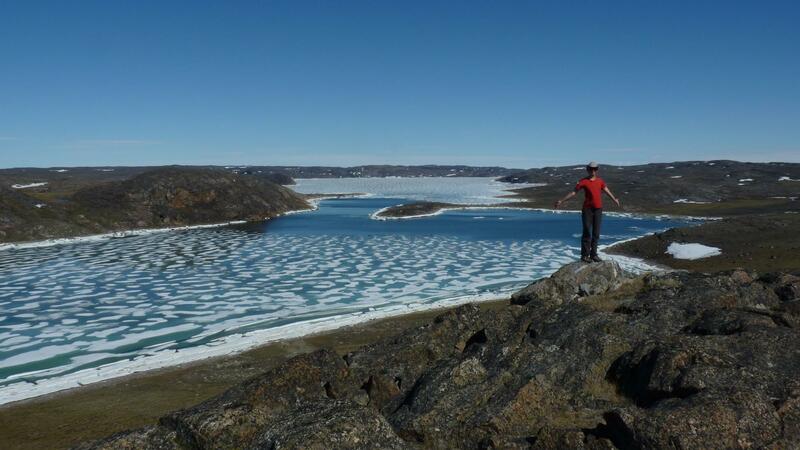 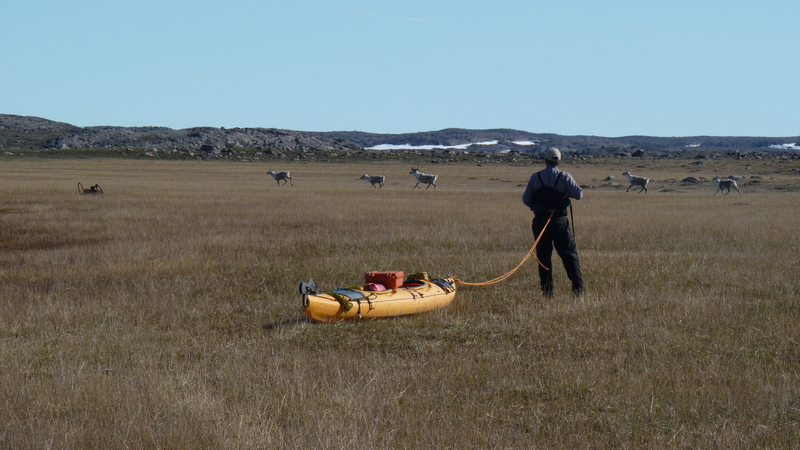 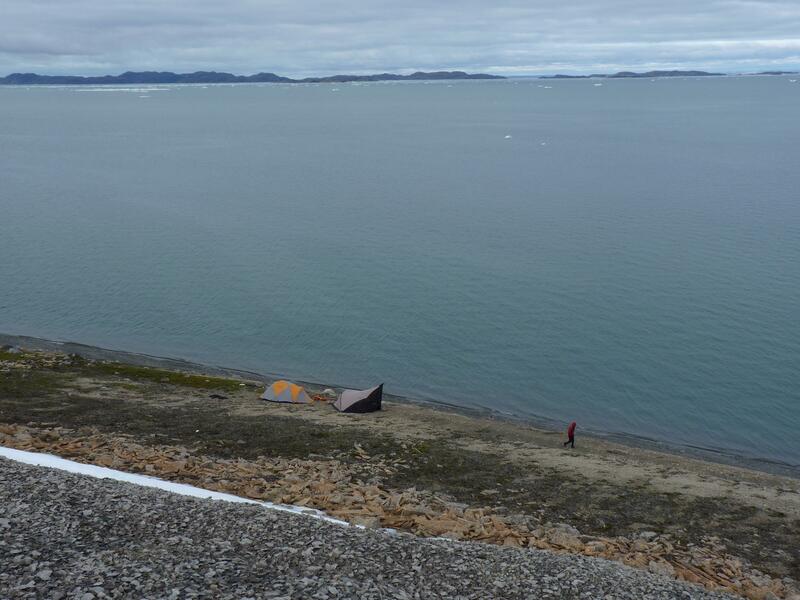 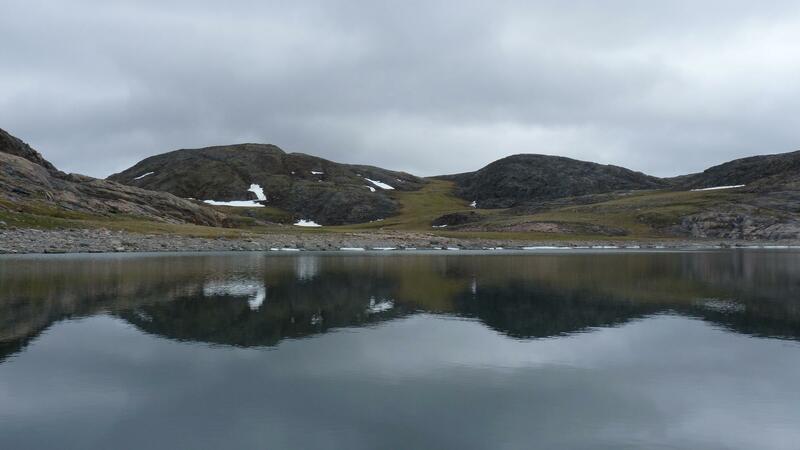 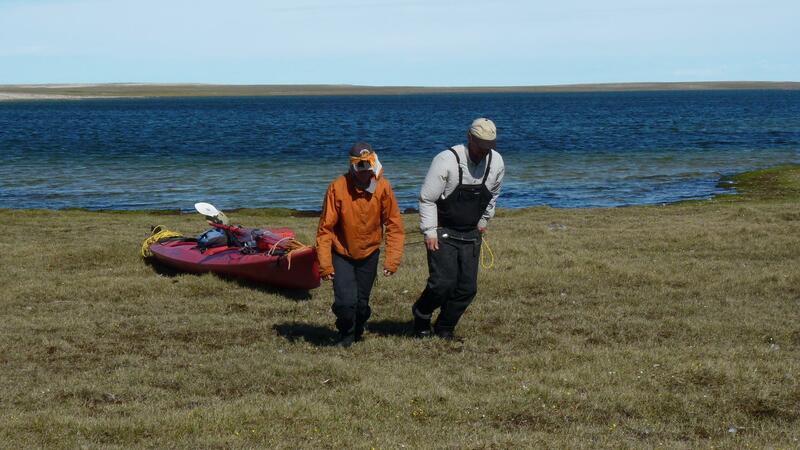 What a relief to be finally rid of the worry that we might have to abandon the boats and walk back to Kugaaruk! 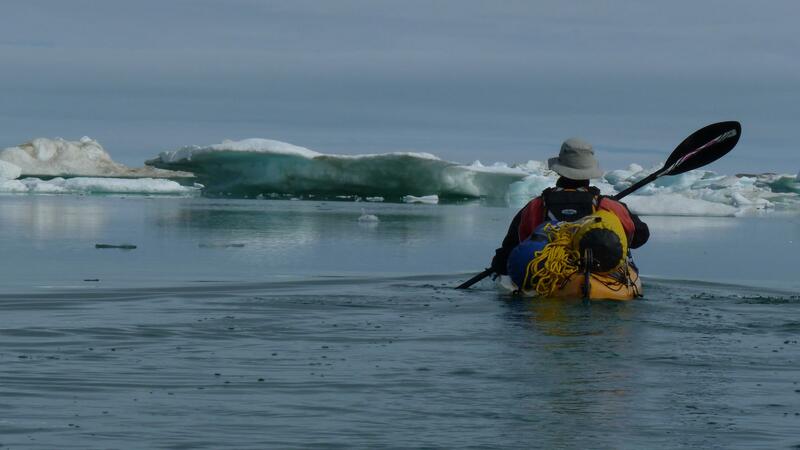 We entered a narrow passage with the tide ebbing hard against us – time to stop. 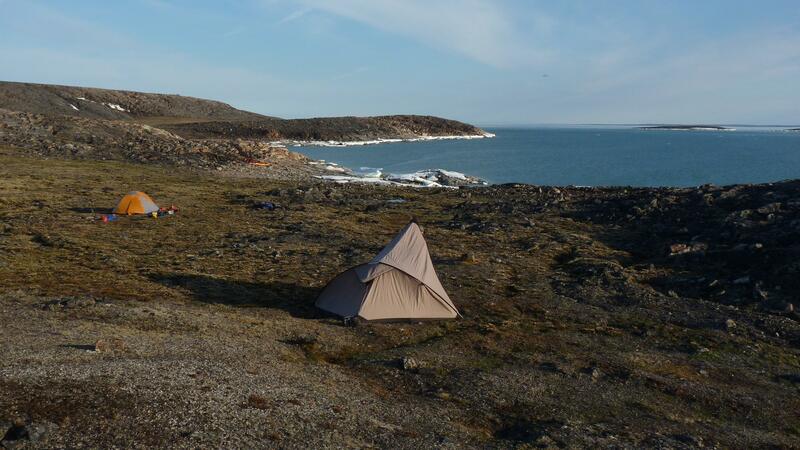 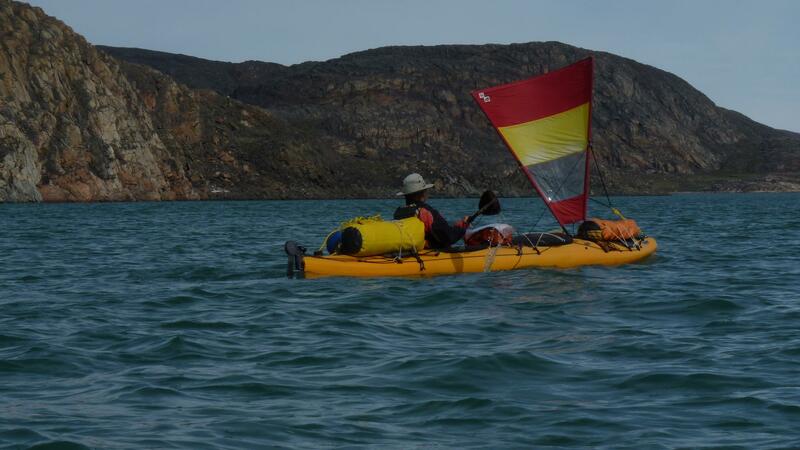 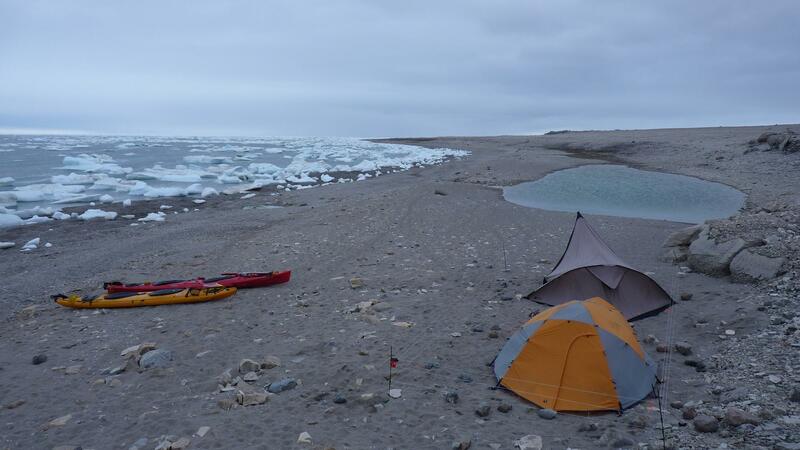 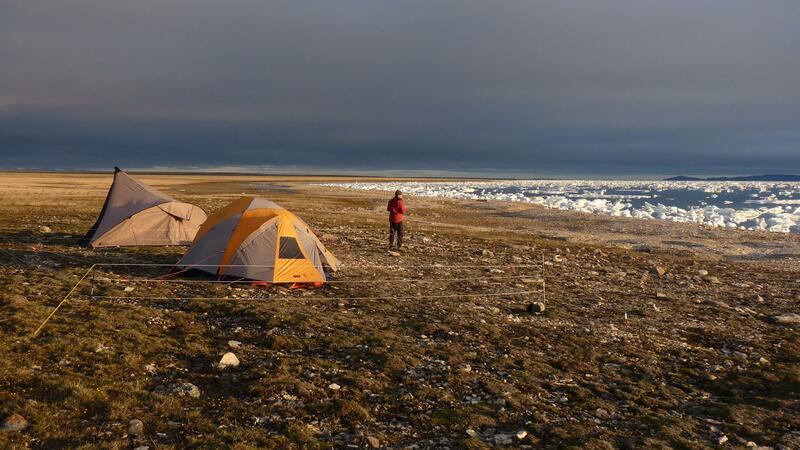 After two more days of waiting out strong winds from the south, then north (accompanied by snow), and for the right tide to get past very fast current at an even narrower channel, we were finally able to begin our final portage across the 100 km wide Rae Isthmus to Hudson Bay. 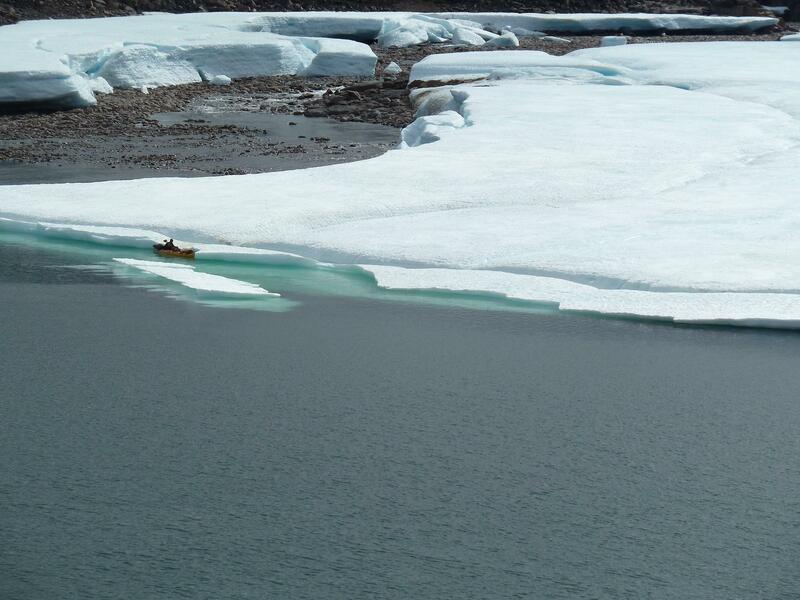 But at least we no longer had ice to worry about. 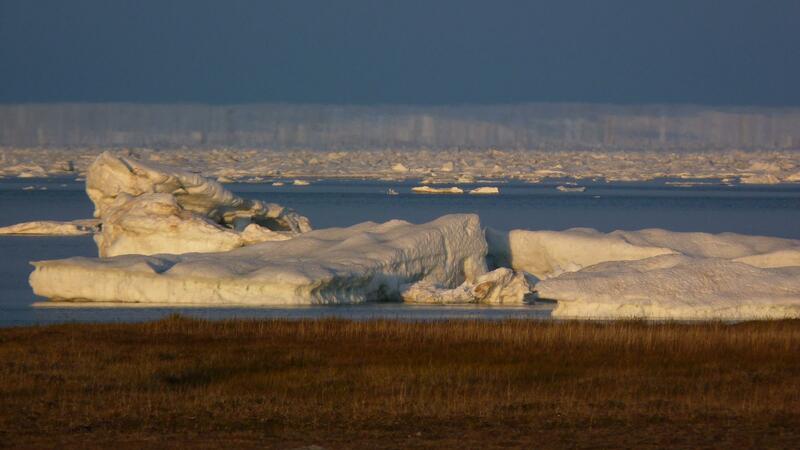 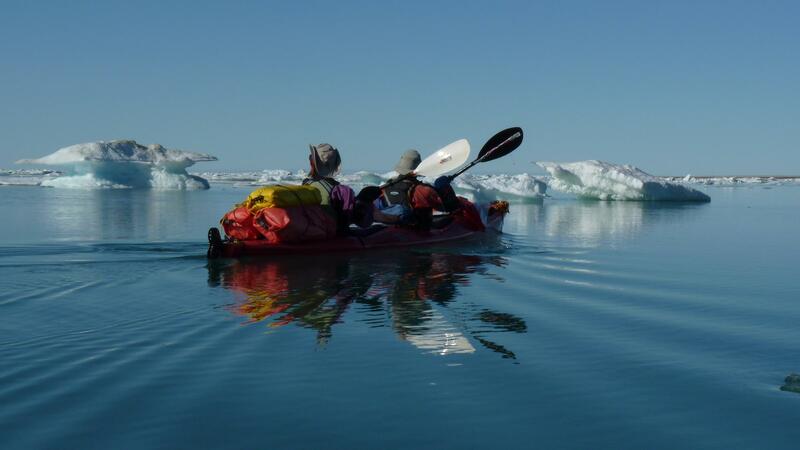 When Chris and I paddled to Repulse Bay from Chesterfield Inlet four years earlier, we never encountered any ice during the entire trip. 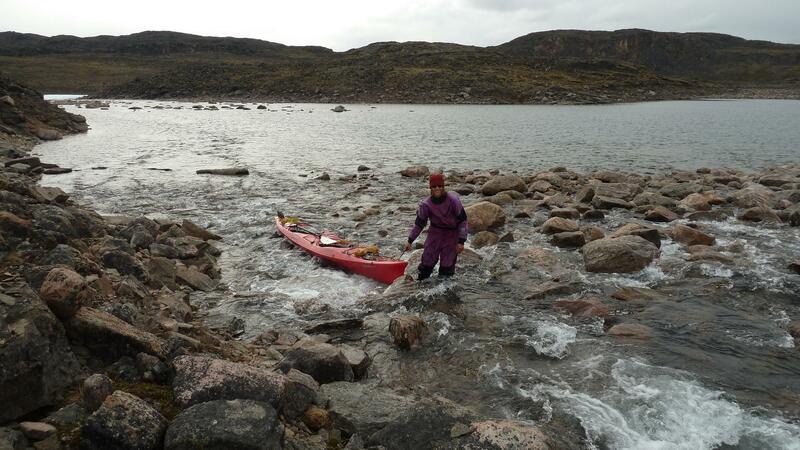 The portage across the Rae Isthmus sounds harder than it actually is, as you are able to follow a series of lakes the entire way, with only short sections of actual portaging. 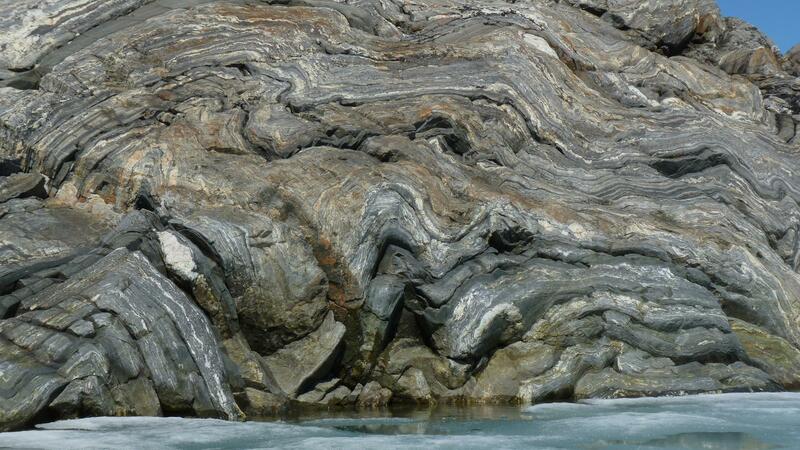 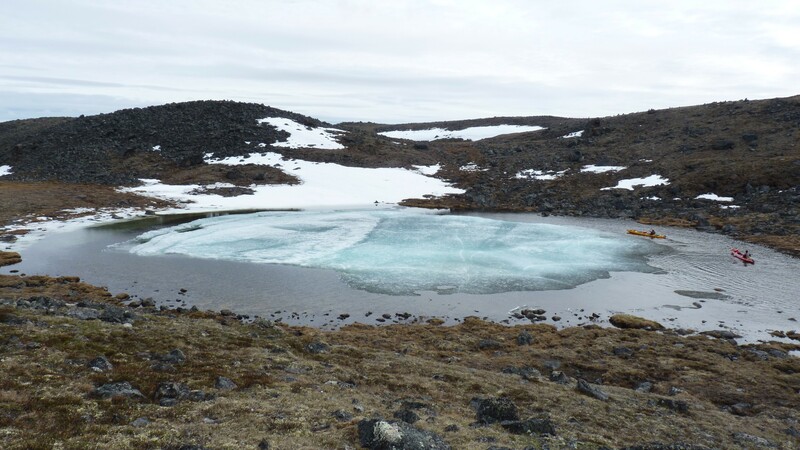 We even had a short section of “aufeis” – an arctic and alpine phenomenon formed when groundwater is blocked by ice during the winter and overflows the ice at its edge. 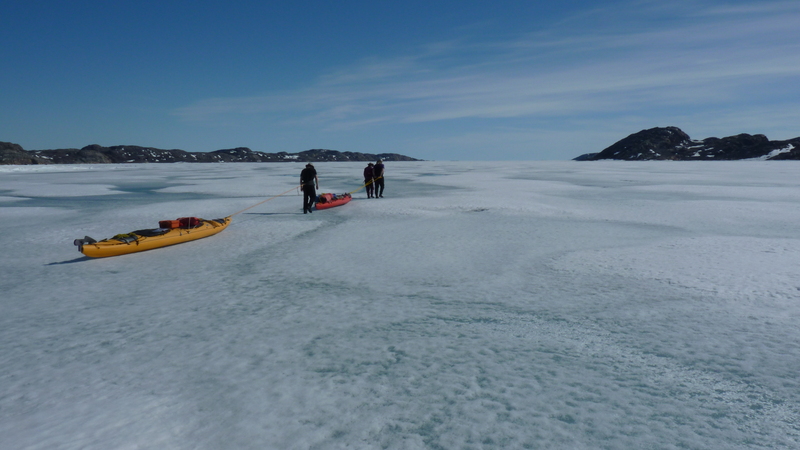 The ice was several metres thick and we were able to pull the kayaks over it, thankfully avoiding a difficult boulder-strewn portage. 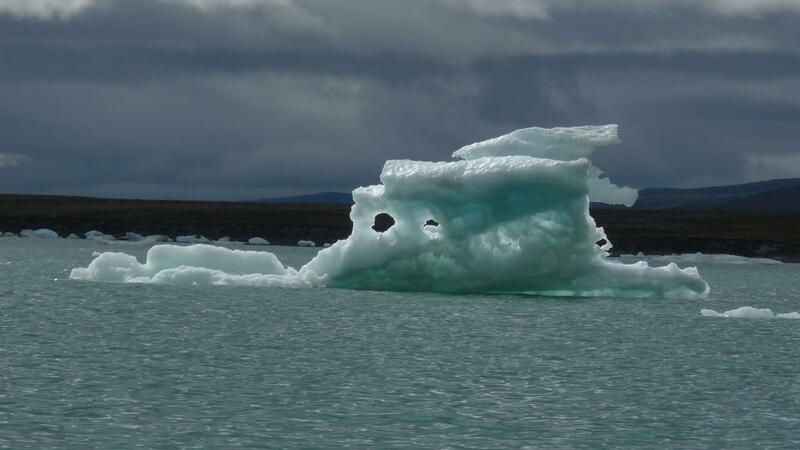 The ice seemed more like a mini-glacier rather than simple a sheet of ice that formed by water overflowing itself. 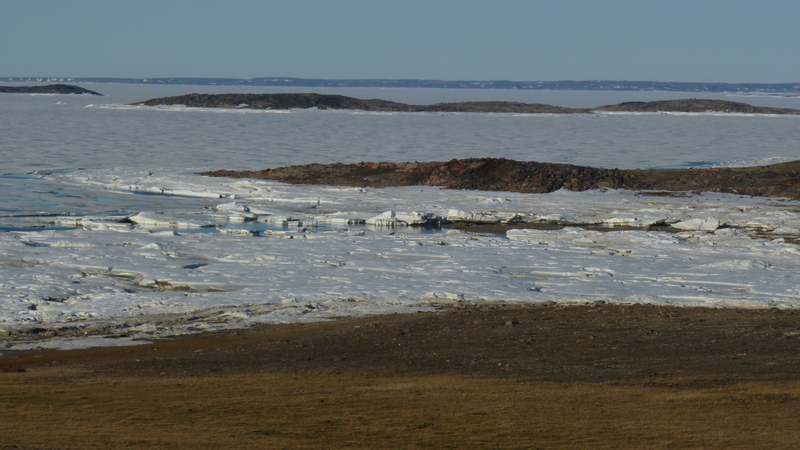 The sheet of ice even flowed into the lake below it, much like glaciers on Ellesmere Island and Greenland flow into the ocean. 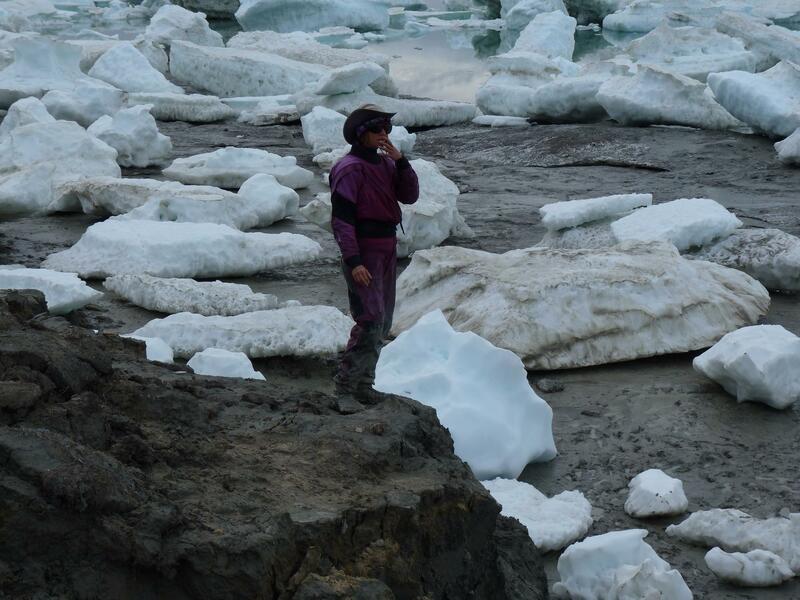 For the first time, the presence ice was particularly helpful to us. 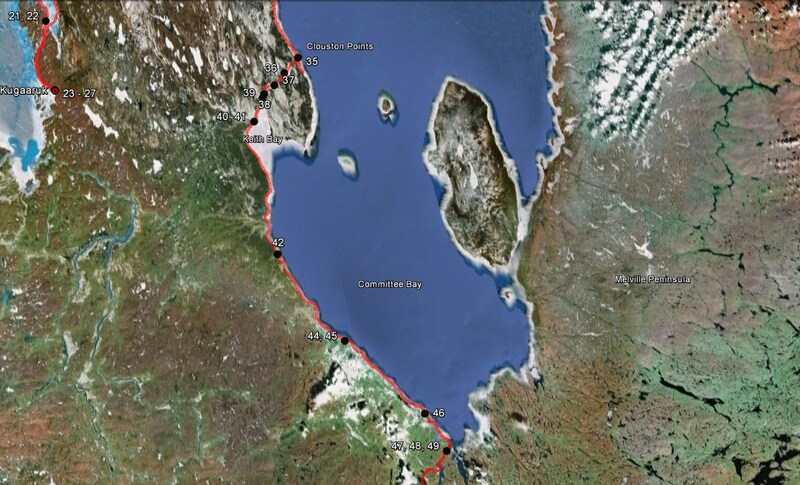 The longest portage is at the south end of the Rae Isthmus. 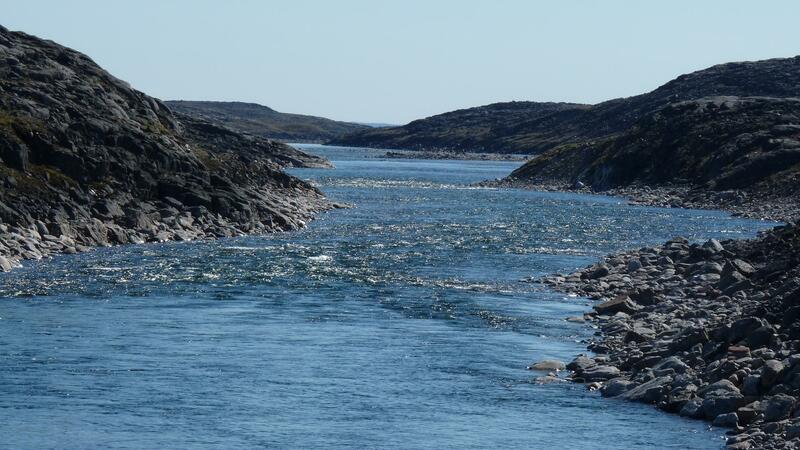 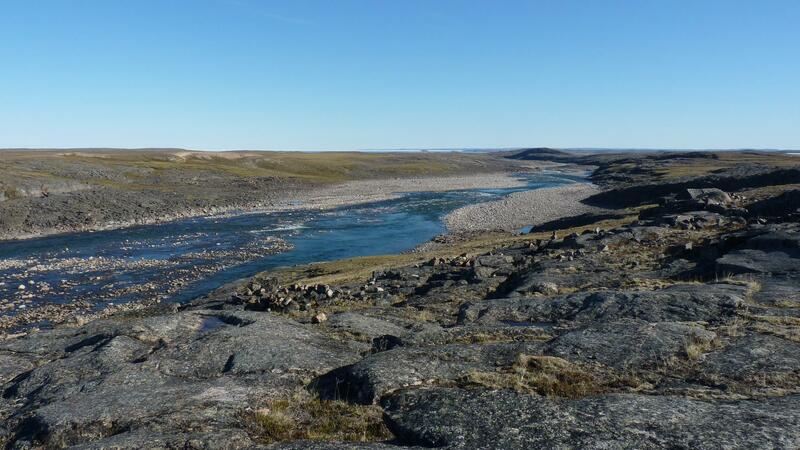 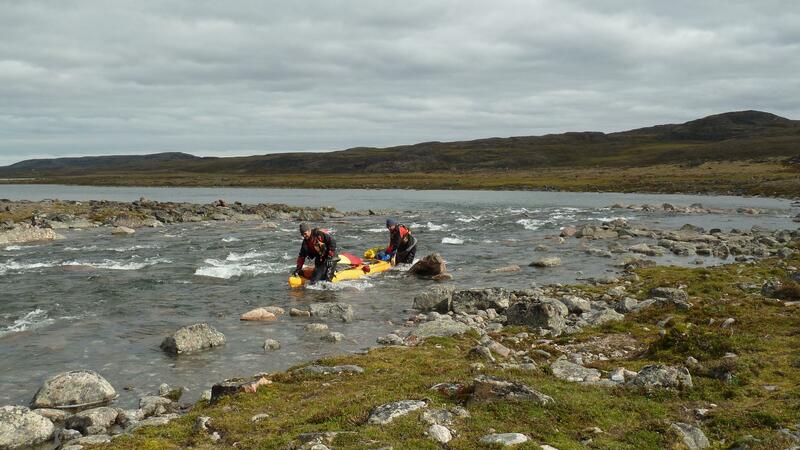 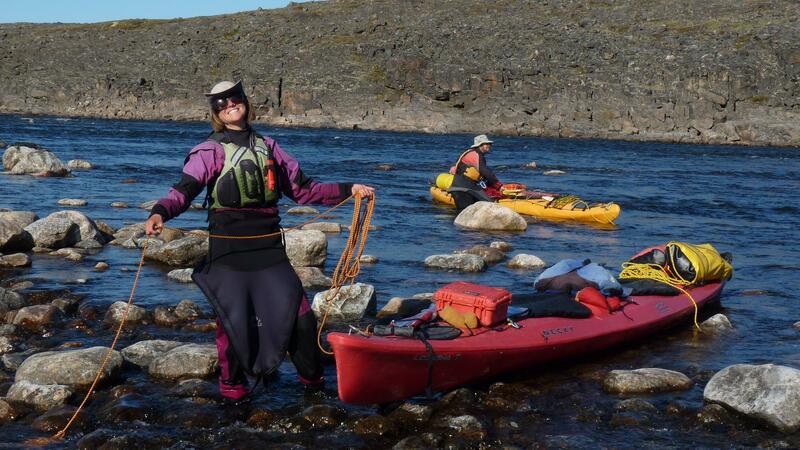 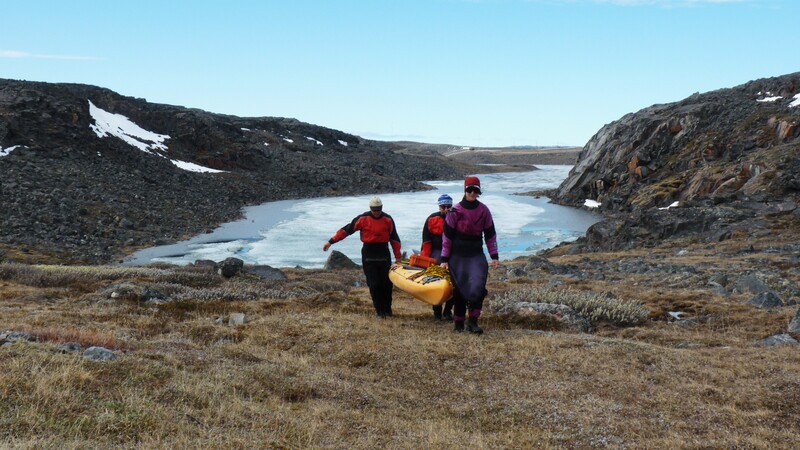 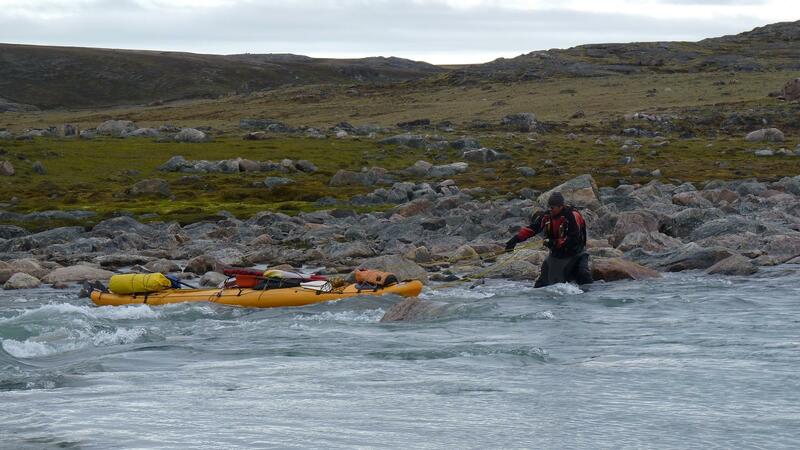 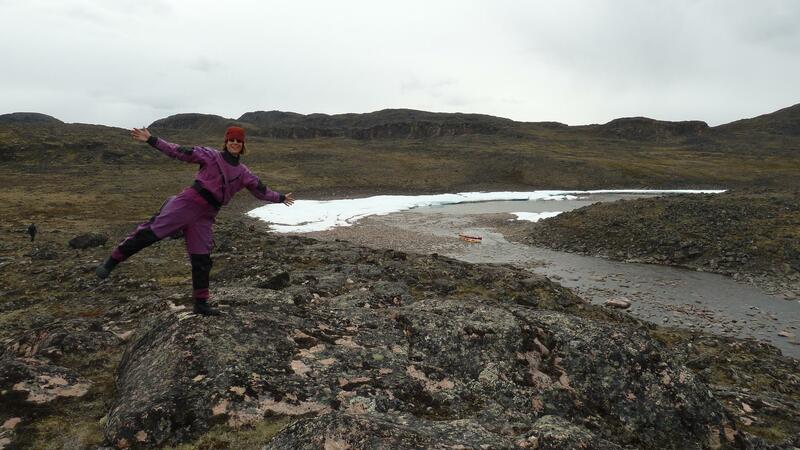 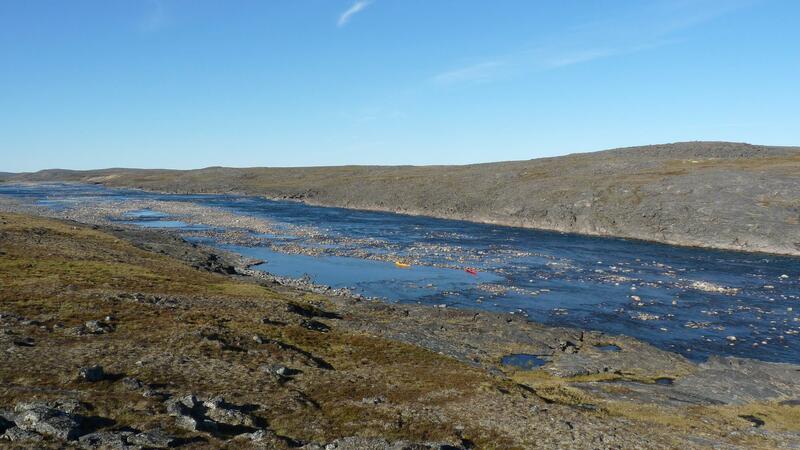 After negotiating the swift water, rapids and boulder fields of the upper part of the North Pole River, we found the last three kms of the river beyond our abilities, forcing us to make one last portage to Hudson Bay. 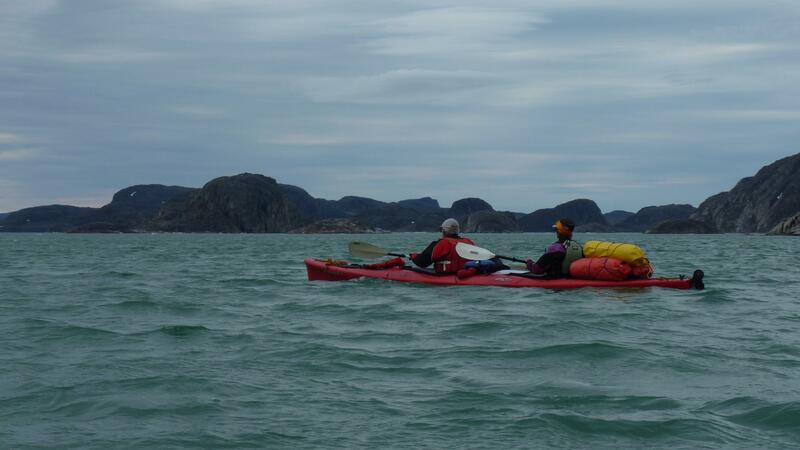 We camped mid-way through this portage, waking early in order to finish the portage and paddle the remaining 25 kms into Repulse Bay by early afternoon. 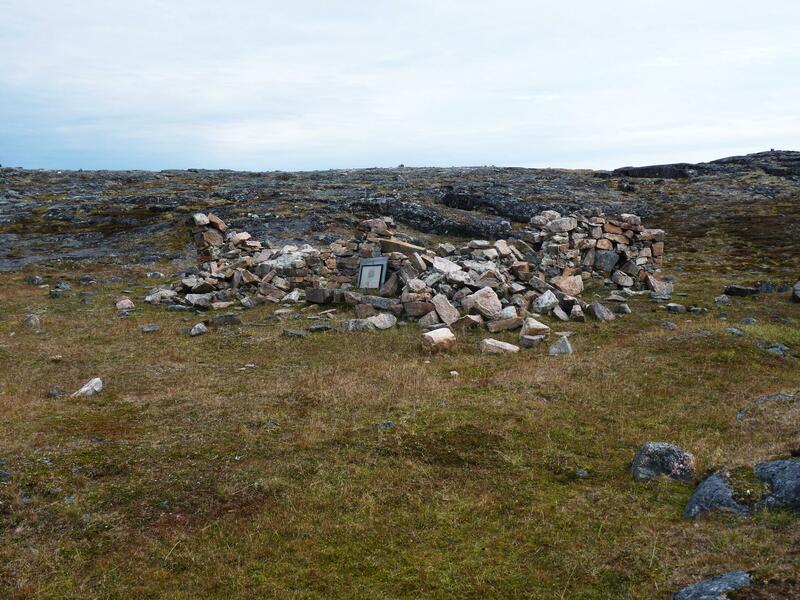 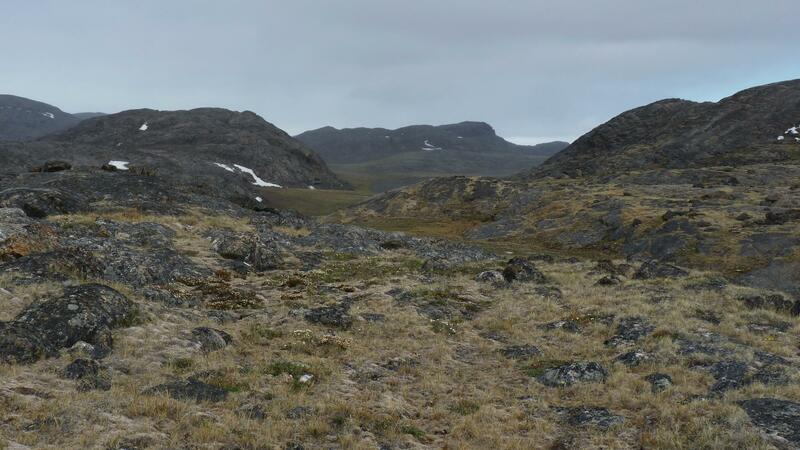 Near the mouth of the North Pole River we visited the remains of Fort Hope, where John Rae and ten others over-wintered in 1846. 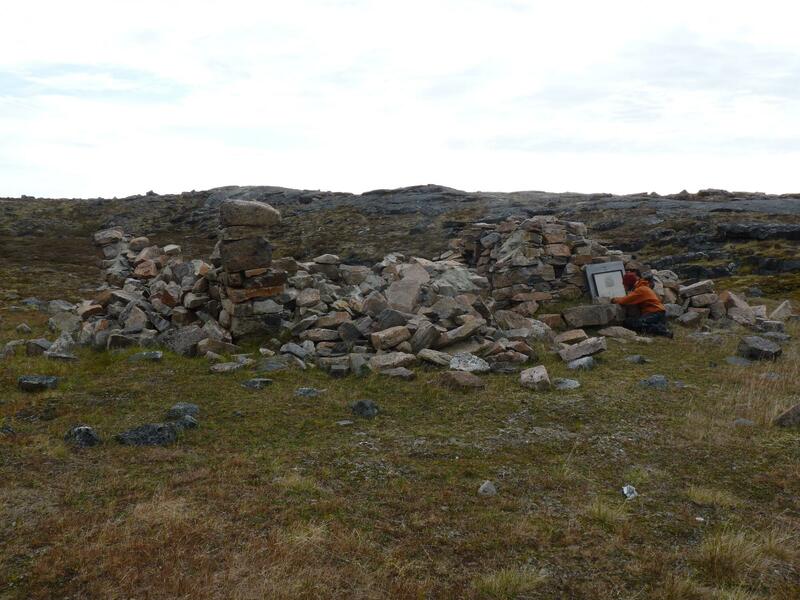 From that experience he learned to travel in winter using igloos and was one of the first white explorer’s to use Inuit knowledge to travel in the Arctic. 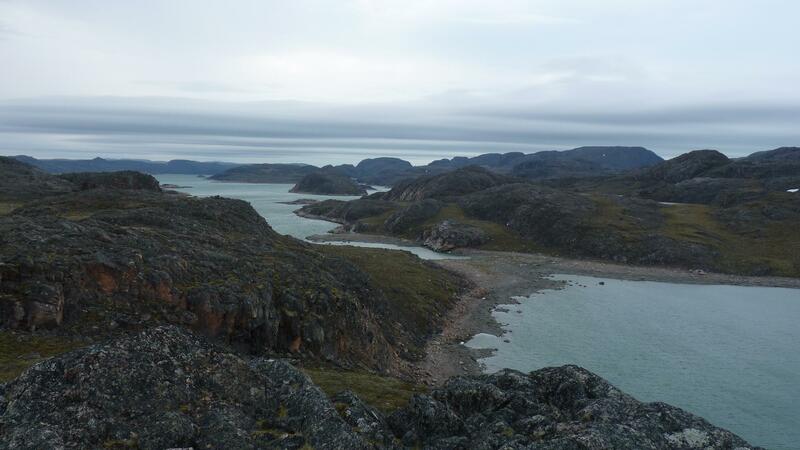 We finally reach Aivilik Point, the last point of land before reaching Repulse Bay, and can see the town across the bay three of four kms from us. 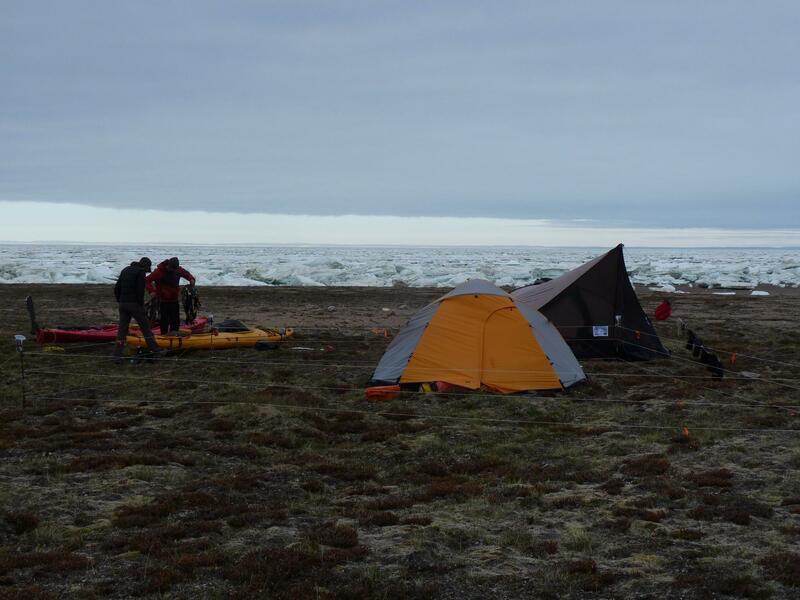 By now it is 6:30, we are cold, tired and hungry, having been up since 3 am in order to finish the portage and reach Repulse in time to make arrangements to fly out. 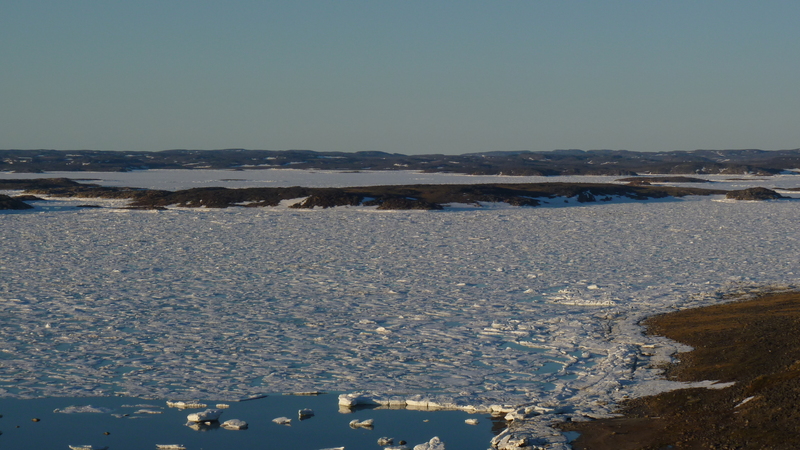 And the bay is completely choked with ice. 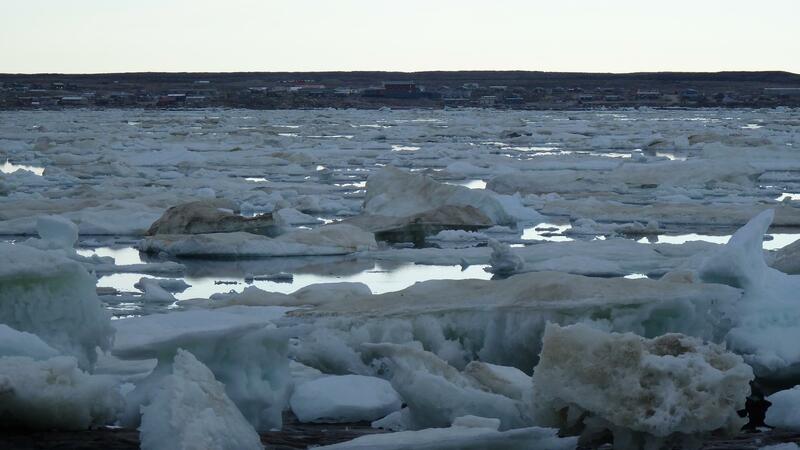 Around us large blocks of ice are shifting and breaking apart, as the water ebbs. 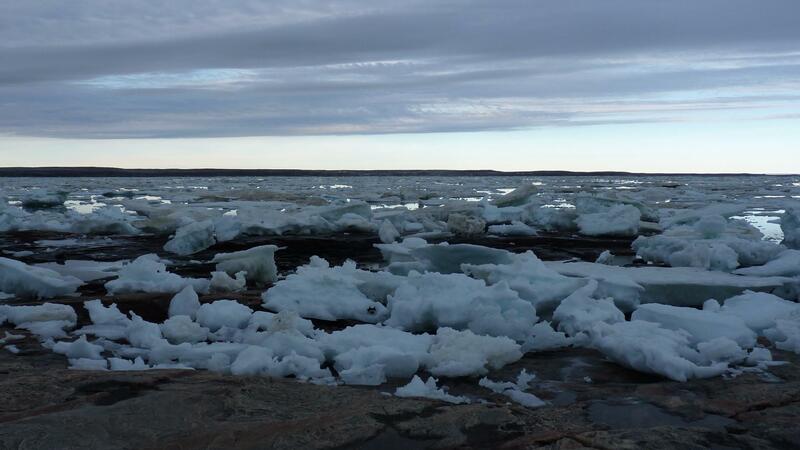 The loud bangs and accompanying surges of water as the ice shatters have begun to unnerve us. 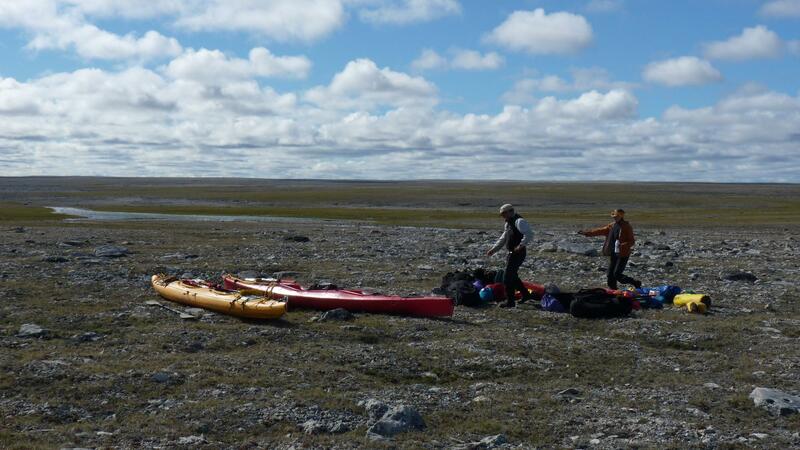 Having just experienced a near disaster, we are not keen to push on, even if our flight from Rankin Inlet to Yellowknife is just a day and a half from now. 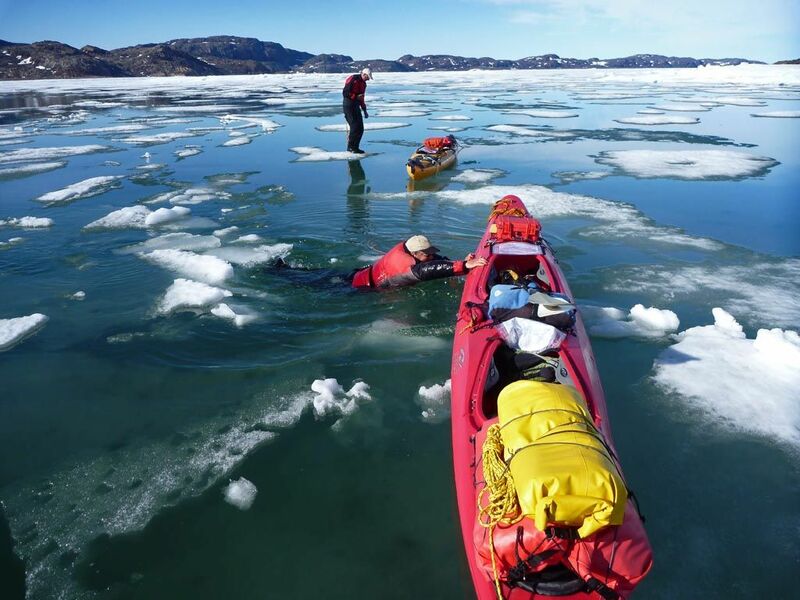 We would just have to work our way through the ice tomorrow, pay the fee and change the flight arrangements we had made months earlier. 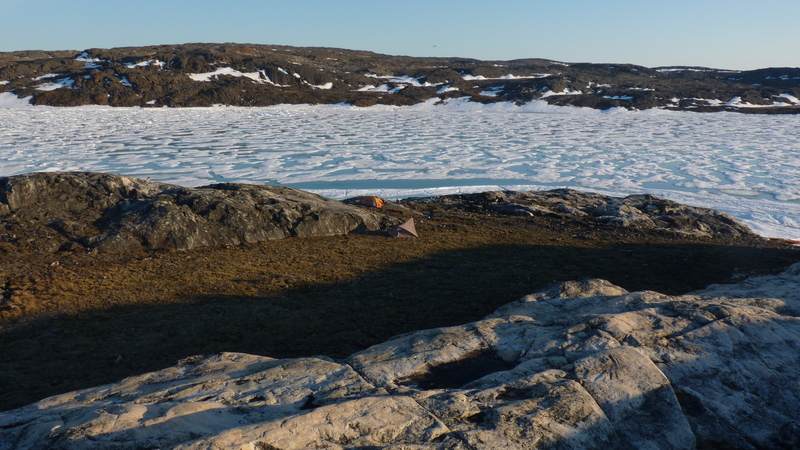 We had just set up camp when we hear the sound of a motorboat. 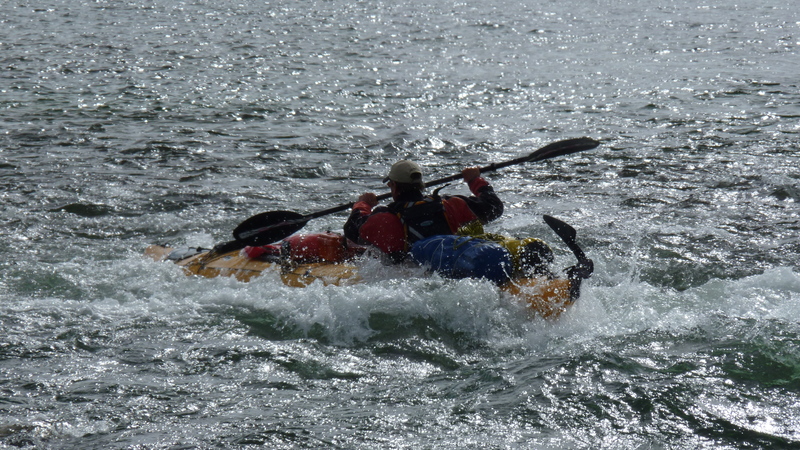 We run to the shore, wave and they come over. 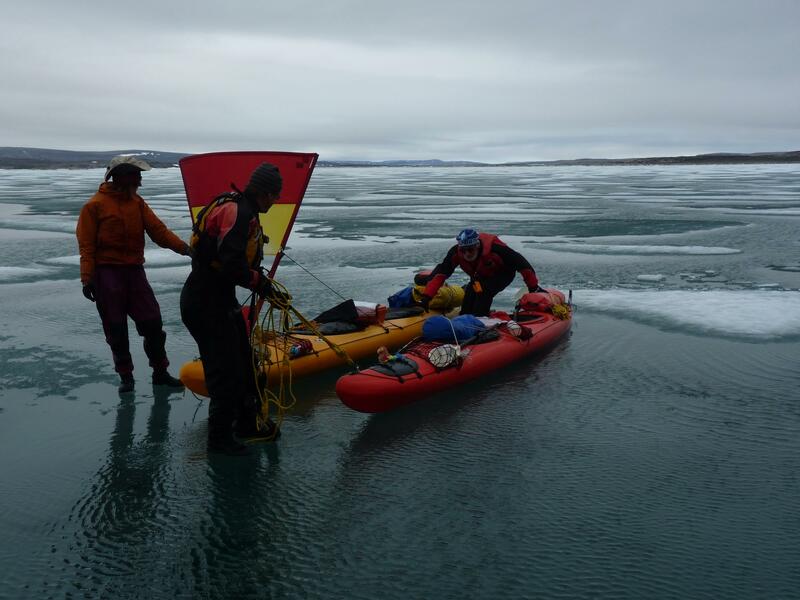 Jonah, his son Jamesie and friend Ernie managed to get through the ice earlier in the day and were now just returning to Repulse after a day of hunting. 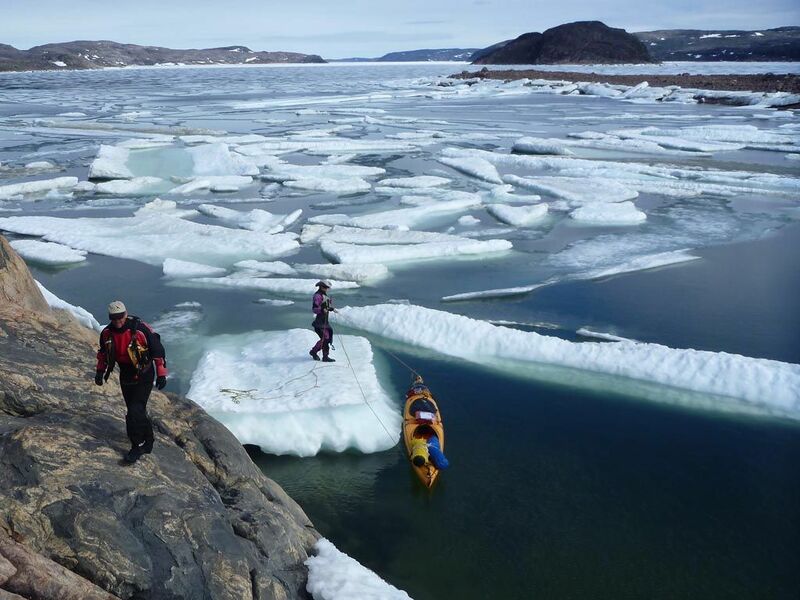 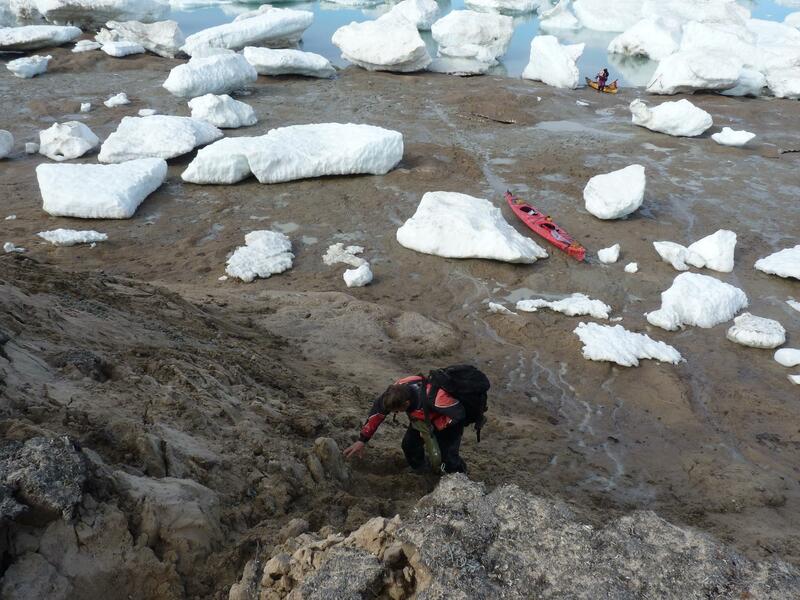 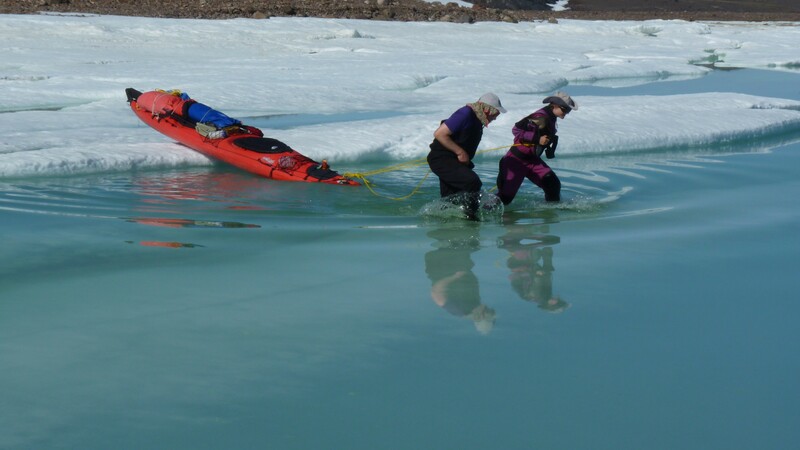 We ask about the ice conditions and enquire if we could follow behind them, explaining that it is easier to find a way through the ice standing on a boat than from water level sitting in a kayak. 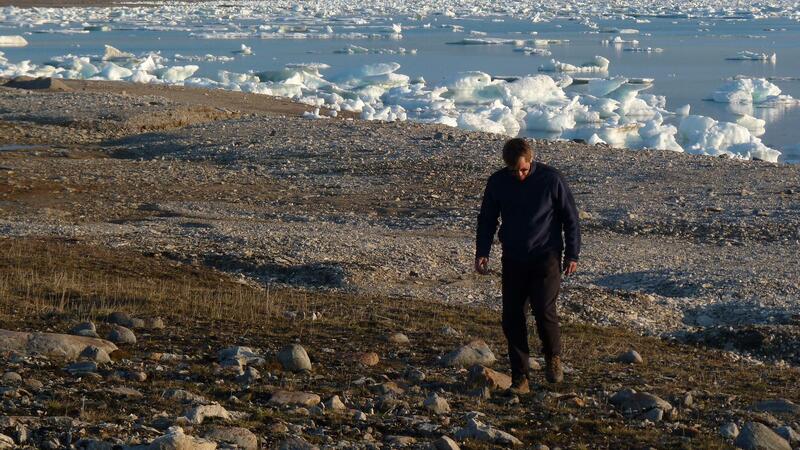 Jonah agrees to lead us through the maze, and looks for a spot where we can meet up with him. 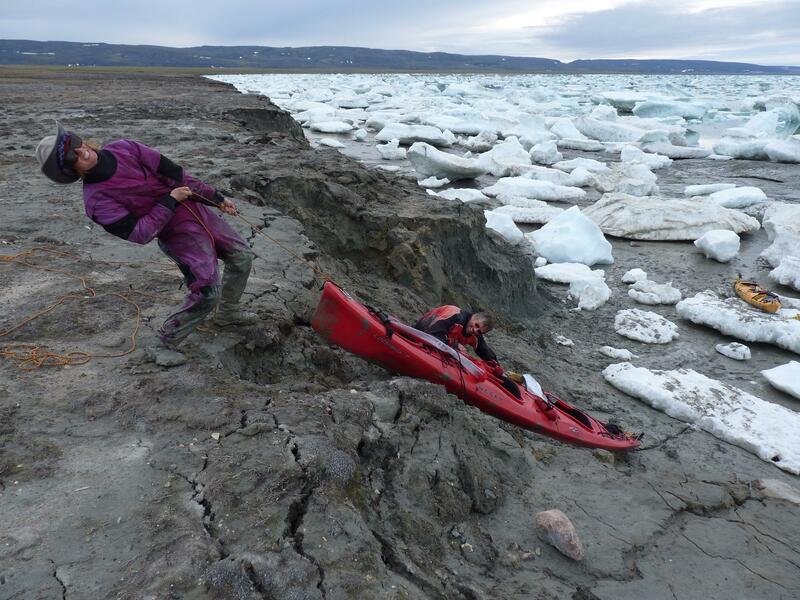 By now the tide is rapidly ebbing and finding a spot in chock-a-block ice is not easy; however, he manages to do so and we throw everything into Jonah’s boat and gamely follow behind. 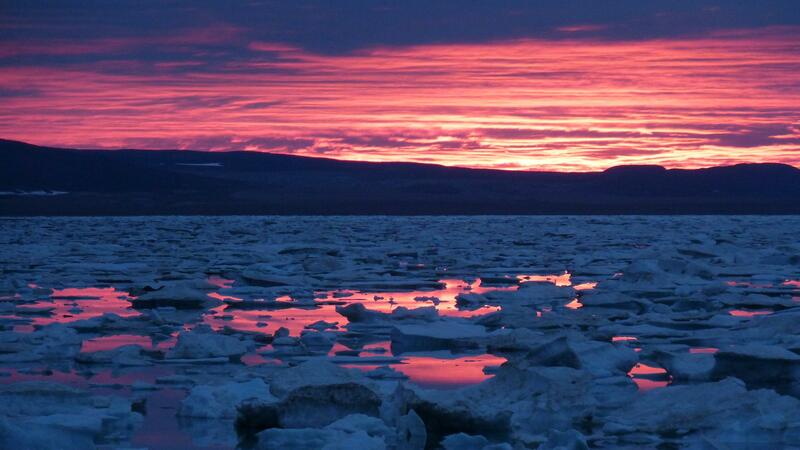 Just as it is getting dark, we reach Repulse. 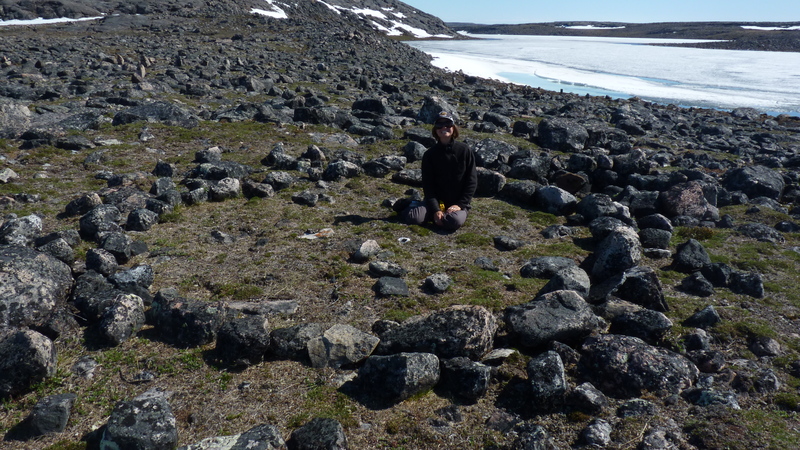 We feel as if Loki has been playing tricks on us the entire trip and finally at the last moment decides we’ve been good sports about it all and lets us through. 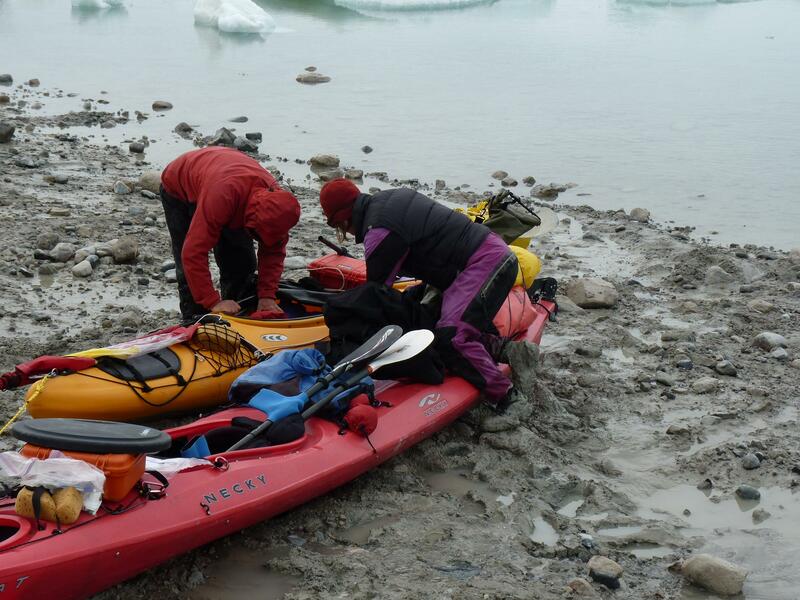 The next day we were able to make arrangements to fly out, make our flight connections and have our kayaks shipped back home. 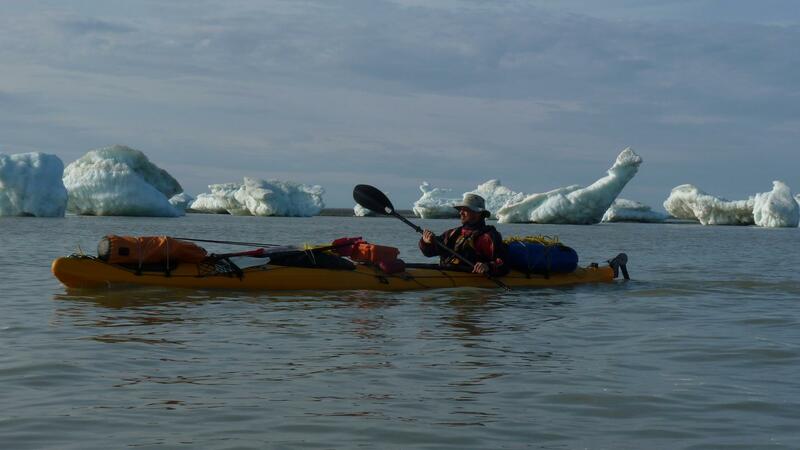 So ended a trip that began over six years ago, when I whimsically asked Chris while we were kayaking on the West Coast in 2005 what trip would he really like to do in the future. 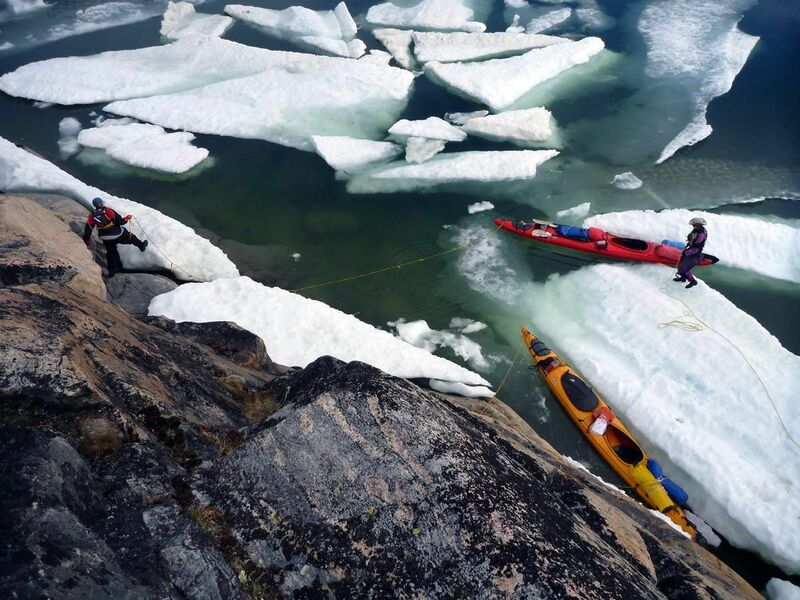 “Okay, let’s do it”. 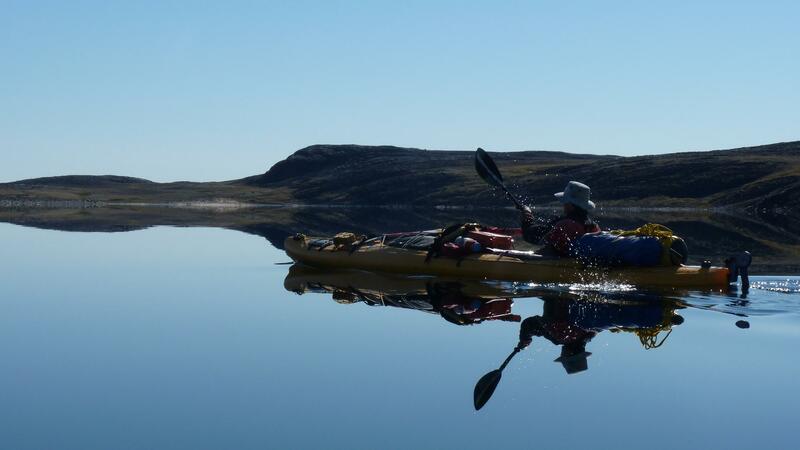 So began the idea of doing a self-powered trip, as self-sufficient as possible, from our homes in Calgary and nearby Cochrane. 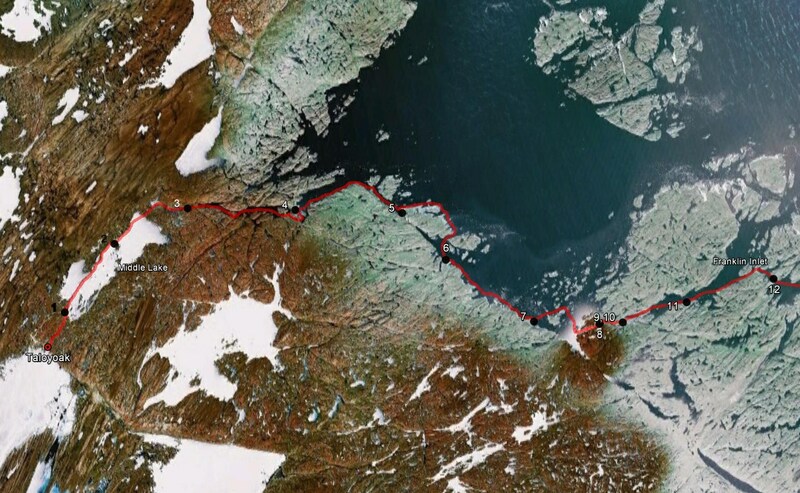 Although we had an idea of the trip route, we were not bound by a clockwise or counter-clockwise direction, or exactly which river system we would follow the next year. 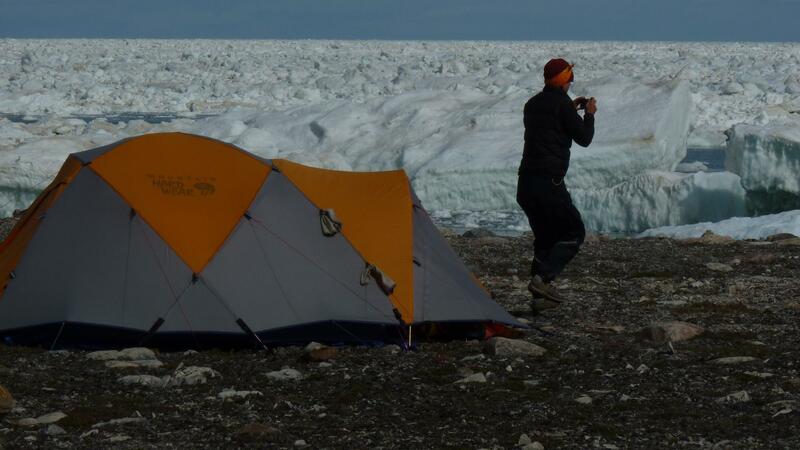 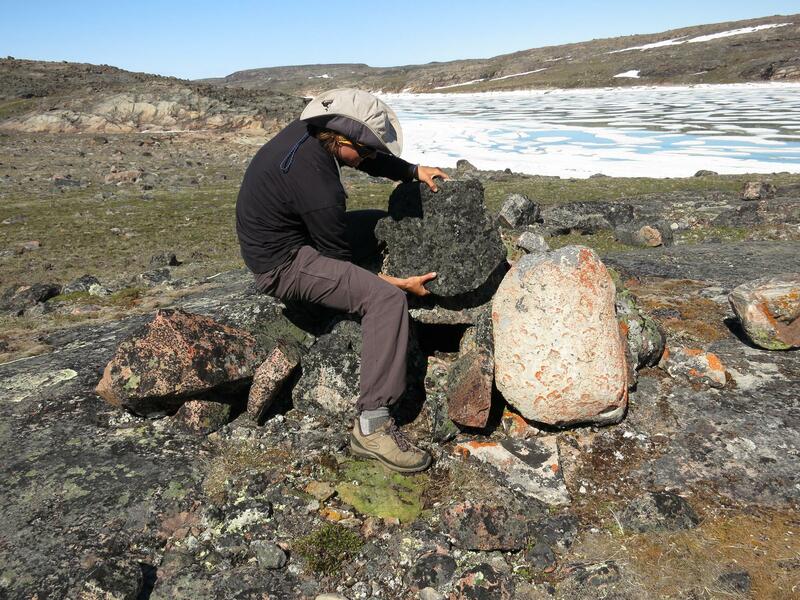 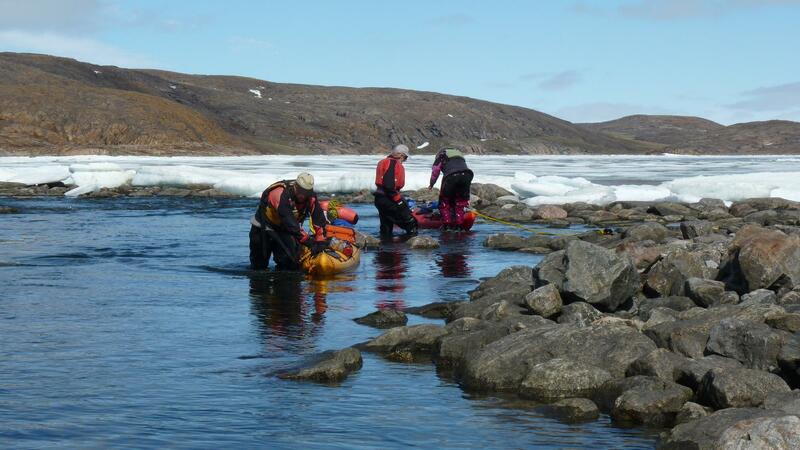 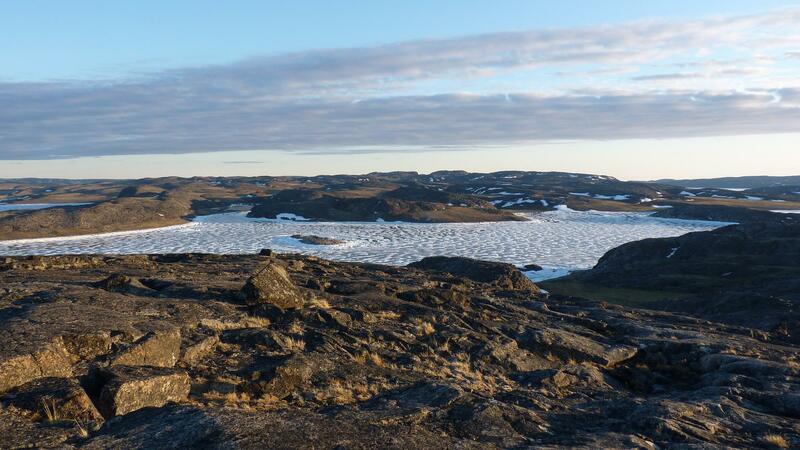 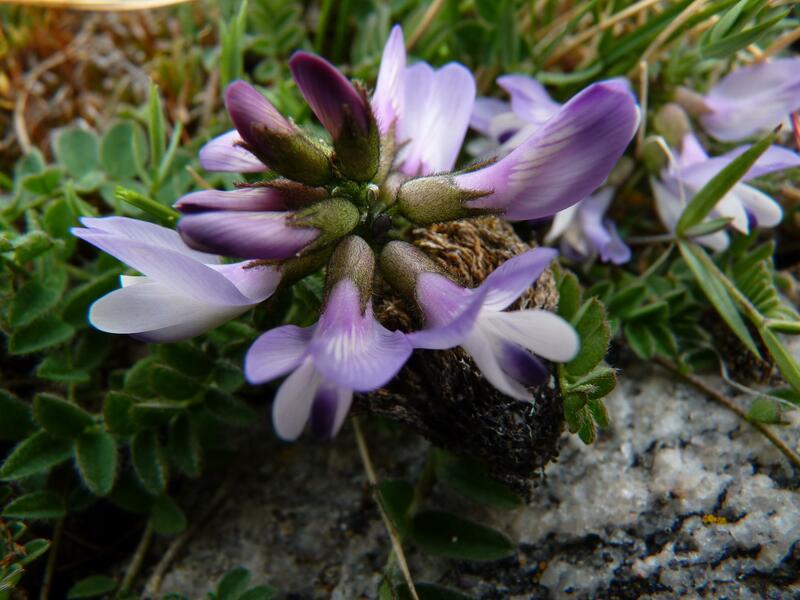 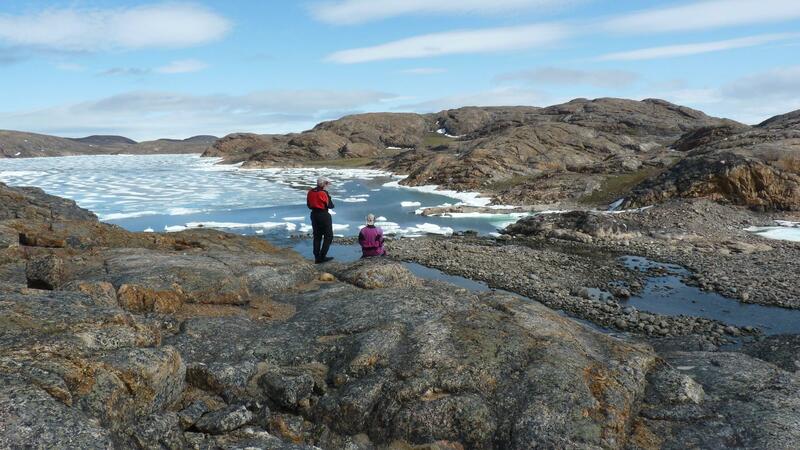 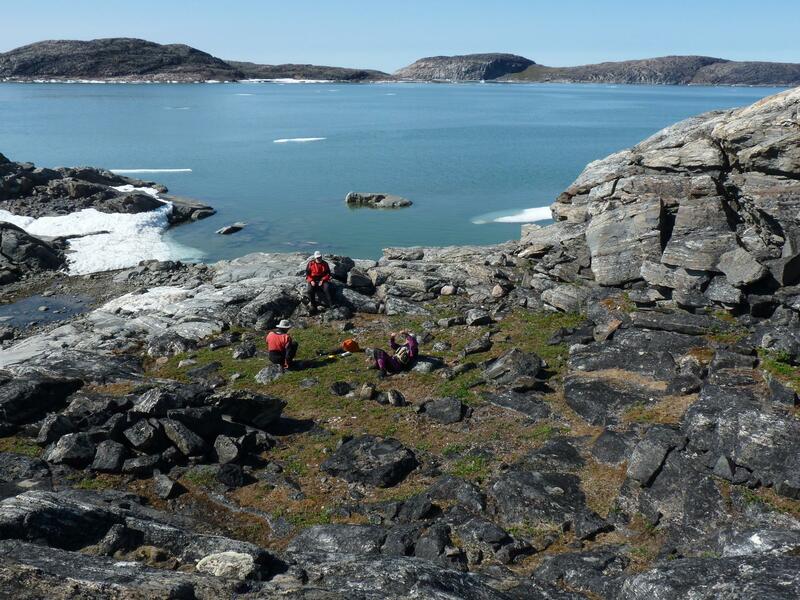 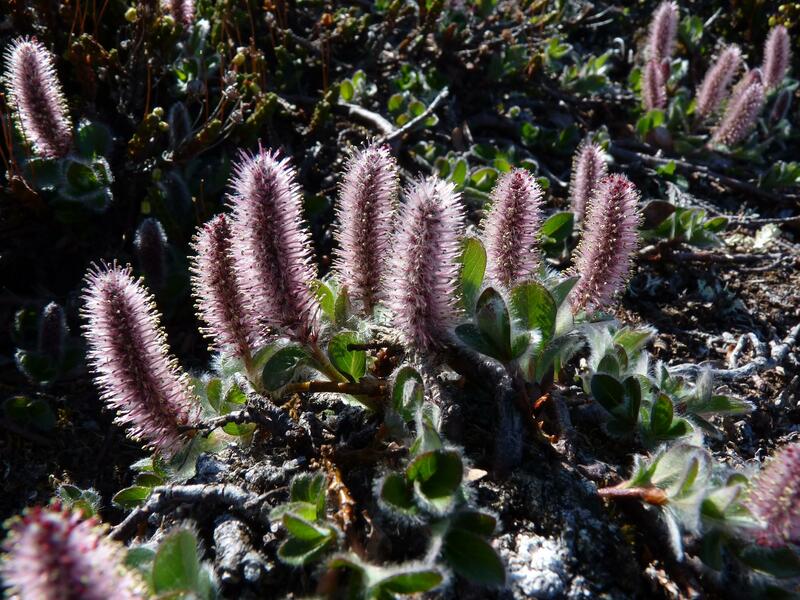 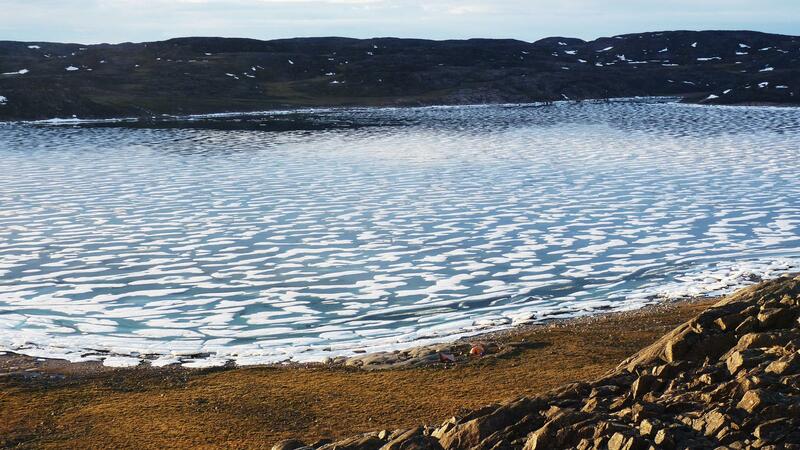 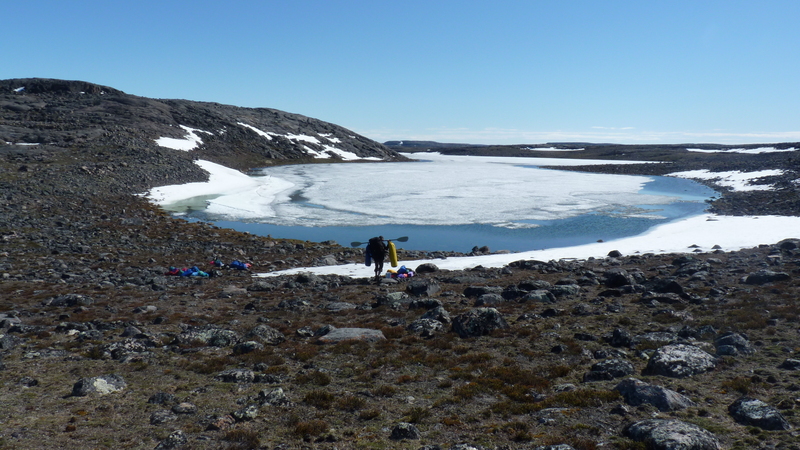 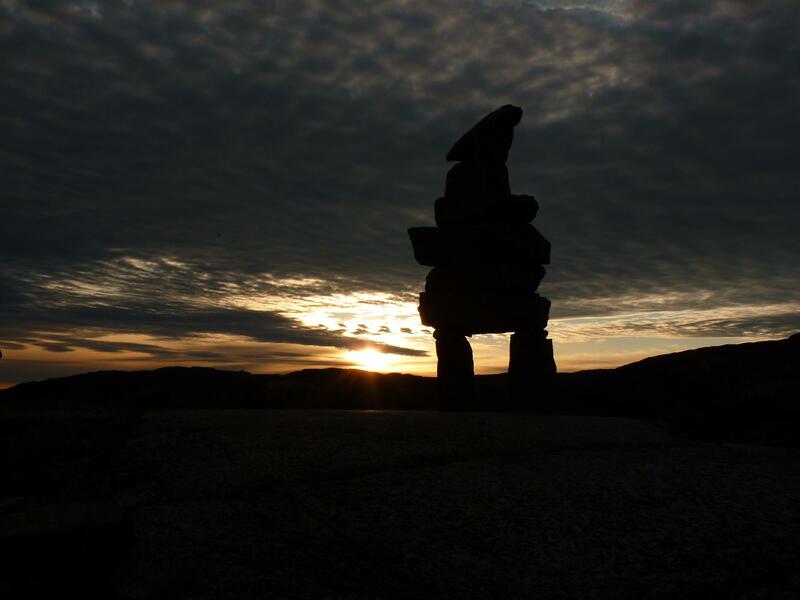 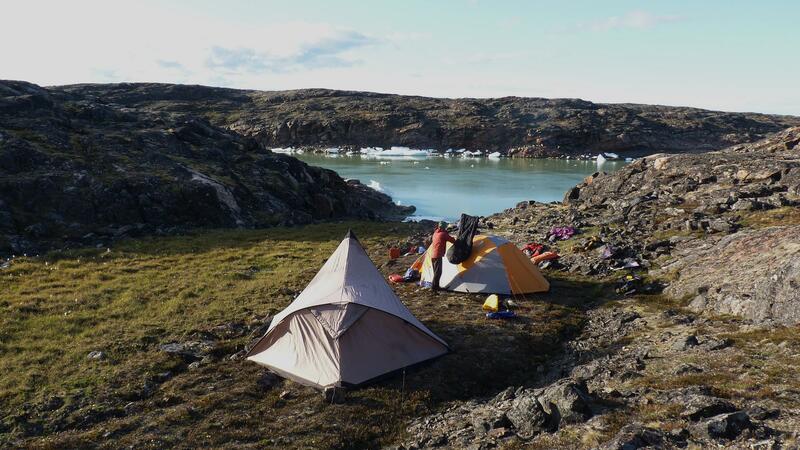 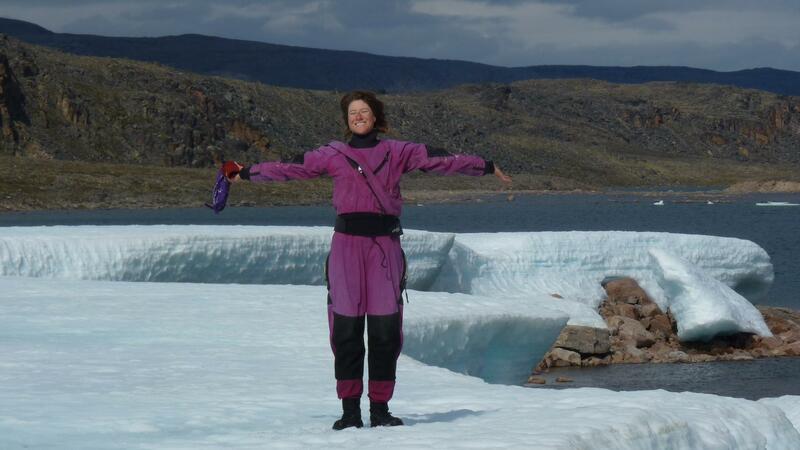 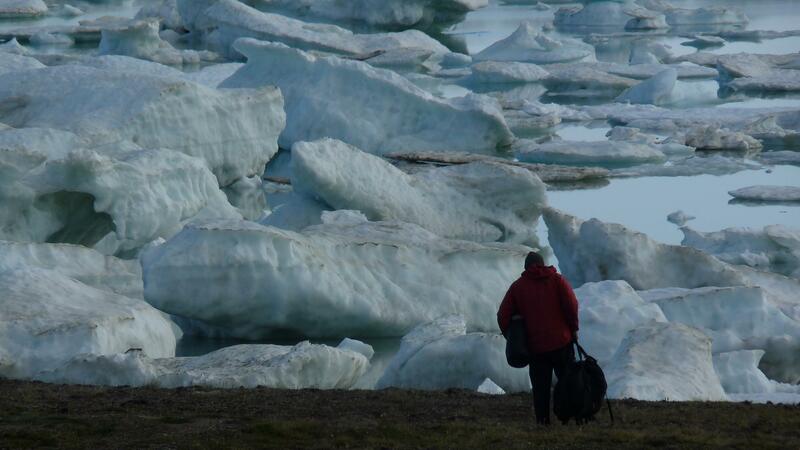 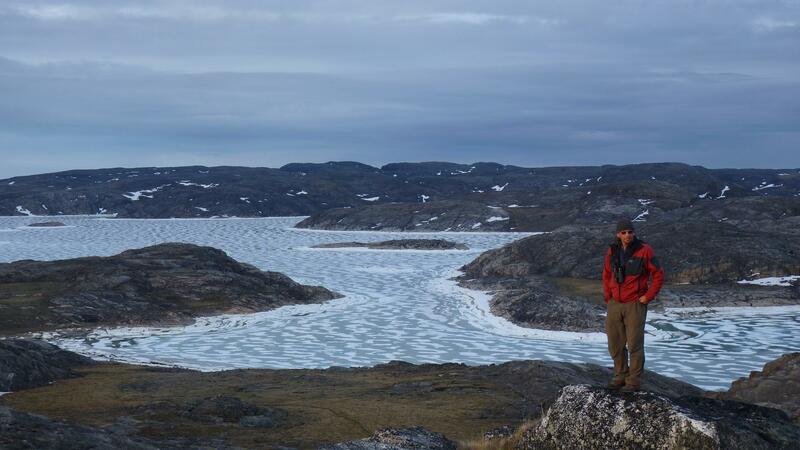 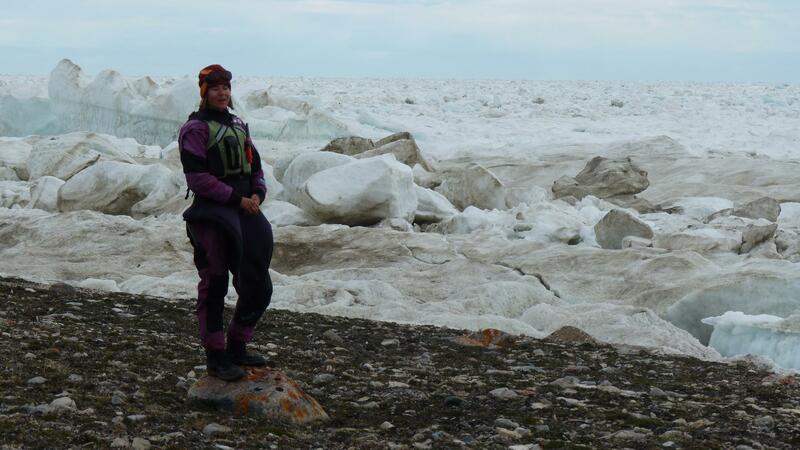 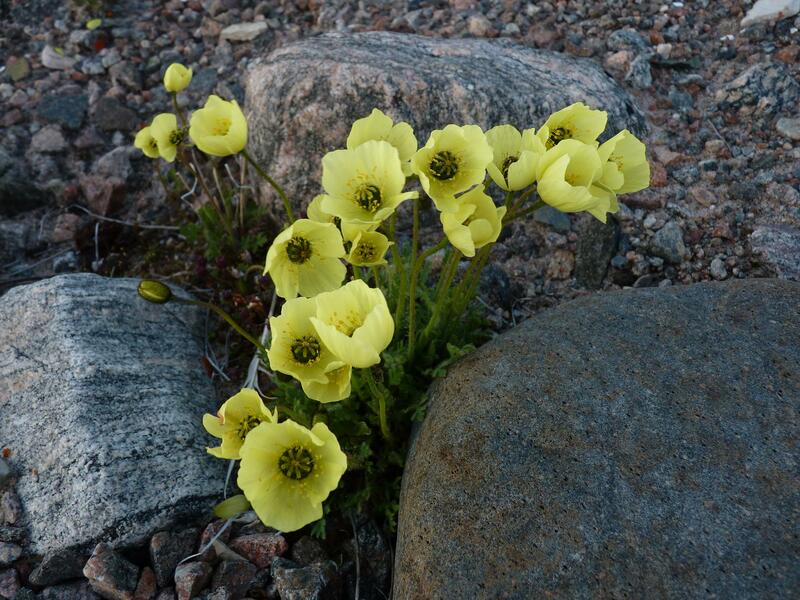 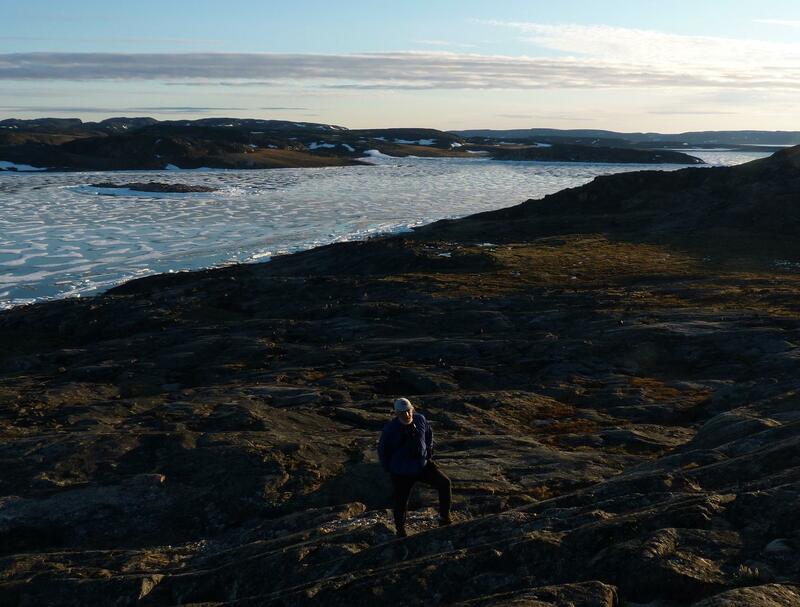 The trip grew from our experiences, and expanding knowledge of the land and ice conditions. 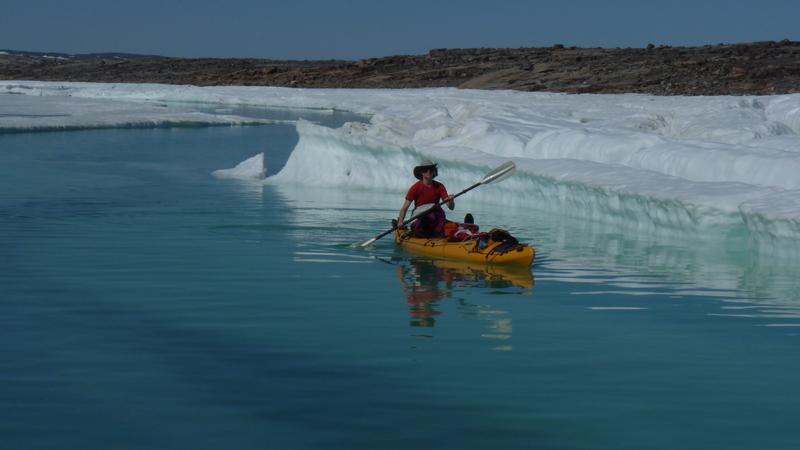 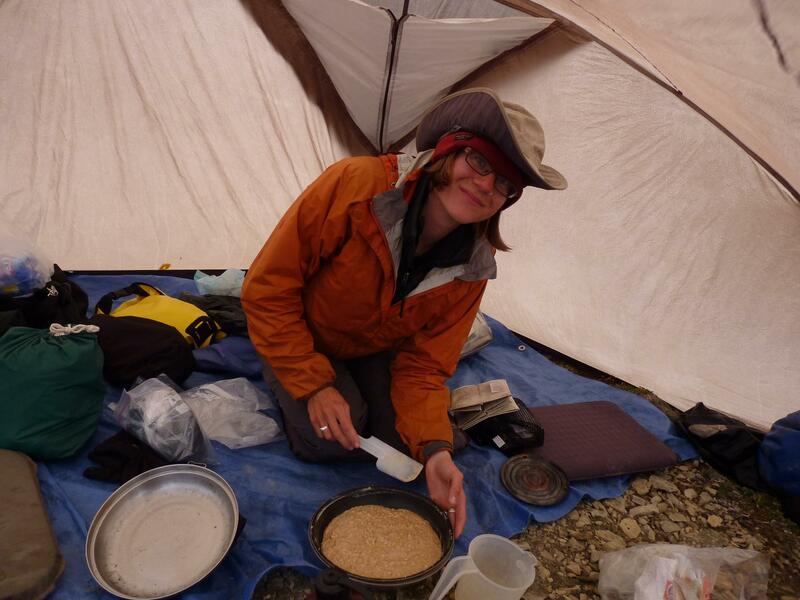 To re-cap, in 2006, we bicycled to Jasper, and canoed from there to Yellowknife via the Athabasca and Slave Rivers and across Great Slave Lake; in 2007, my daughter Susan joined us, and we kayaked from Yellowknife to Chesterfield Inlet, via the Hanbury and Thelon Rivers; in 2008, Chris and I kayaked along the shore of Hudson Bay from Chesterfield Inlet to Repulse Bay. 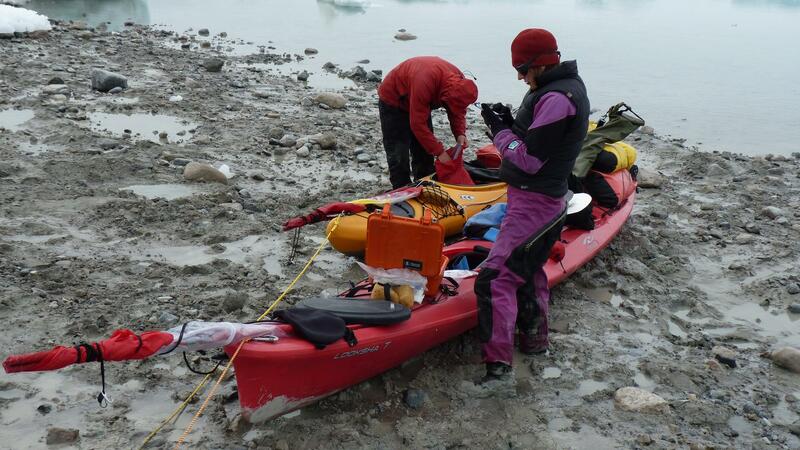 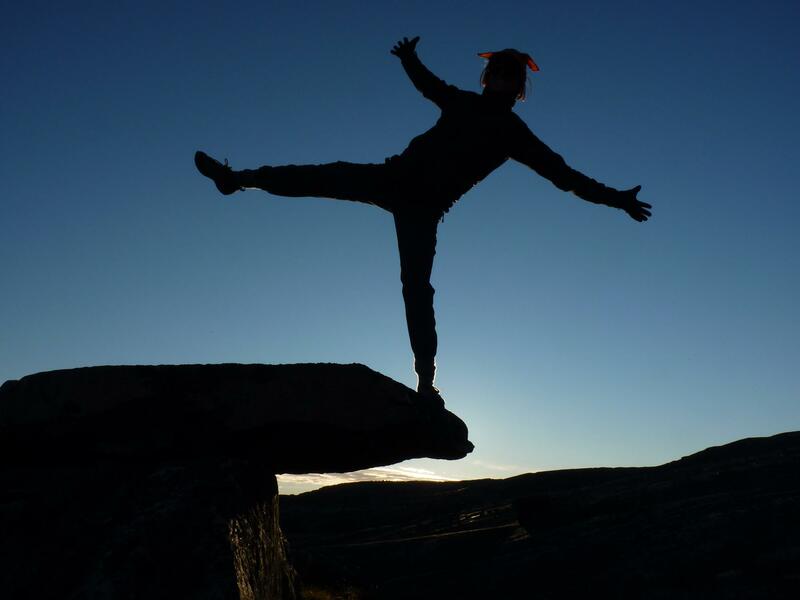 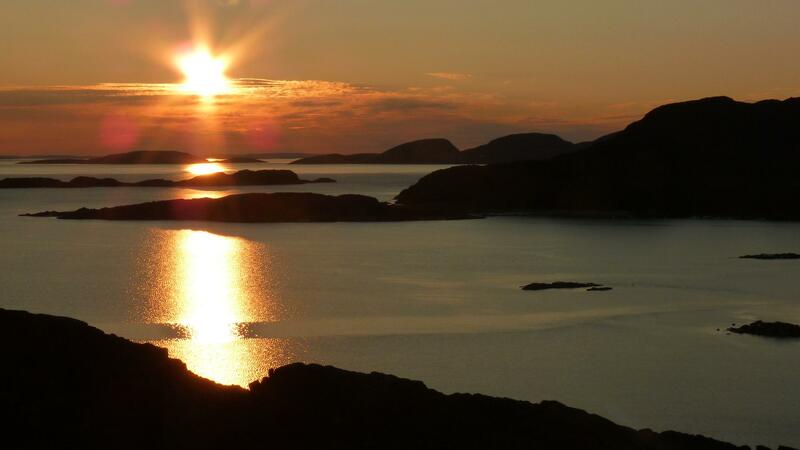 In 2009, owing to hip problems Chris was experiencing, we postponed the next leg of the trip. 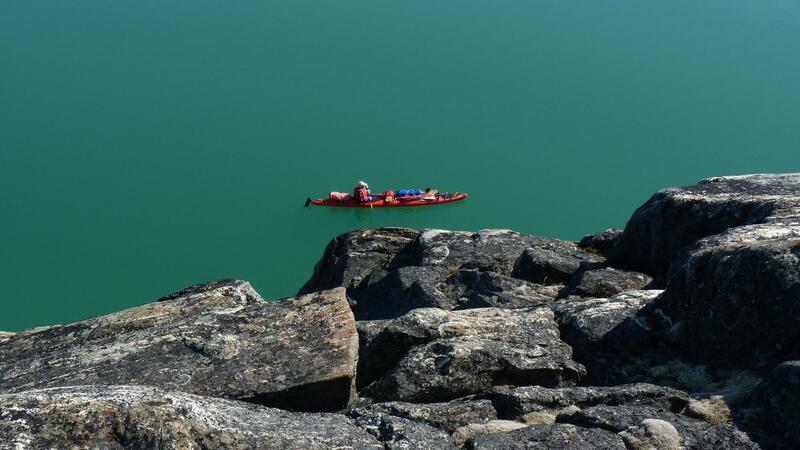 Instead, that year Susan and I canoed from Calgary to Lake Winnipeg. 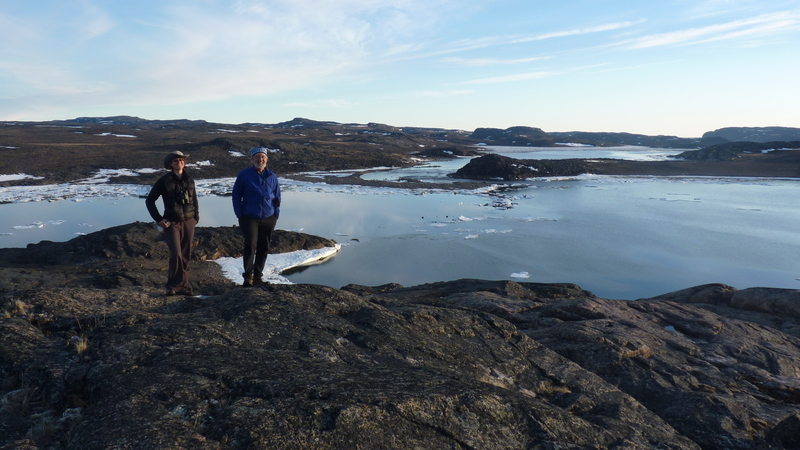 In 2010, Susan, Chris and I were joined by Elisa Hart and, for the first three weeks, by Sandy Briggs. 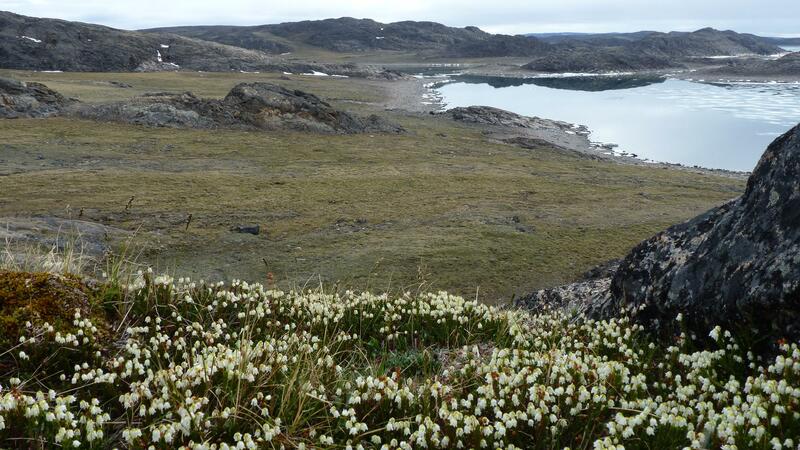 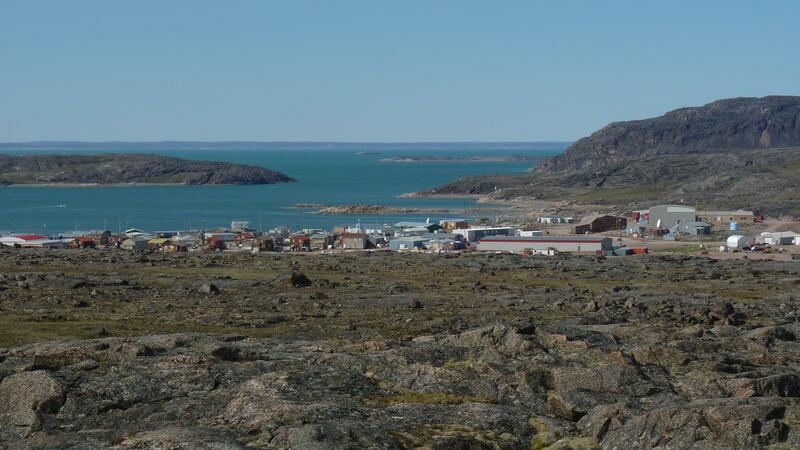 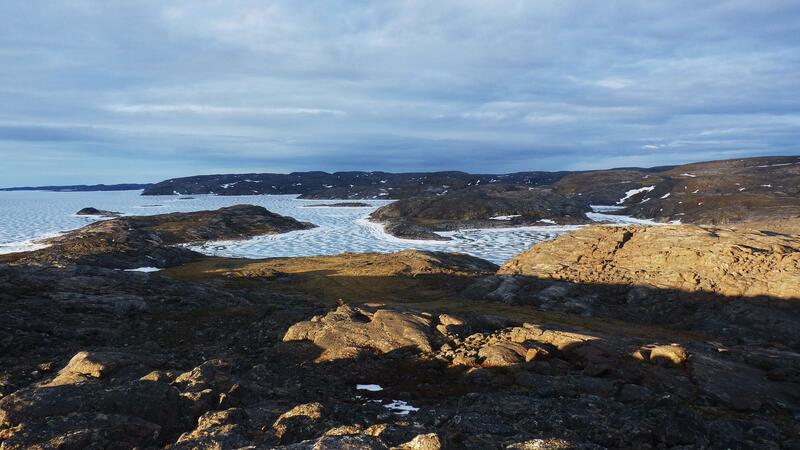 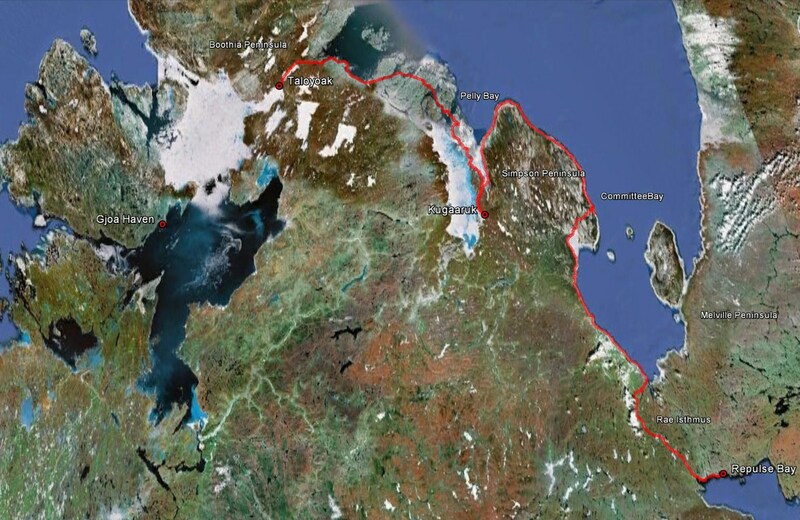 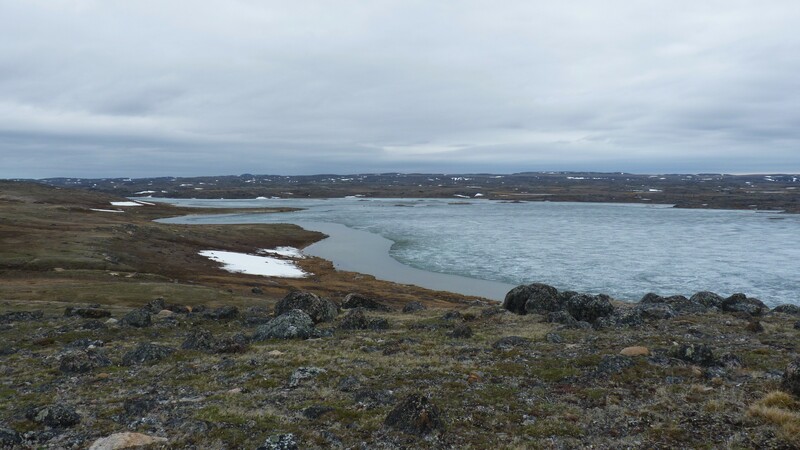 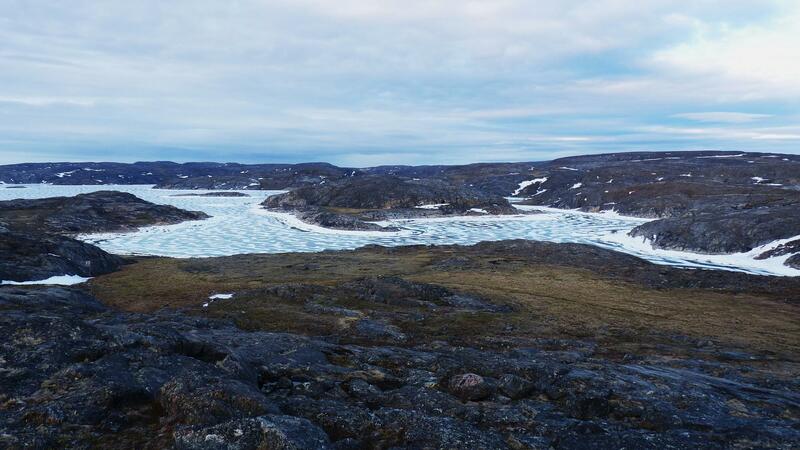 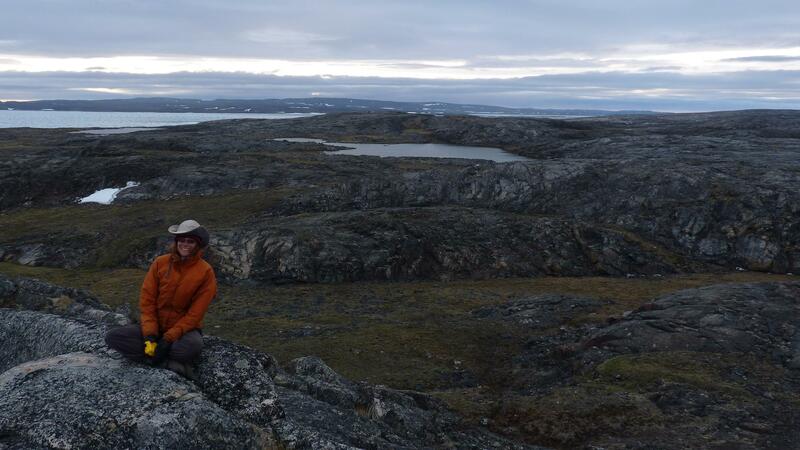 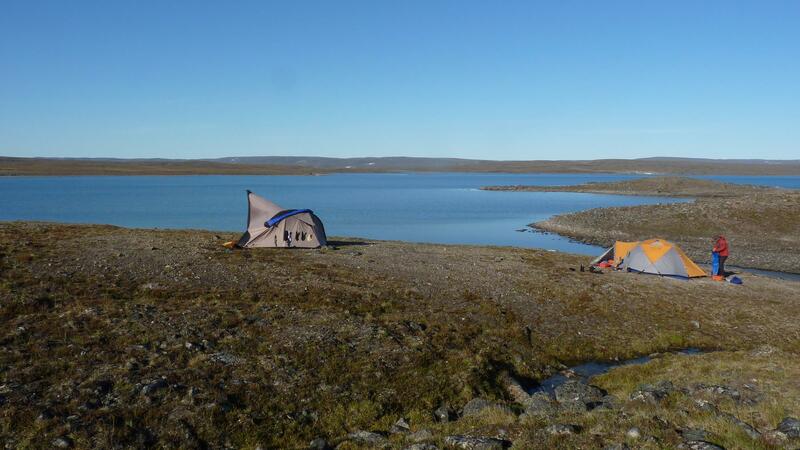 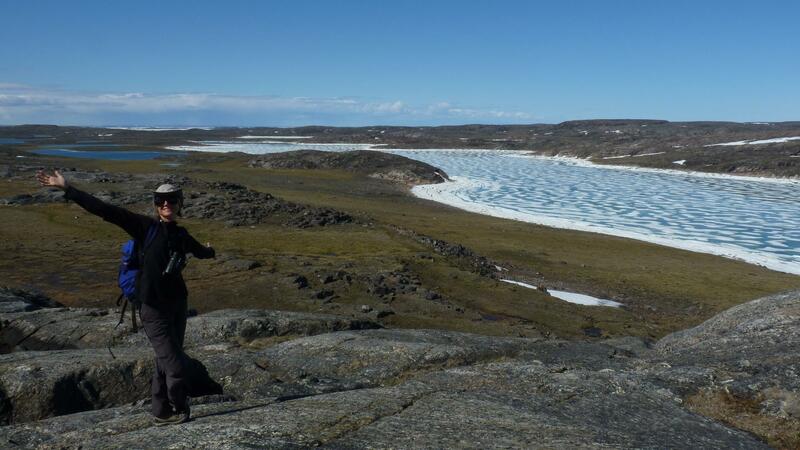 We traveled up the North Arm of Great Slave Lake to Great Bear Lake via the Marion and Camsell Rivers, and from Great Bear Lake to Kugluktuk via the Dease River, Dismal Lakes and the Richardson River. 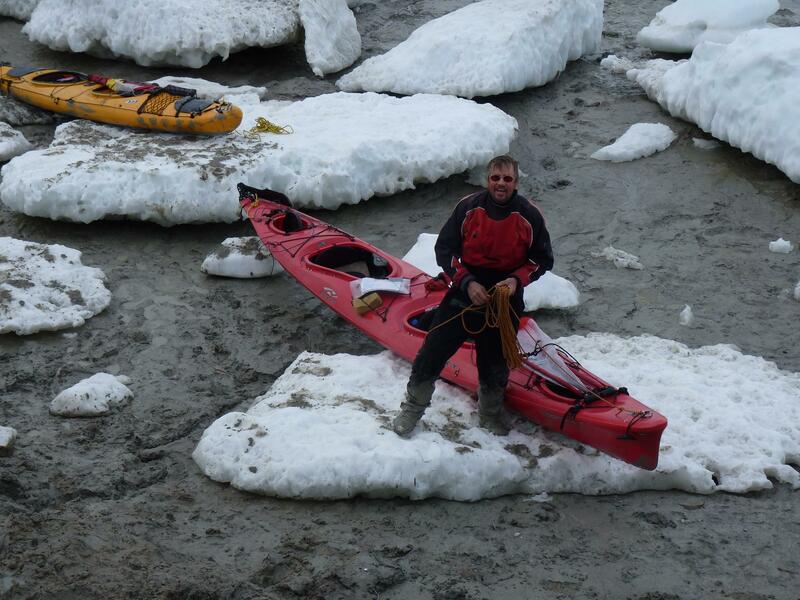 Last year, Chris was unable to continue with us owing to a recent hip operation. 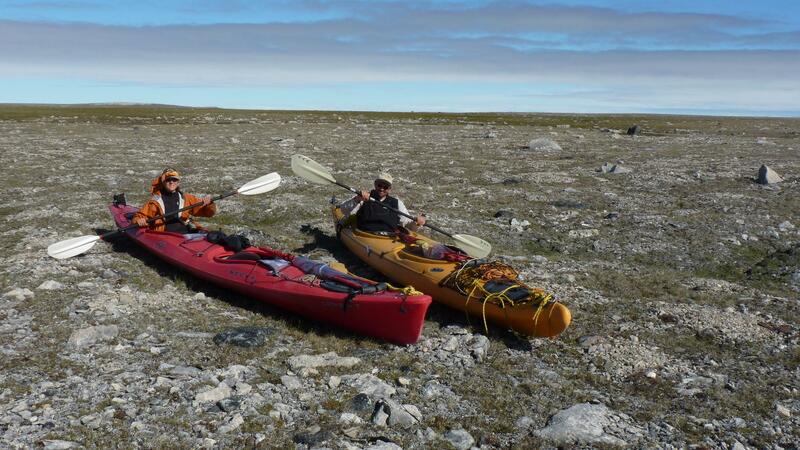 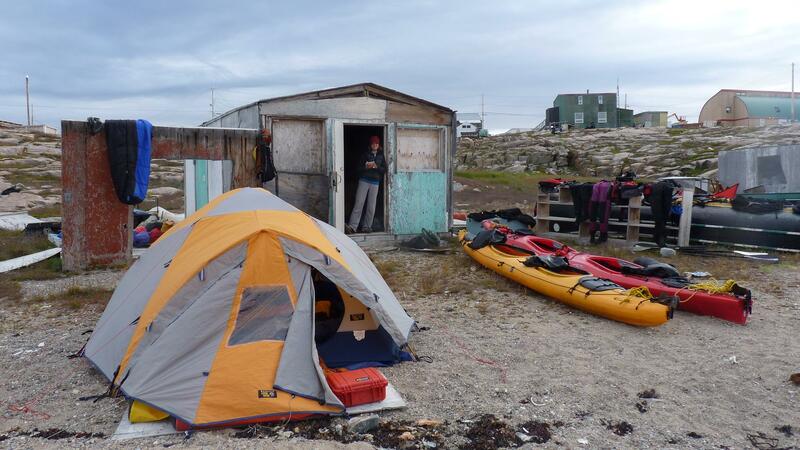 Susan and I were joined by Eric Binion and Karl McEwen and we kayaked from Kugluktuk to Taloyoak. 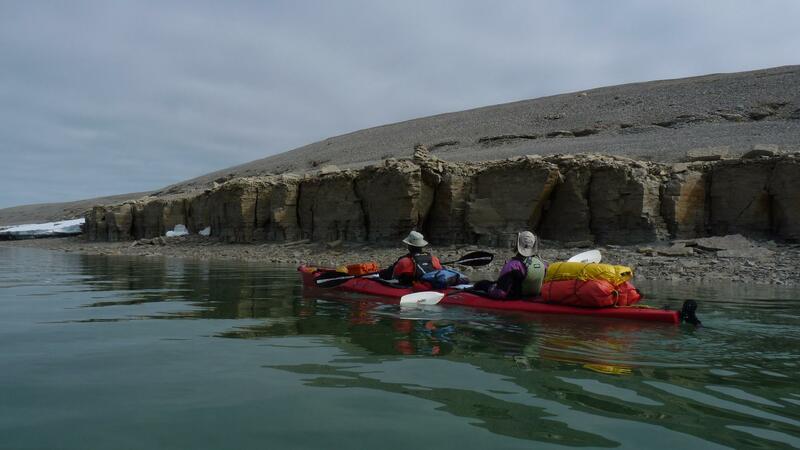 Sandy Briggs joined Susan, Chris and myself for the first three weeks of this year’s trip. 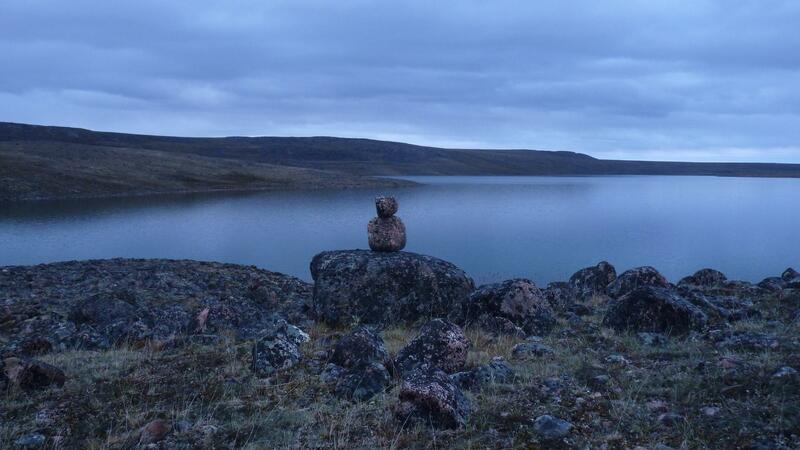 Owing to other commitments, he had to leave us at Kugaaruk. 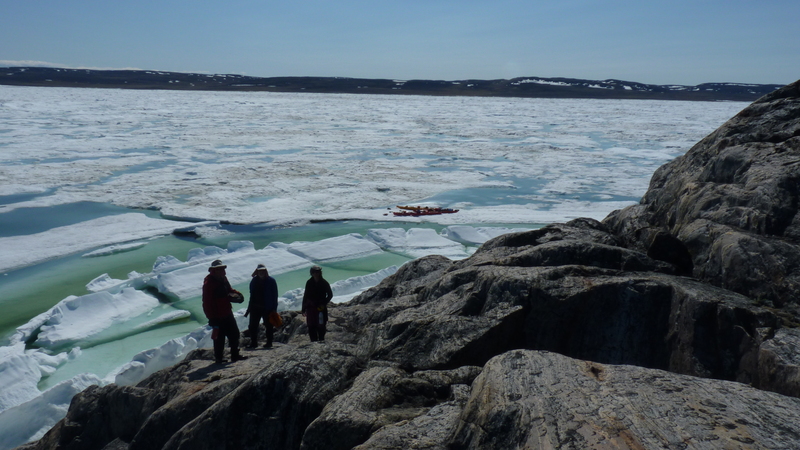 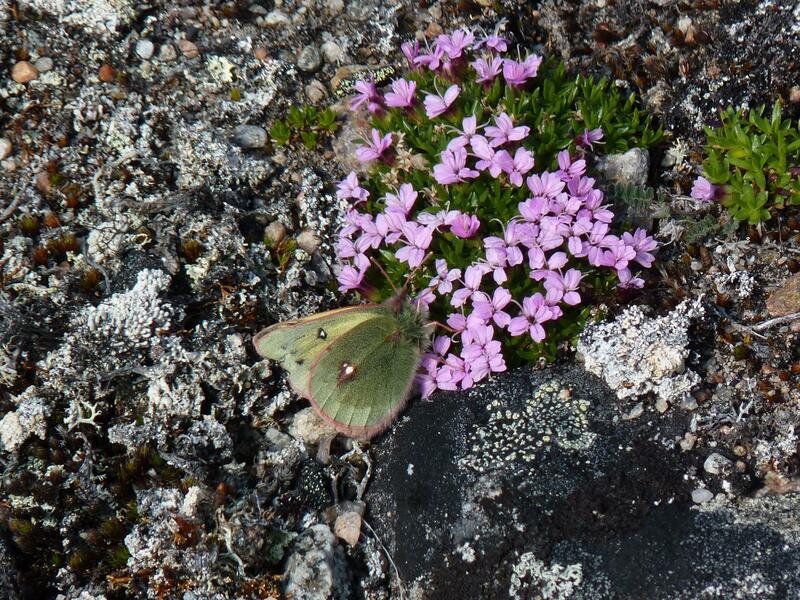 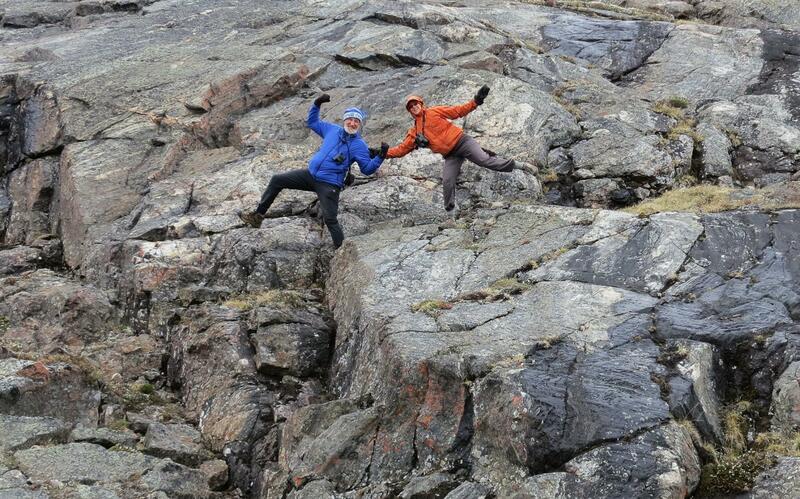 The trip didn’t quite end when we returned to Yellowknife. 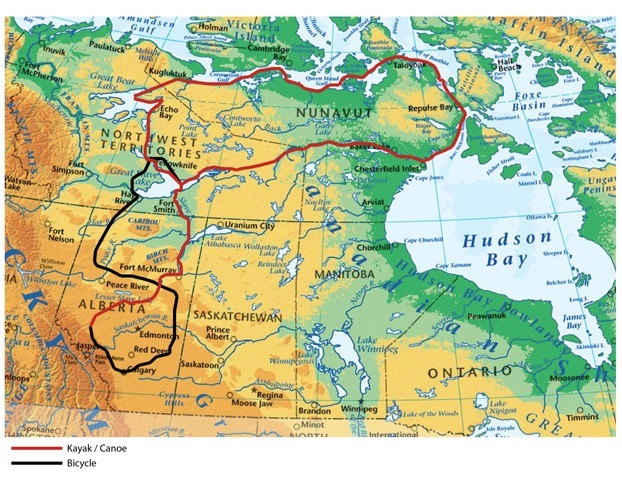 For the sake of completeness and because I (Bob) like drawing lines on maps, I bicycled back home to Calgary from Yellowknife. 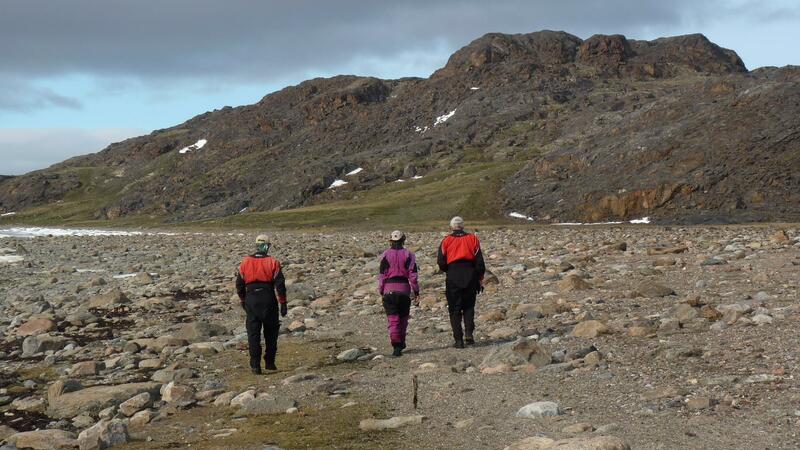 At the end of a journey friends and family congratulate us for completing a trip in such a seemingly wild place, a place that, to them, is often as foreign as a far away country. 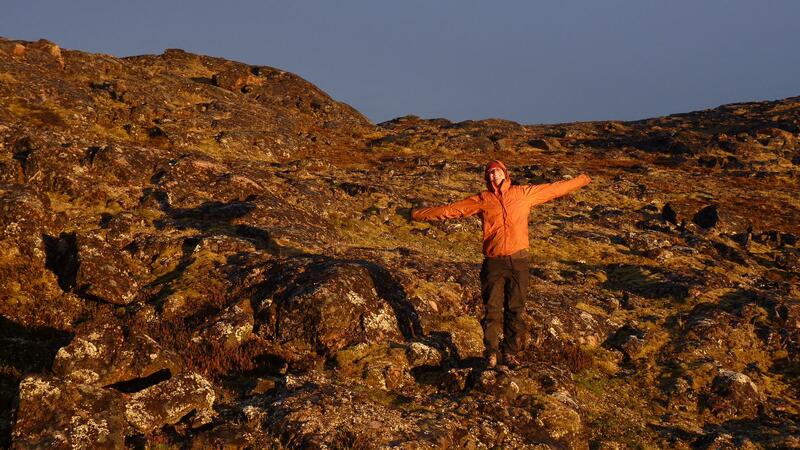 Hearing such praise, it is very easy for us to think how wonderful we all are, what awesome trips we do and subsequently, how amazing we must be for doing them. 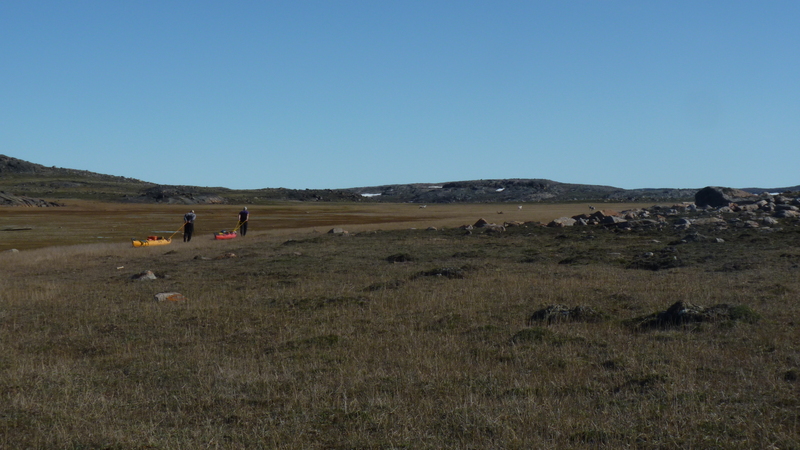 But before we pat ourselves too heartily on the back, it would be good to think of the original inhabitants who did these trips long before us. 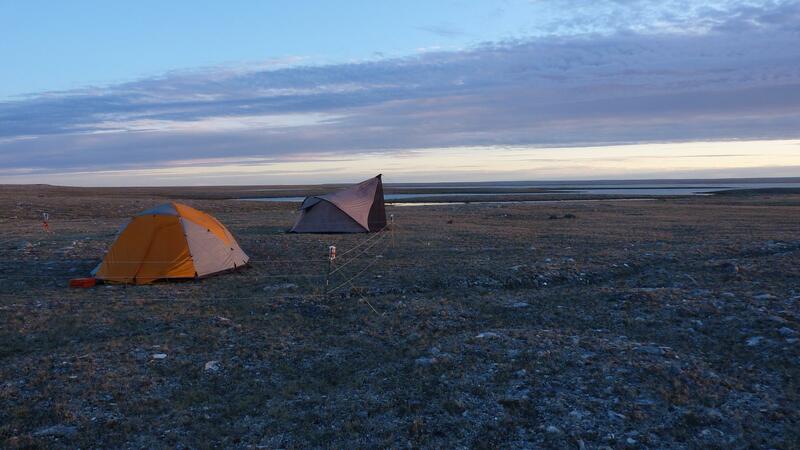 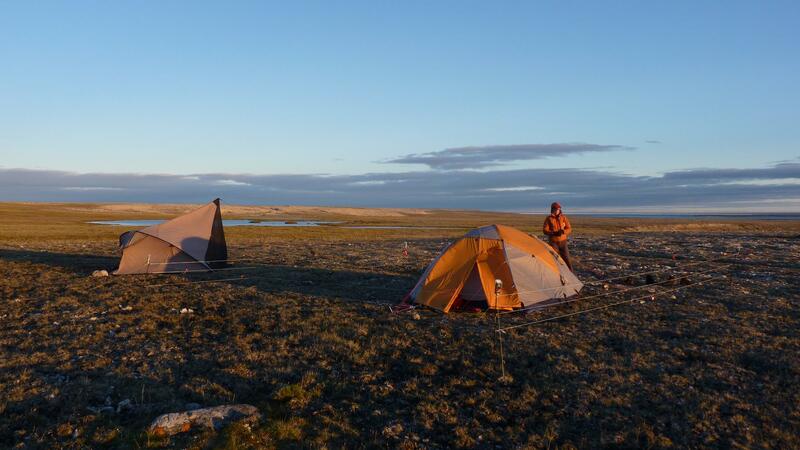 The Arctic is often described as vast and empty, but we were always kept company by tent circles, winter caches, animal traps, innumerable inuksuks, cairns for navigation, cairns for herding caribou, and other artifacts, which reminded us that the land upon which we were travelling had been used and navigated for thousands of years. 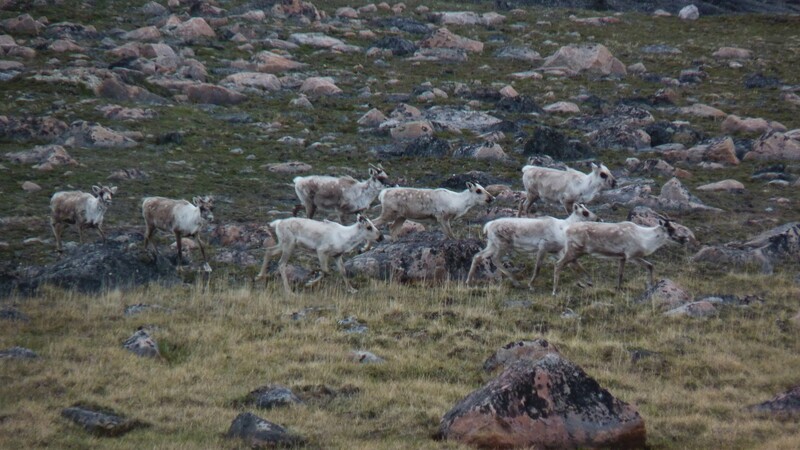 It is upon their trails, through their camps, and in their hunting grounds where we found ourselves. 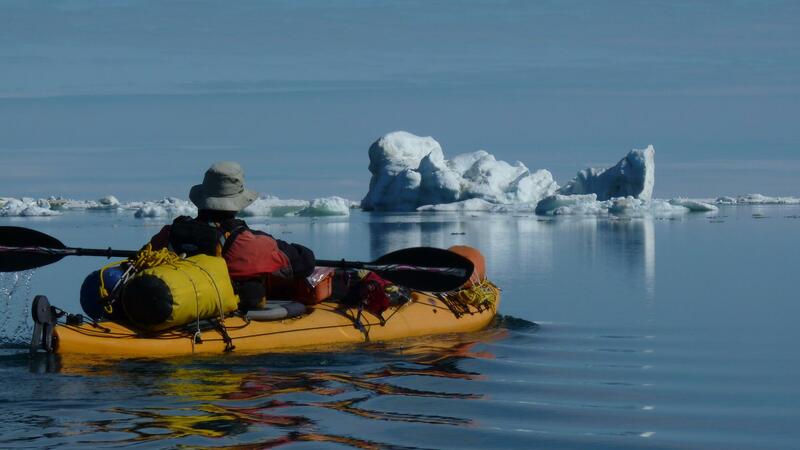 Early explorers also were traveling these routes before us, without the aid of maps, GPS units, satellite phones, modern clothing and equipment, airplanes, and often with minimal or no food. 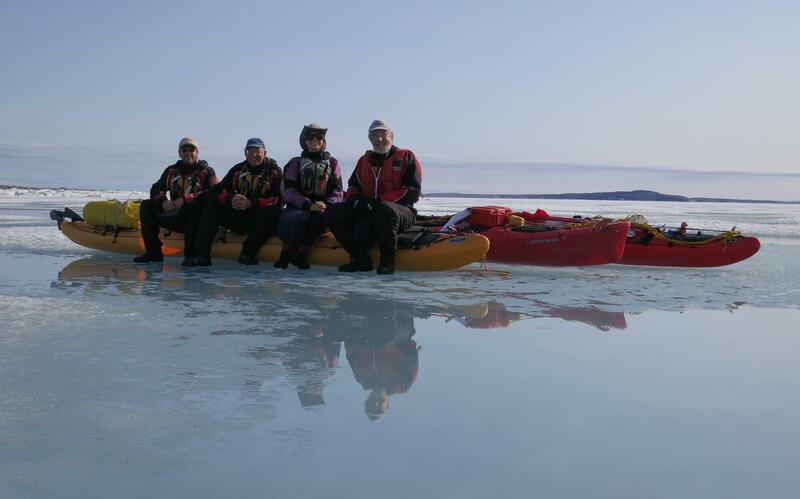 We have had the good fortune to have traveled the same paths as many well-known explorers and adventurers whose names have become woven into the fabric of Canadian history and culture – Hearn, Franklin, Richardson, Rae, Back, Simpson, Dease, Tyrell, Hanbury, Douglas, Amundsen, among others. 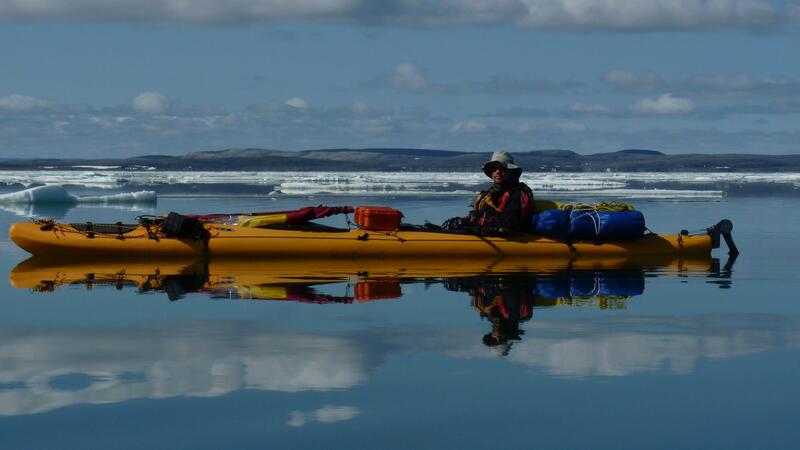 All have written wonderful (and well worth reading) books describing their adventures. 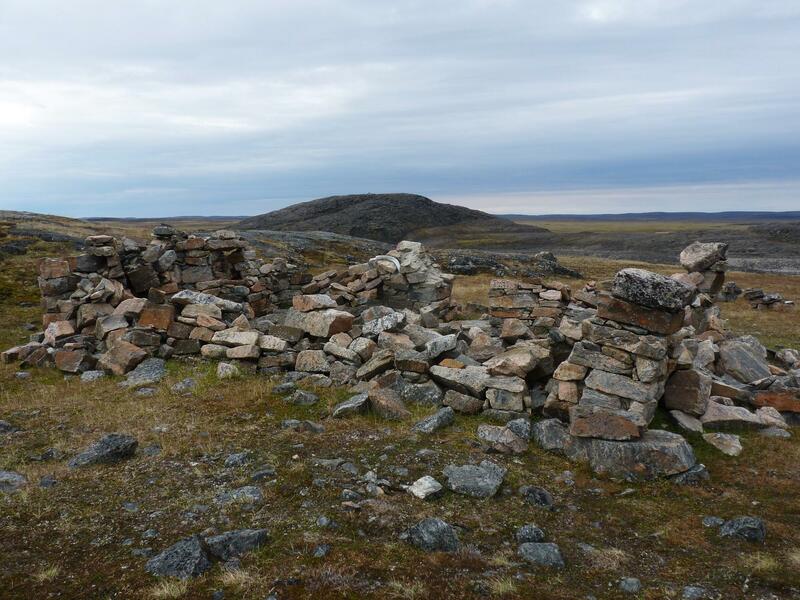 Imagine, for a moment, the journey of Thomas Simpson, who walked, in winter, from the Red River Colony (near present day Winnipeg) to Fort Chipewyan, spent two winters at Fort Confidence on Great Bear Lake, and along with Peter Dease, explored the Arctic coast as far as the Boothia Peninsula to the mouths of the Castor and Pollux Rivers. 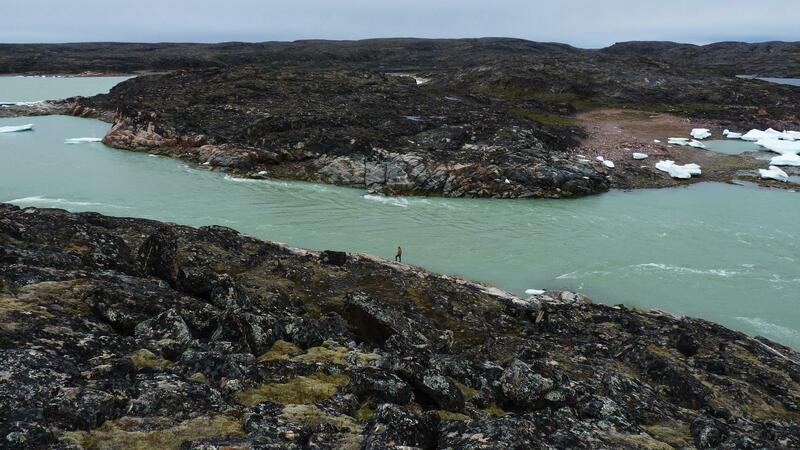 When that trip was over, he walked back, again in winter, to the Red River Colony. 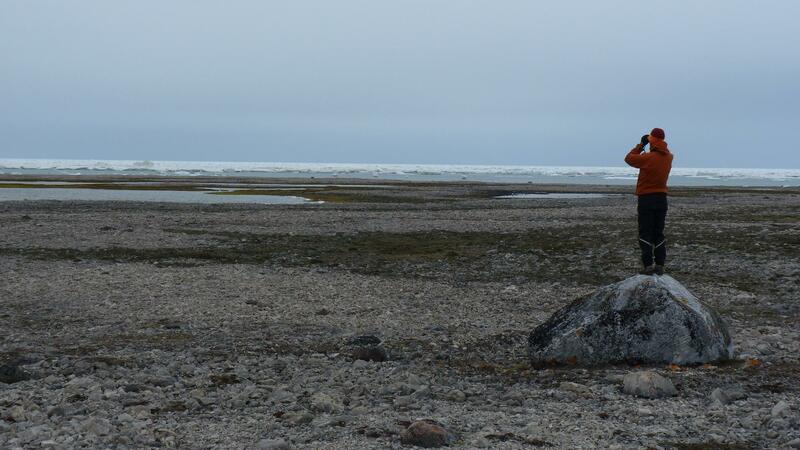 (As an aside, had Simpson not died under mysterious circumstances after reaching Red River, he would have had permission to continue his exploration and quite likely would have discovered the key to the North West passage and John Franklin might possibly have become a mere footnote in Canadian history, no more well known than himself). 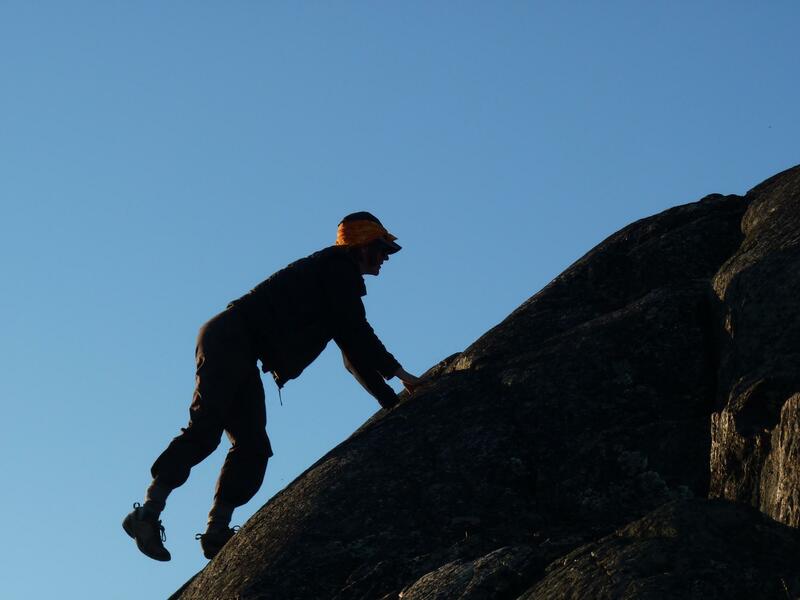 Simply stated, our own little journeys pale in comparison to those who have come before us. 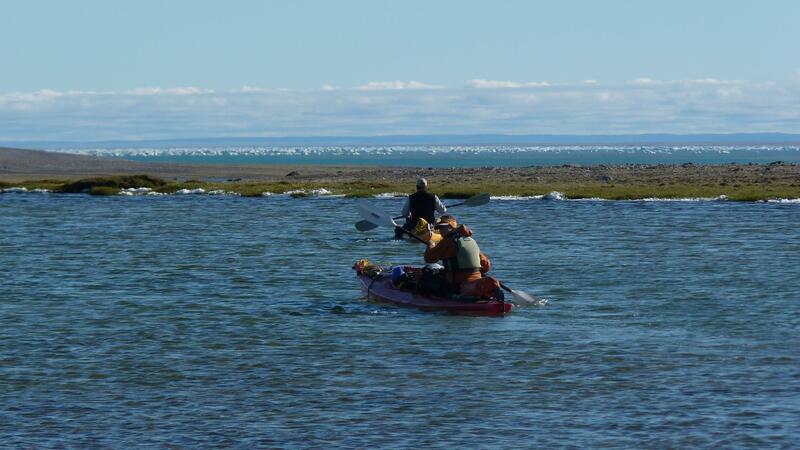 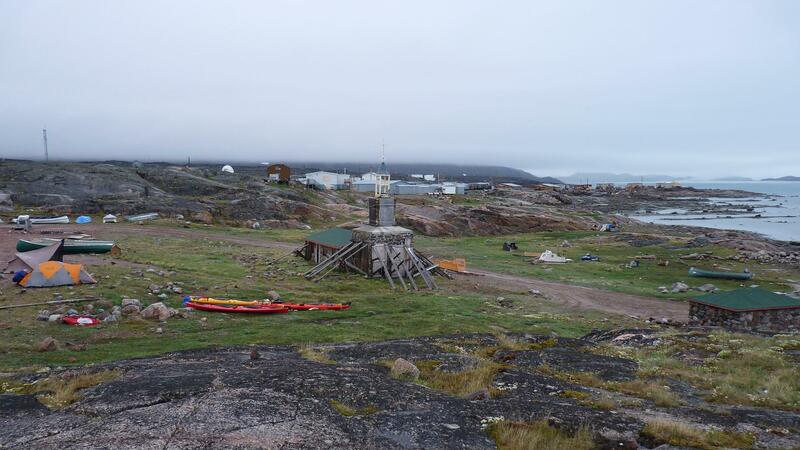 Earlier I mentioned that we were pinned down in early August for two days by strong winds at Keith Bay. 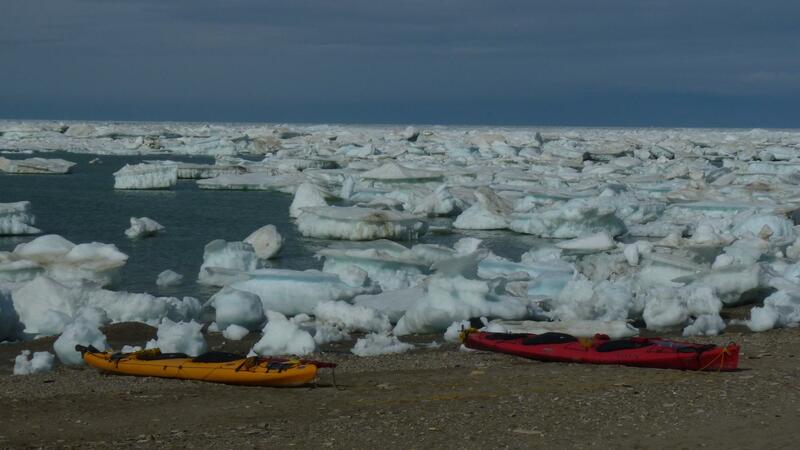 This coincided with what is now being called, “The Great Arctic Cyclone of 2012”. 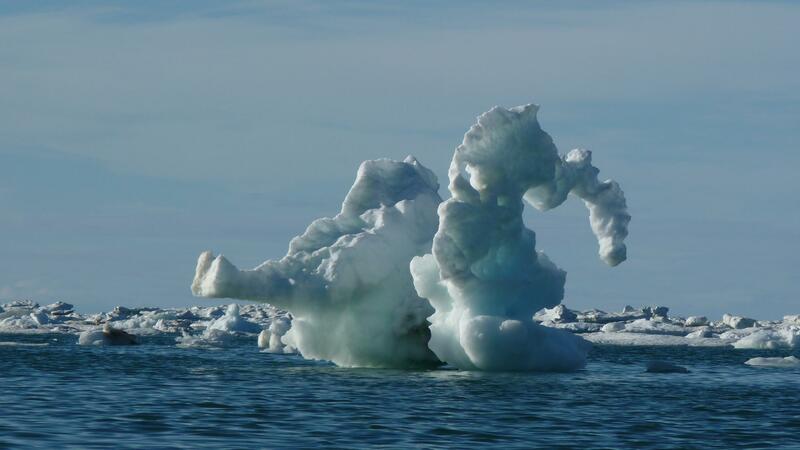 Arctic cyclones are common in summer, but are usually weaker than winter storms. 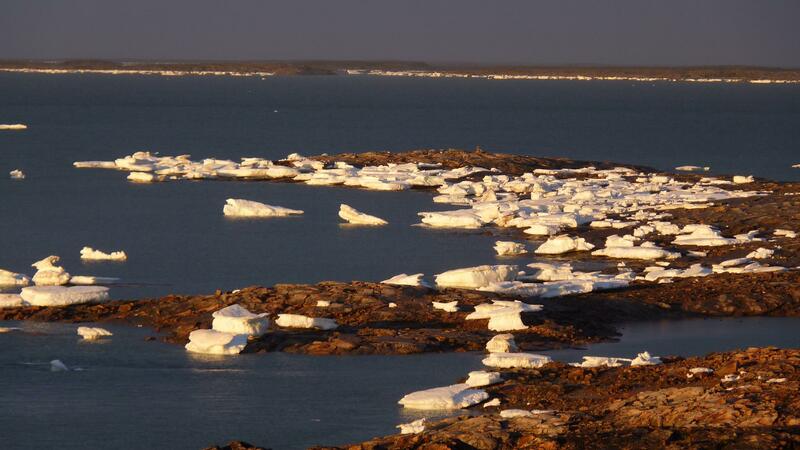 The number and strength of Arctic cyclones appears to be increasing, with this summer’s storm being greater than any previous cyclone, at any time of year. 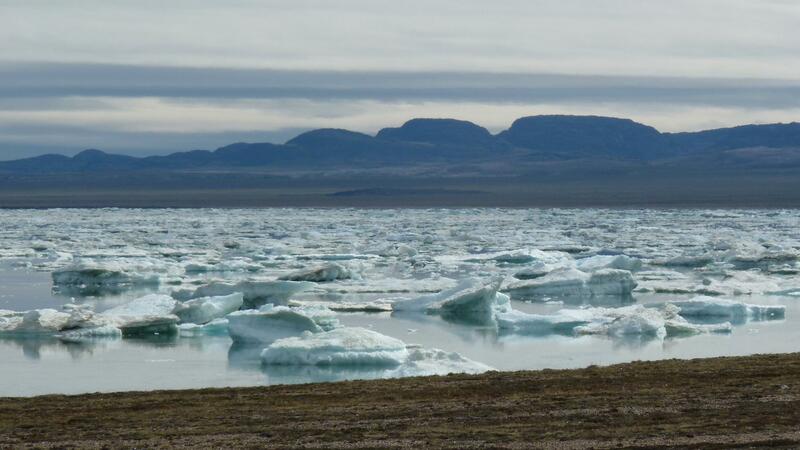 That storm contributed to a massive break up of Arctic sea ice and that ice has now reached the lowest levels ever recorded. 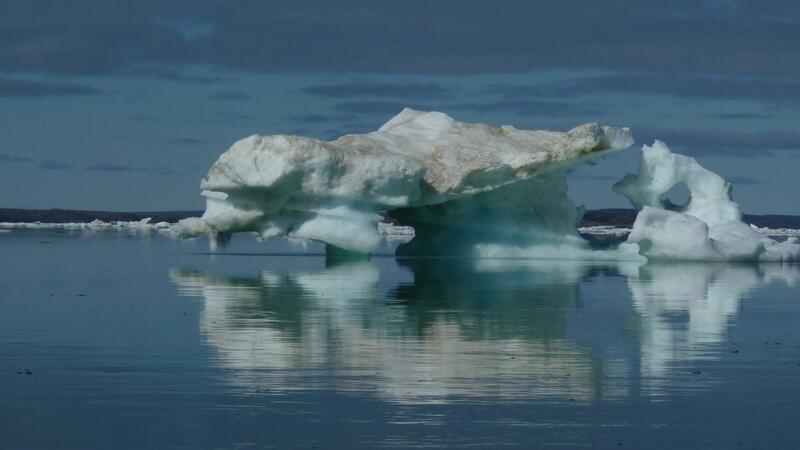 It is believed that even without the storm, the ice was becoming thin enough that the same would have occurred, regardless. 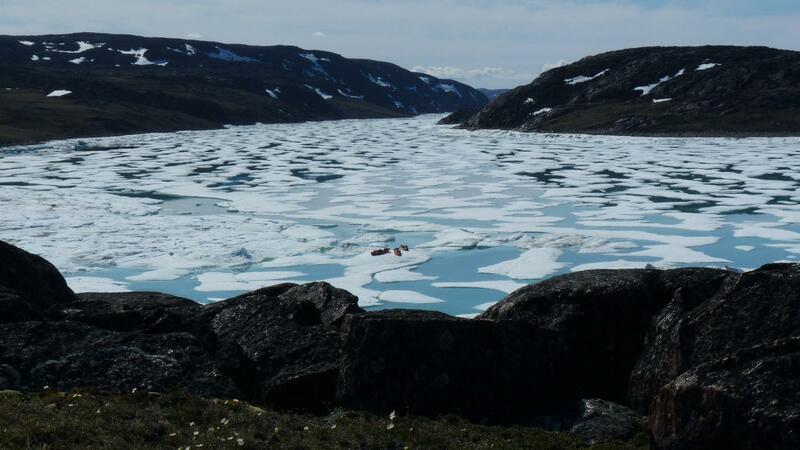 At the moment it isn’t entirely understood why there has been an increase in severity of Arctic cyclones, but it is believed that climate change has contributed to retreating Arctic ice, warming the Arctic Ocean in the process. 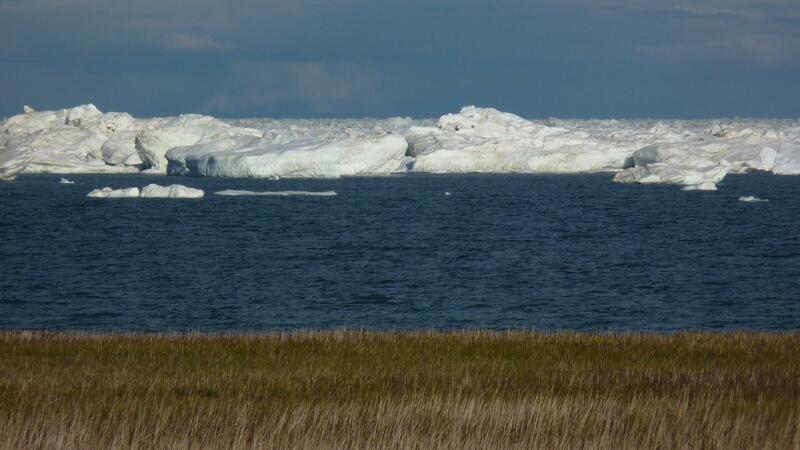 This provides more energy and moisture to support cyclone development. 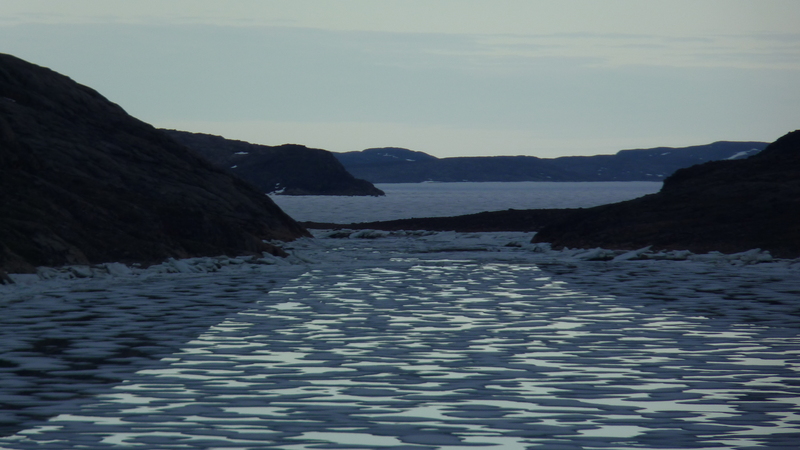 In any case, it becomes circular – the more open water, the more cyclones; the more cyclones, the more open water. 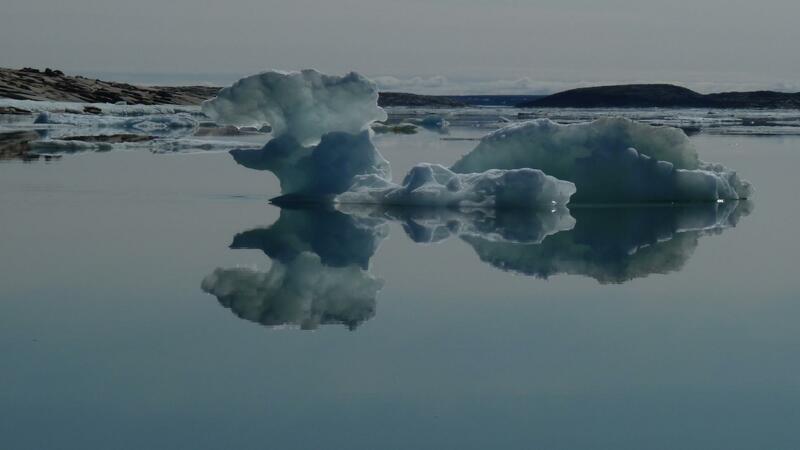 Arctic ice plays an important role in ameliorating earth’s temperature by reflecting energy back into the atmosphere; open water does just the opposite, it absorbs the energy from the sun and the water is further warmed. 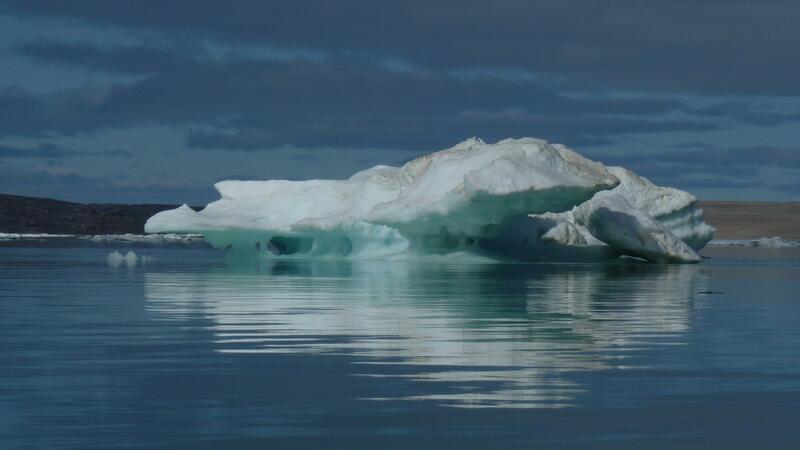 This has potential catastrophic implications for the world, not just the Arctic. 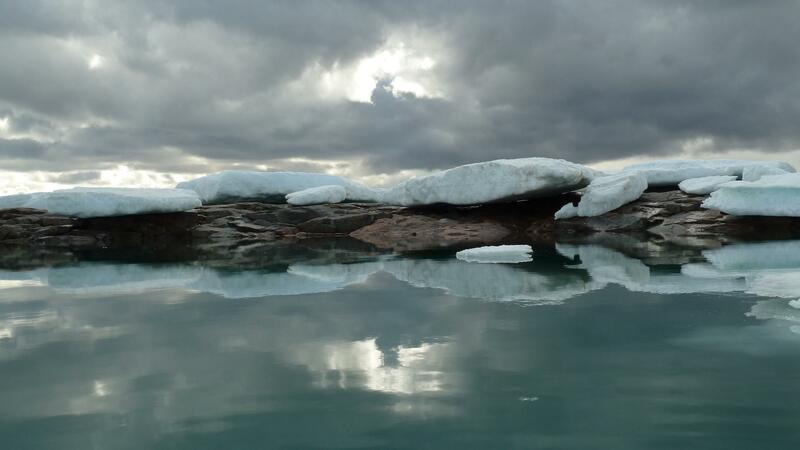 Even though we had more than enough ice to deal with this summer, there may be a time, and a time that is quickly approaching, when the lack of Arctic ice becomes a serious problem, and not just an opportunity for companies to make more money drilling for oil. 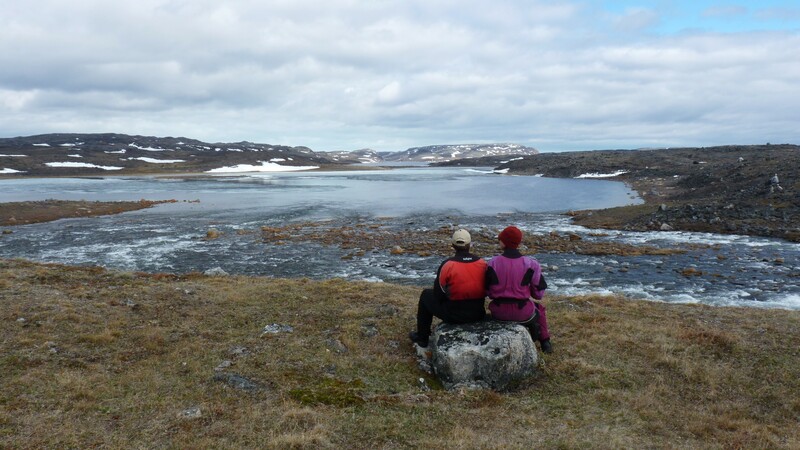 We have had a wonderful time over the past six years, being very fortunate to spend considerable time in areas we truly love. 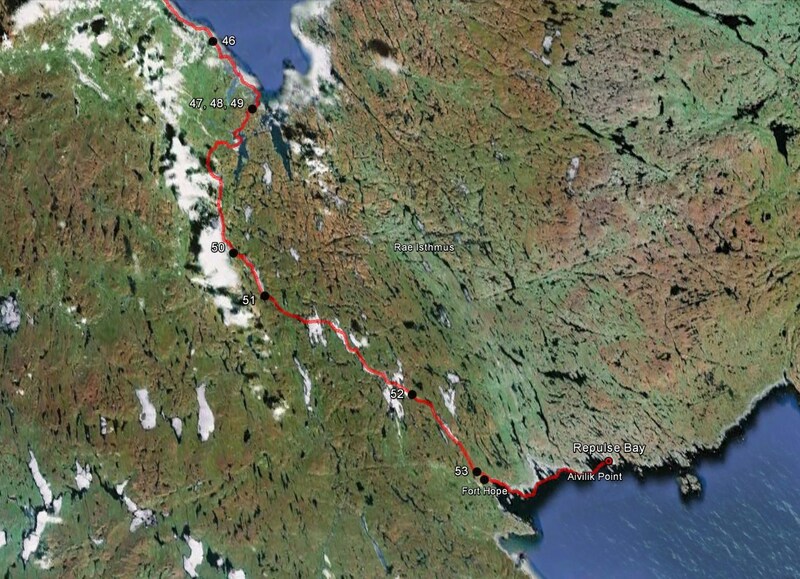 We traveled over 11,000 kms in the course of our travels, each kilometer different from the last. 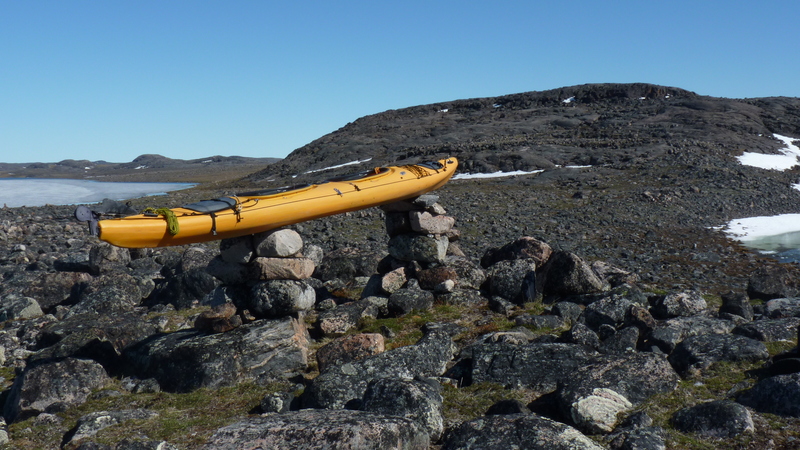 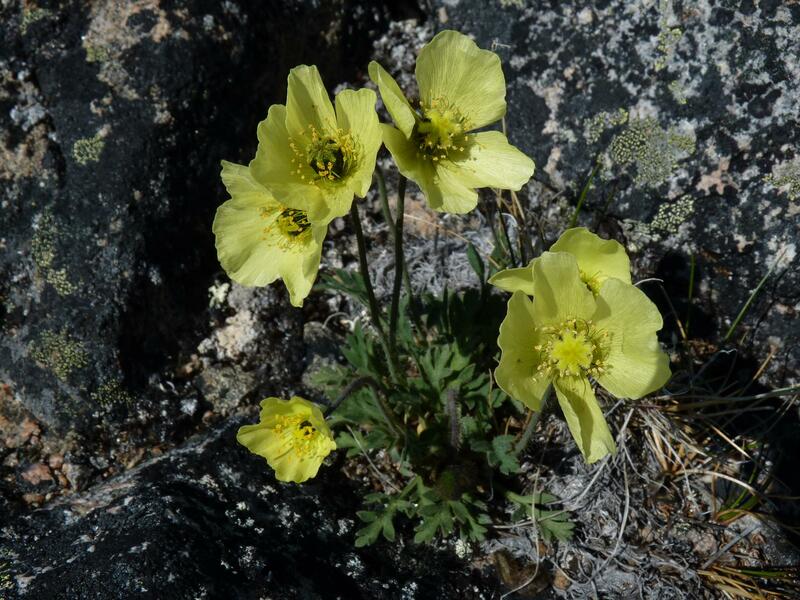 We thank Kokatat, Mountain Equipment Coop and the Royal Canadian Geographic Society for providing some financial help in the final year of our journey, and especially the many people who showered us with kindness and help along the way.